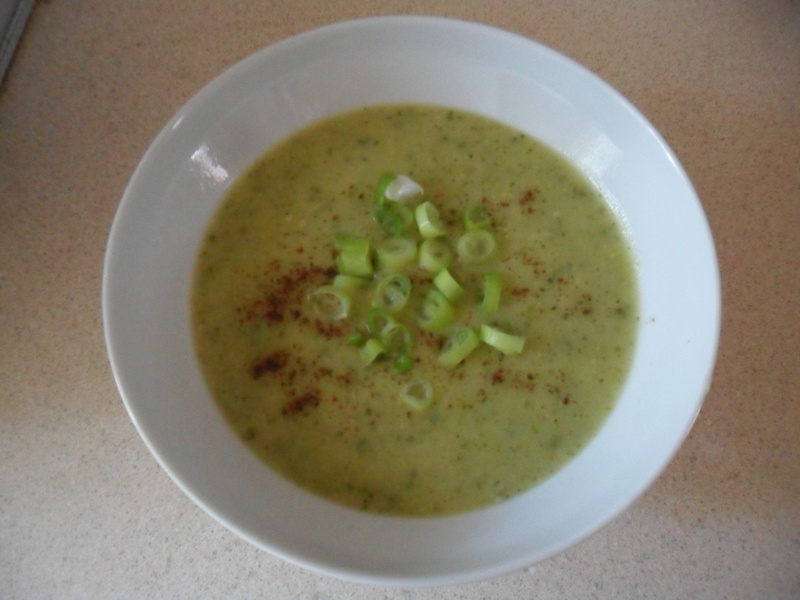 Today I thought I would write about freezing our excess crops. 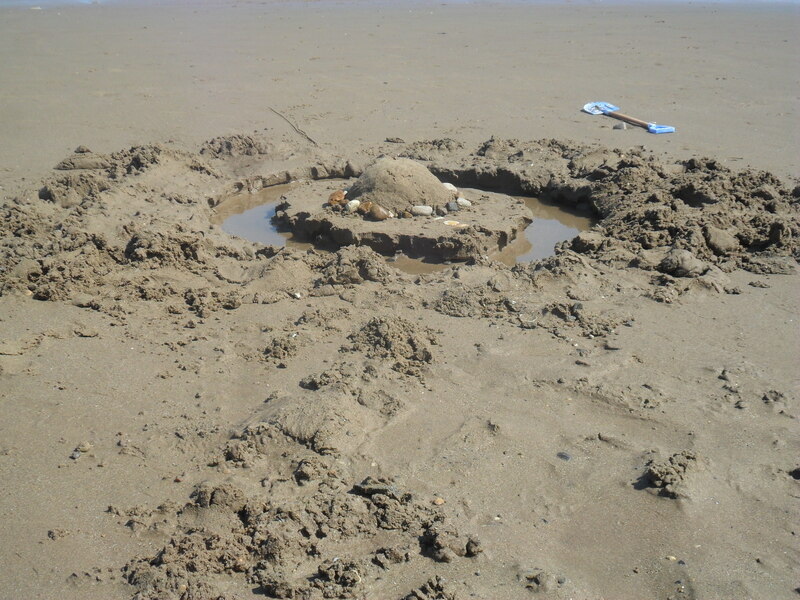 Last Friday I wrote about ‘Simple Living In The Modern day’. The freezer is a modern day appliance that makes life a lot easier for us, as we now have the luxury of being able to bulk buy, cook ahead, batch bake and preserve our excess crops (or bargains from the supermarket). The first electric freezers were manufactured in 1945, but I remember it wasn’t until the 1970’s that my family had one. I remember at this time, ‘freezer centres’ sprung up all over the place. 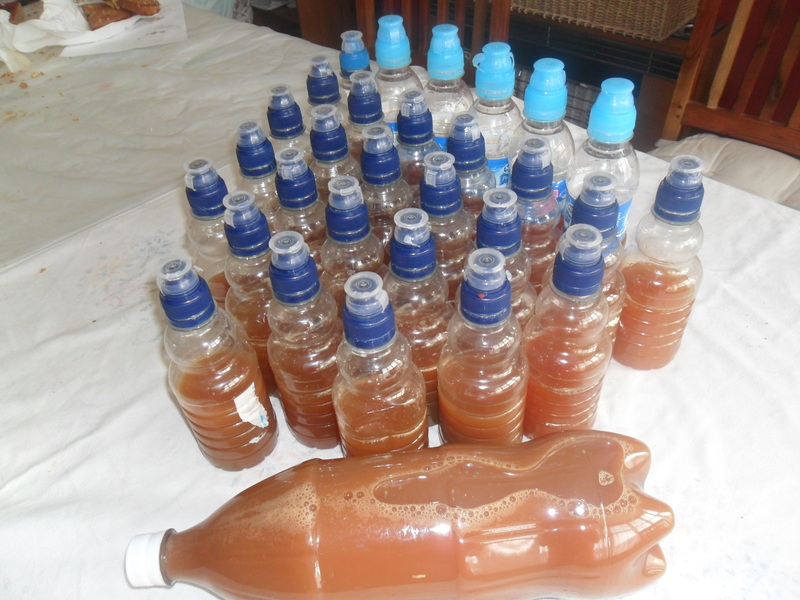 This revolutionised the way we preserve our food, as we can now store most crops in our freezers. 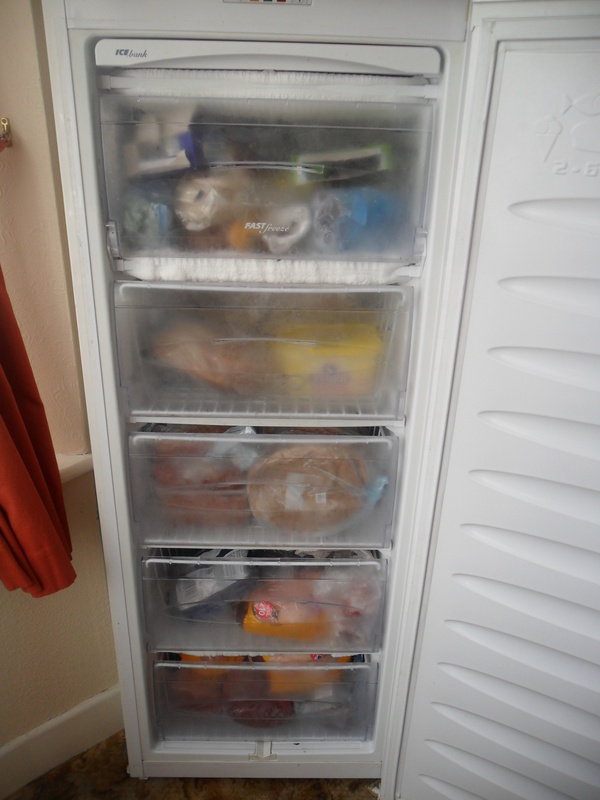 In fact we have three freezers that are usually fit to busting at this time of the year. The only two drawbacks with freezers after paying for the freezer in the first place, is they run on electricity, which costs money and if they lose power for long periods (i.e. 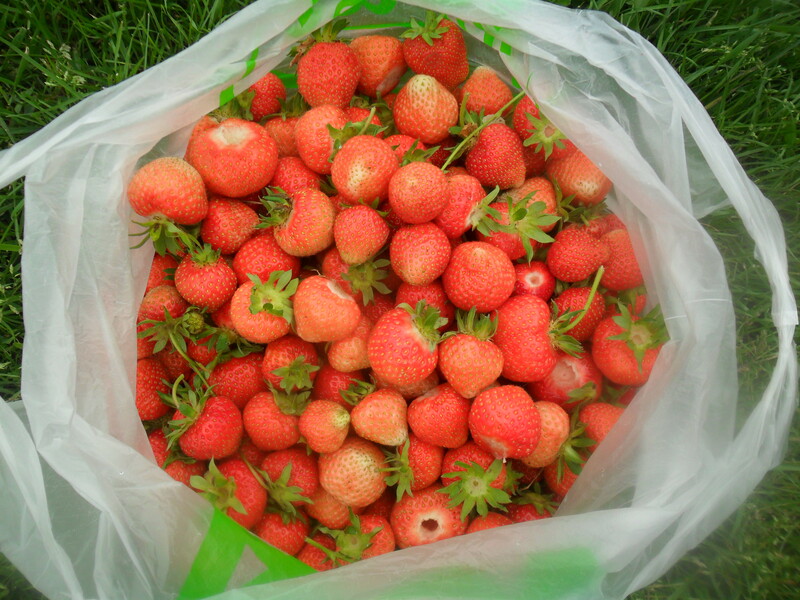 in more rural areas in winter) the food inside will perish. I find the amount I save by using my ‘A- rated’ freezers to preserve my crops, outweighs how much it costs to run them and I am lucky that we live in a town as so far we haven’t lost power for more than a few hours at any time. In event of a power failure, a full freezer should stay frozen for up to 24 hours, provided you don’t open it to check, as warm air will speed up the thawing process. A half full freezer should stay frozen for up to 12 hours, but it’s important you check your own freezer manual. I have now learnt something new. As regards to fruit, I never blanch my excess fruit and we have fruit all year round to add to yoghurts, ice-creams, pies etc. though it must be noted it does go soft and a bit mushy when it’s defrosted but it’s fine to eat. 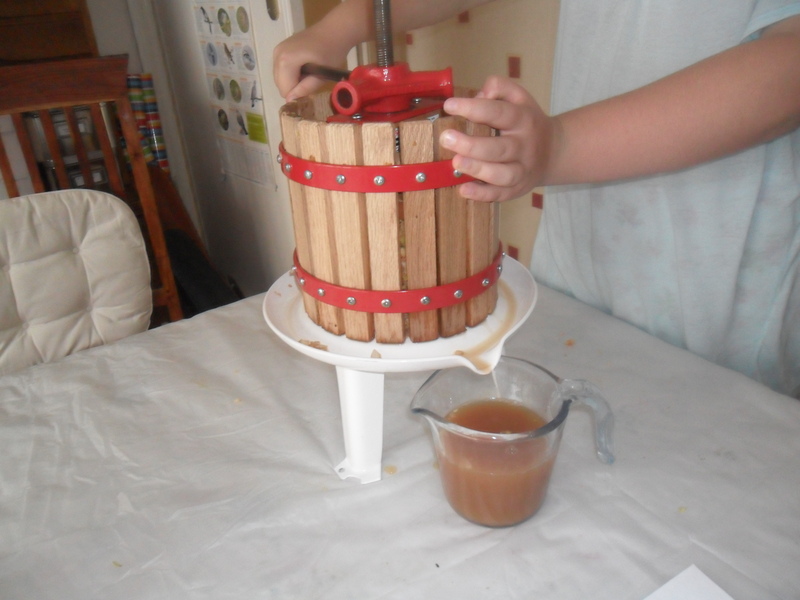 The only exception to this is apples as they go brown if you freeze them without blanching (though I have frozen bags of un-blanched crab apples, washed, top and tailed ready for crab apple jelly and they work fine). 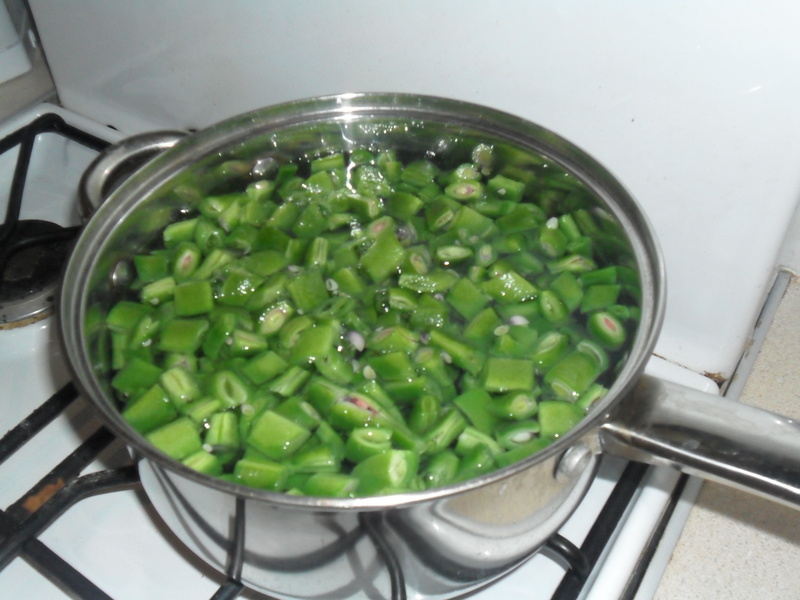 …Add your vegetables to a pan of boiling water and then bring the water back to boiling point again and then boil the vegetables for the recommended time (usually 1 or 2 minutes depending on size and particular vegetable). 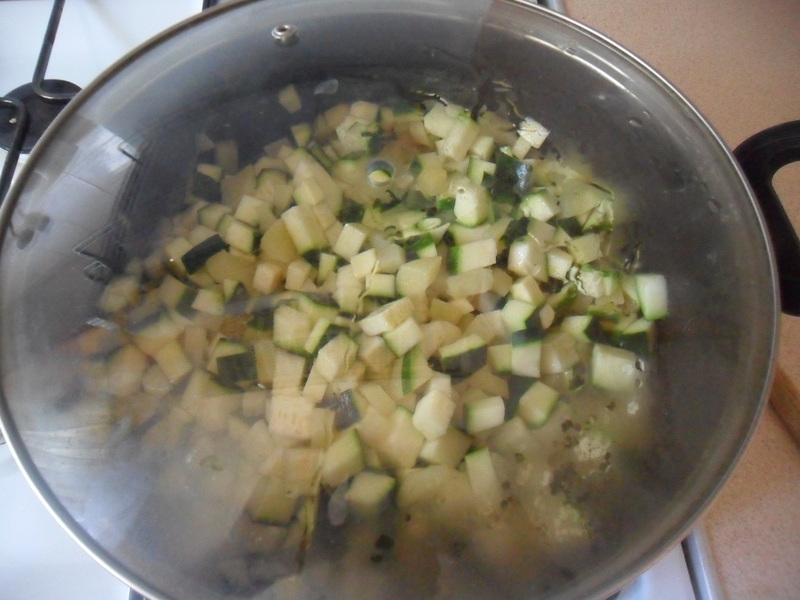 Drain the vegetables and immediately plunge them into very cold water, to stop the cooking process. (I have a freezer book that tells me how long to blanch each vegetable for, but you can find the recommended blanching times on the internet these days). 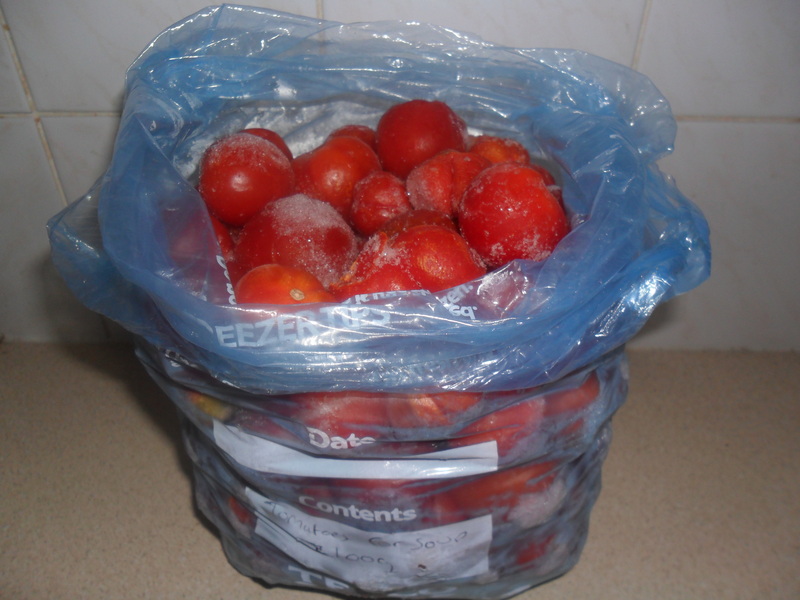 This is a way to stop all the vegetables in a freezer bag from sticking together in one great big lump, so it’s easy to remove a few at a time e.g. 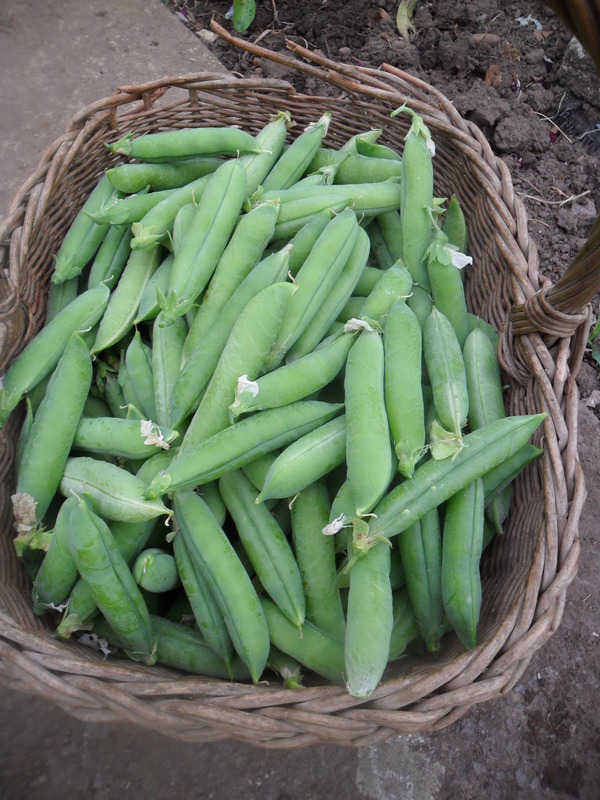 a portion of peas when you need them. 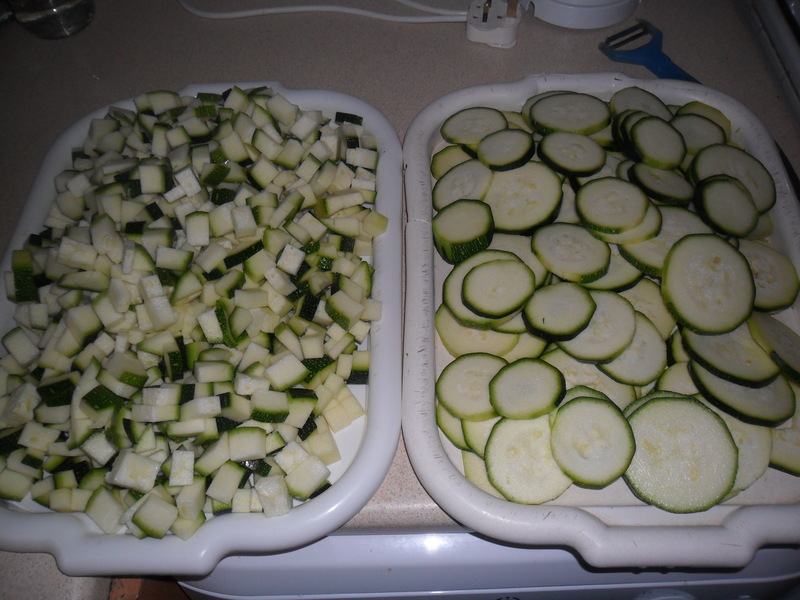 When you have blanched your vegetables, lay them on a tray and freeze them. When they are frozen, remove them from the tray and pop them into a freezer bag/container and put them back into your freezer. Nearly every fruit and vegetable can be frozen in some way or another, it’s just a matter of finding out what works best for you. 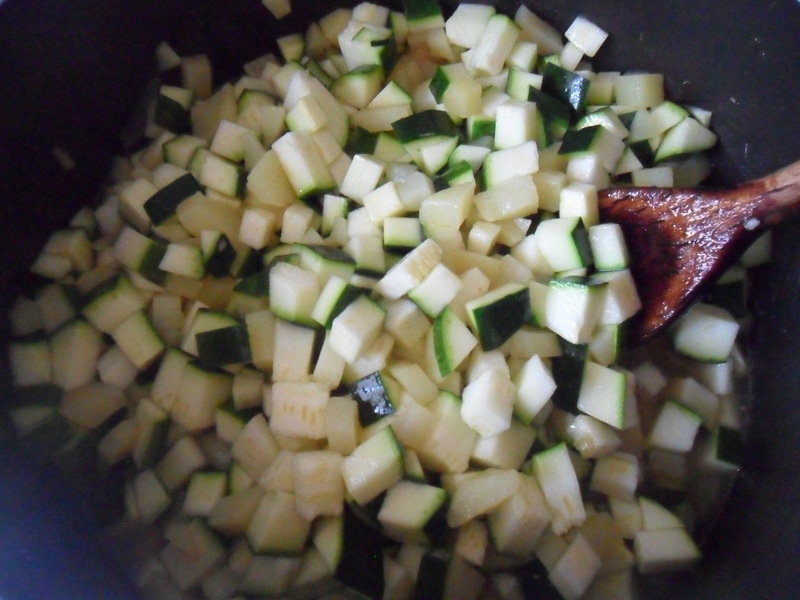 Courgettes can be frozen ready sliced, by open freezing them and then bagged up ready to add to spaghetti bolognaise, pasta sauces etc. 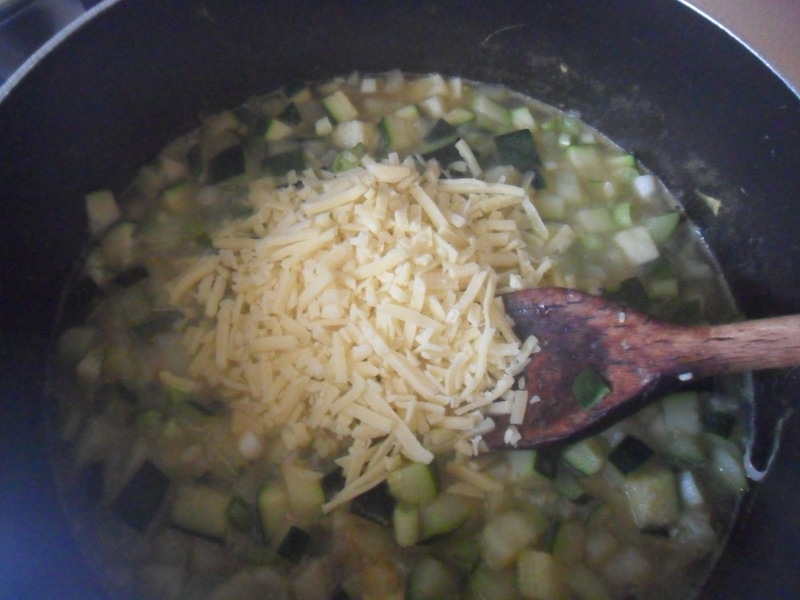 or they can be grated and bagged up in 340g bags, ready to add to cheesy courgette scones. 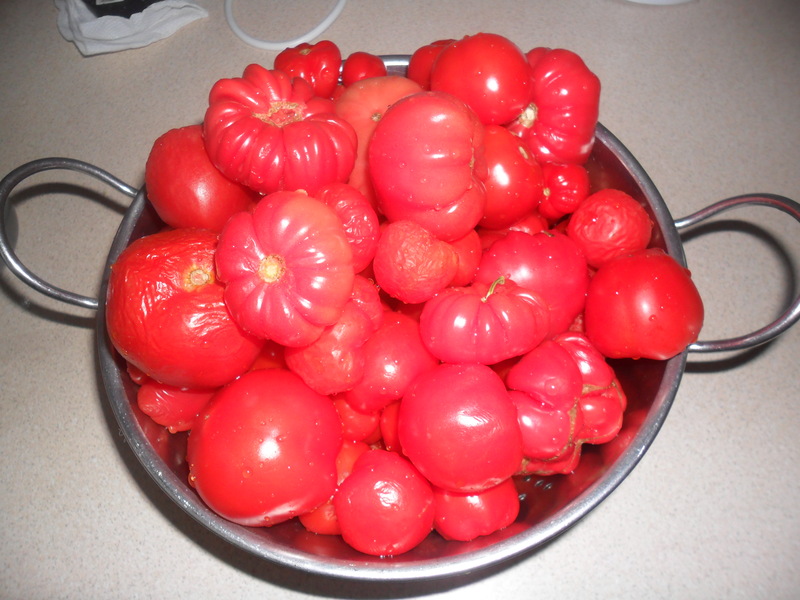 Tomatoes can be frozen in bags (without blanching), ready to make tomato soup at a later day. 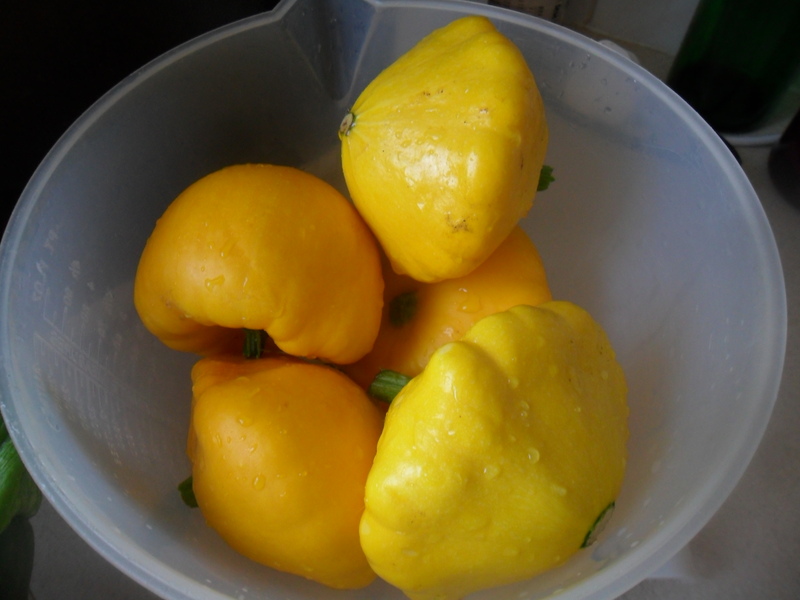 I just wash them and chop them in half and bag them up in the weight required for your recipe. 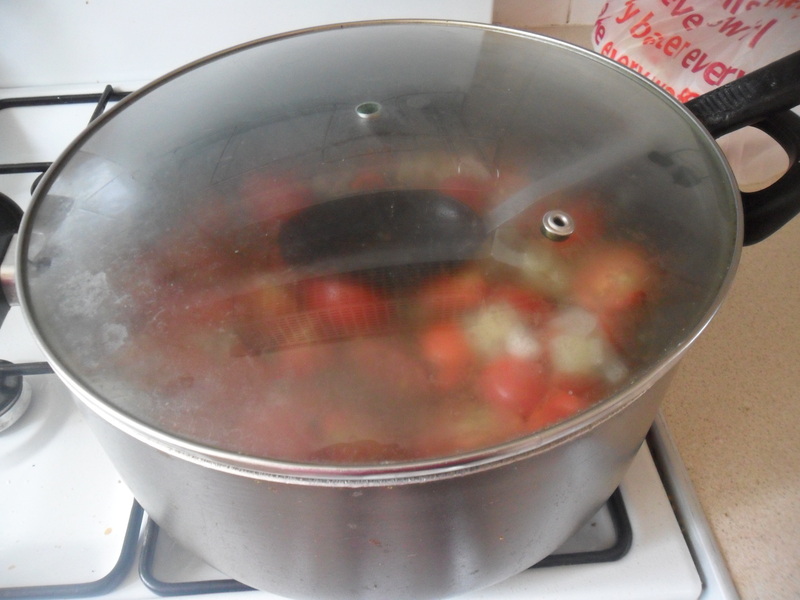 Tomatoes can also be cooked with a little bit of water and then ‘blitz’ with a liquidizer to make a tomato sauce to use in pasta sauces, spag bogs etc. 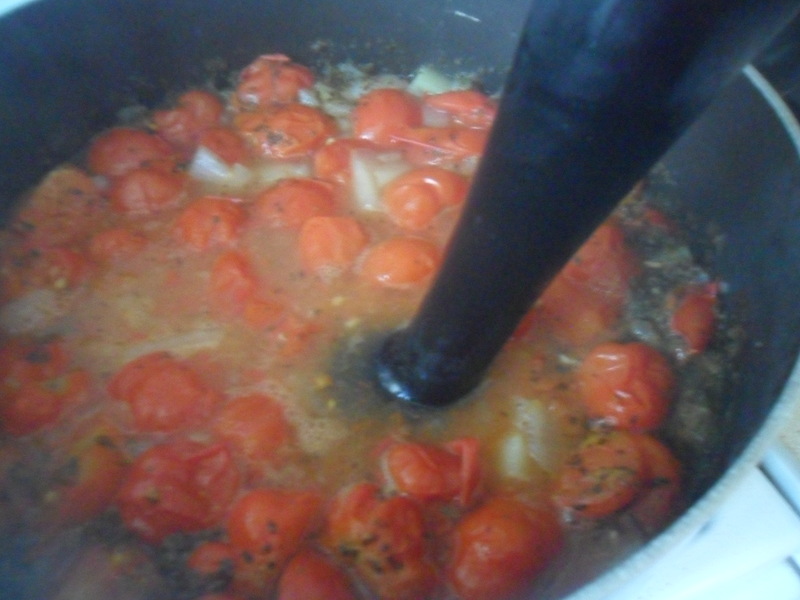 instead of using shop bought passata. 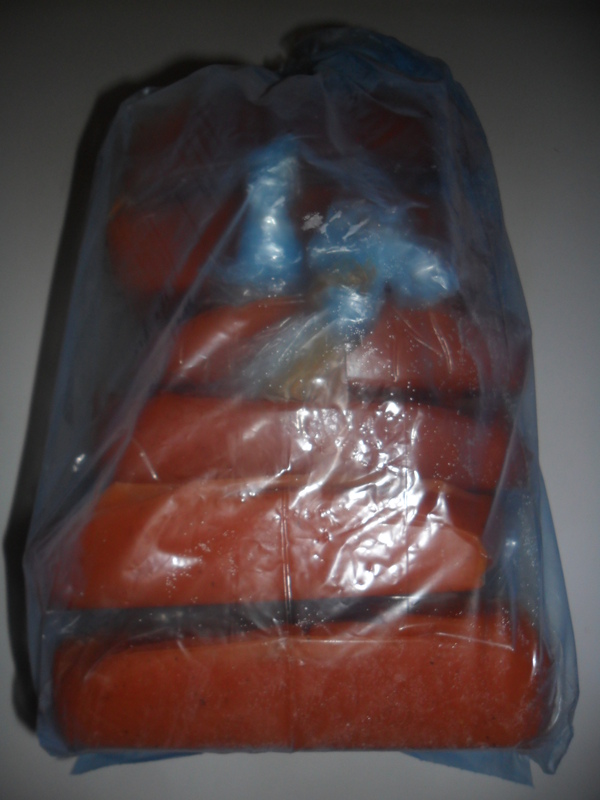 I freeze this in ready weighed out portions of 500 grams and I just defrost it before using. 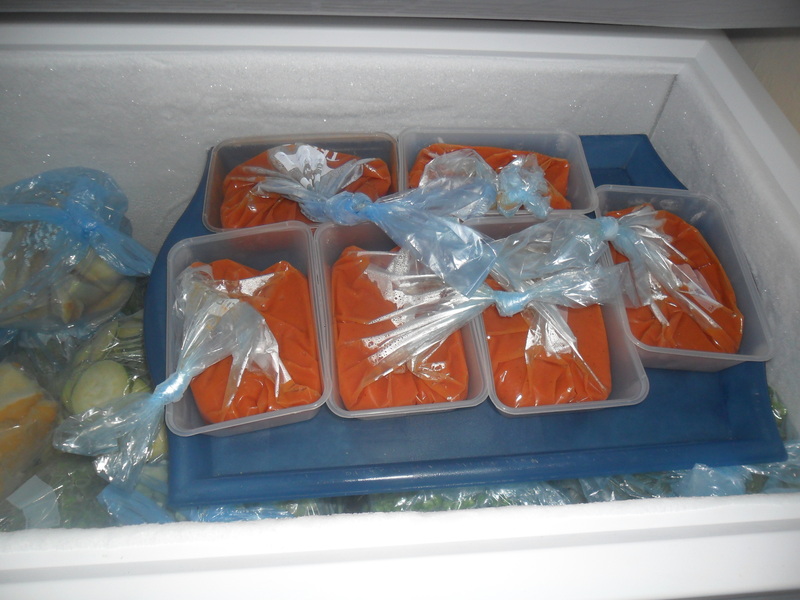 I find pumpkin is better to cook first and freeze in bags ready weighed out. 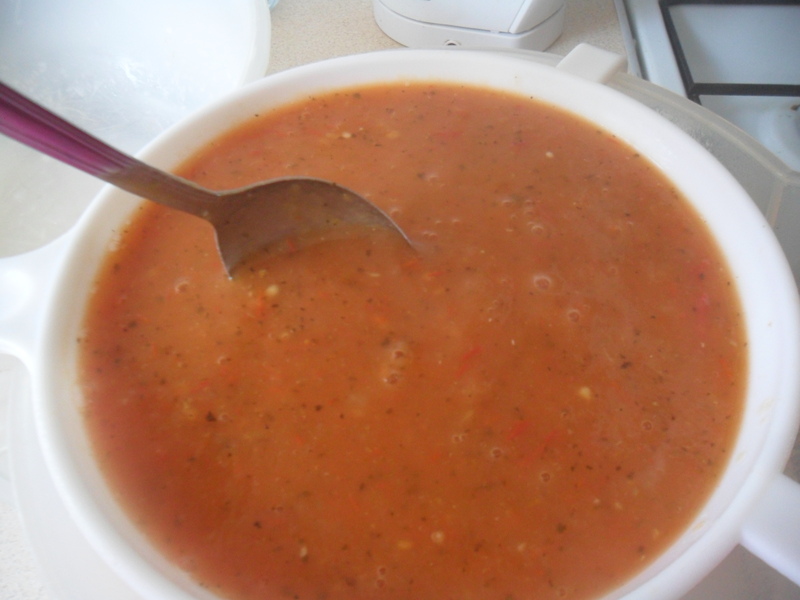 This way it can be added to soups and cakes etc. and it takes up far less room. 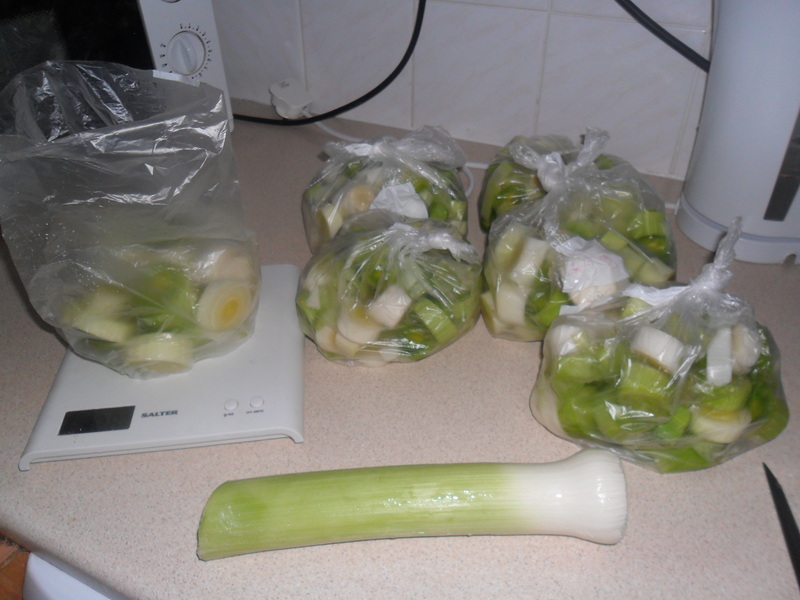 I wash and slice up my leeks and bag them up (again in useable quantities) and then freeze them. 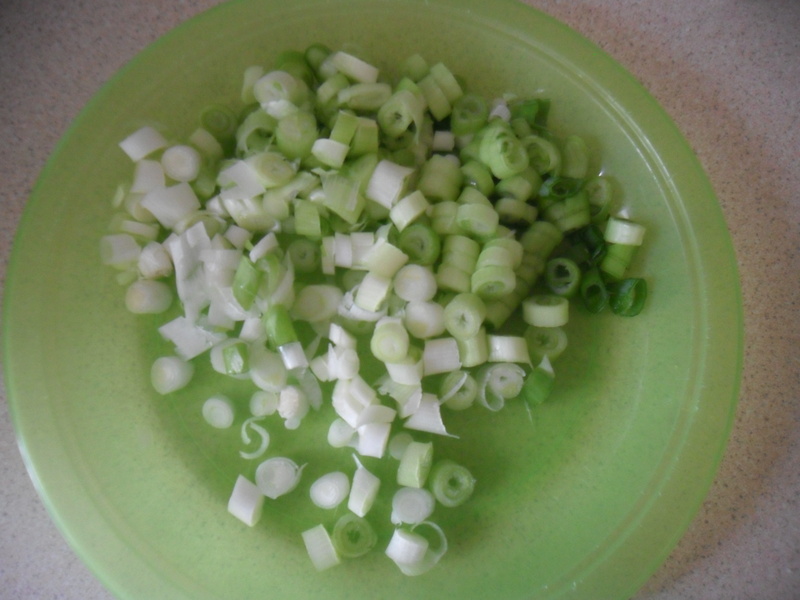 Leeks and onions can make other things in your freezer smell, so I do wrap them up well in newspaper first, to prevent this. 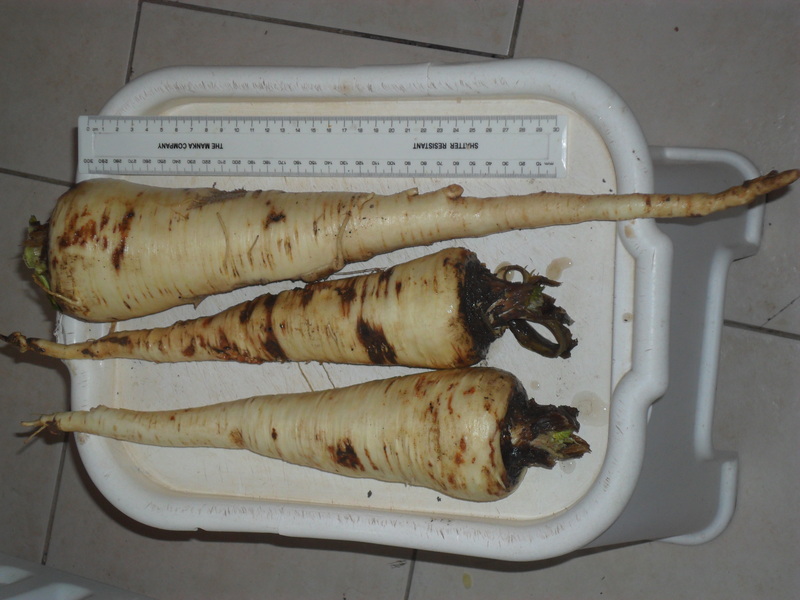 I wash and peel my parsnips and cut them ready for ‘roasting’. 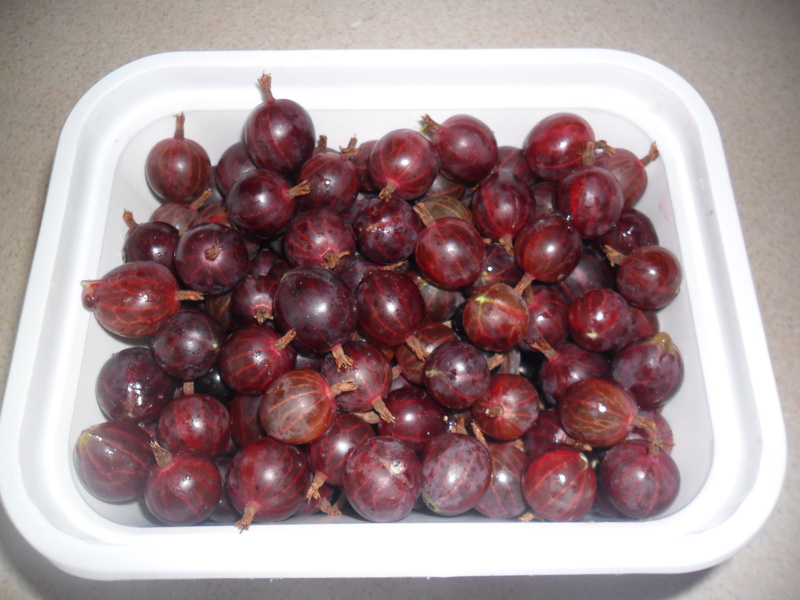 I then open freeze them, without blanching and then pop them into a freezer bag. 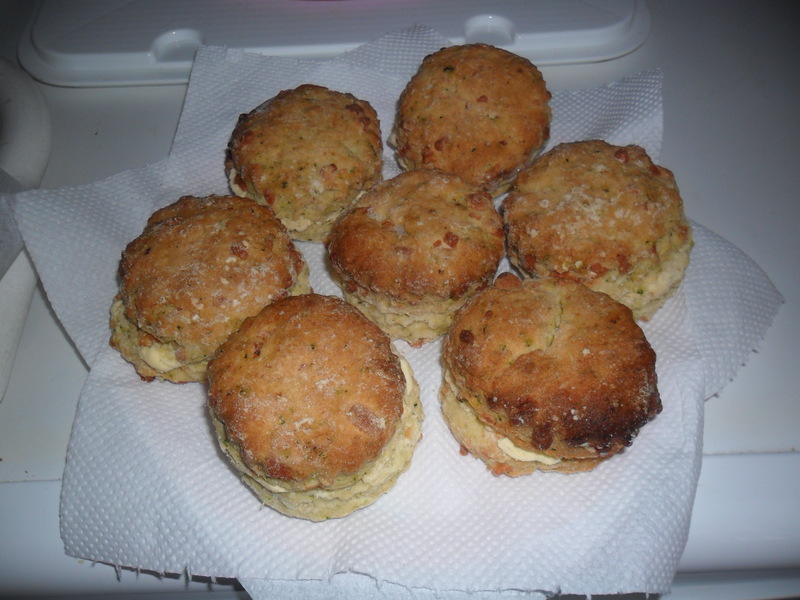 They are great to use straight from frozen and make Sunday lunch easier to cook. 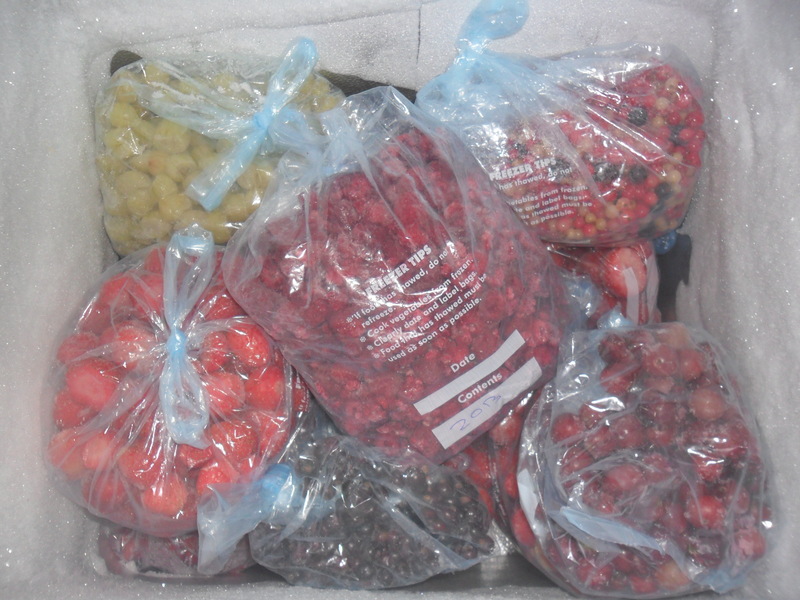 I also quite often freeze excess fruit the day I pick it (e.g. 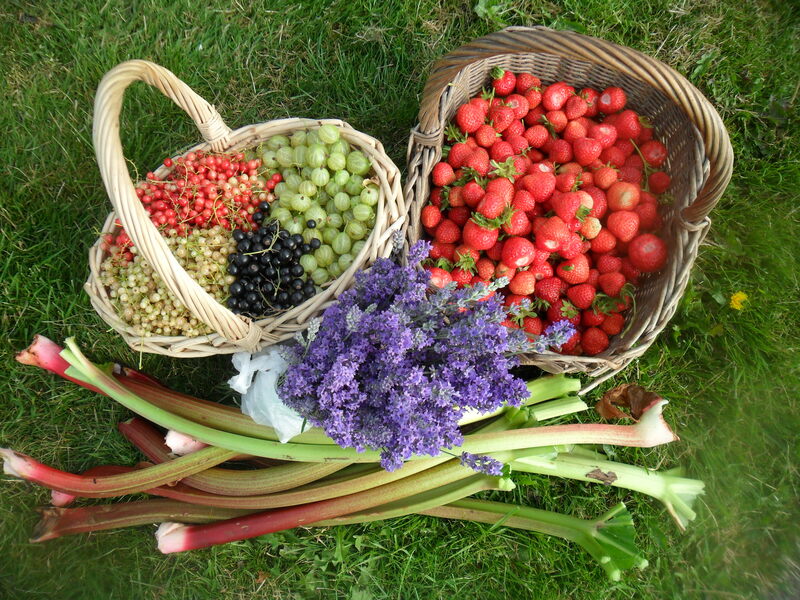 Strawberries, gooseberries, currants, plums, rhubarb etc.). 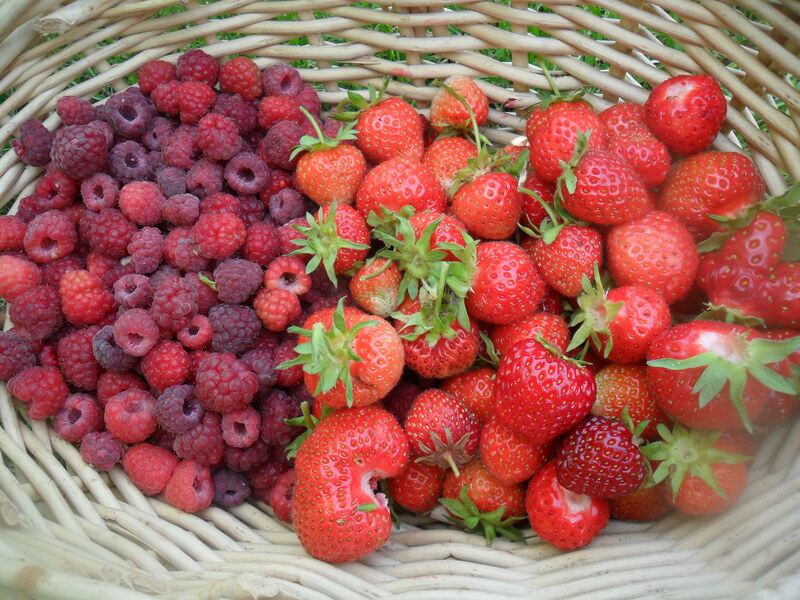 I use the fruit to make jam when I have more time in the winter, by adding the frozen fruit straight into the pan. 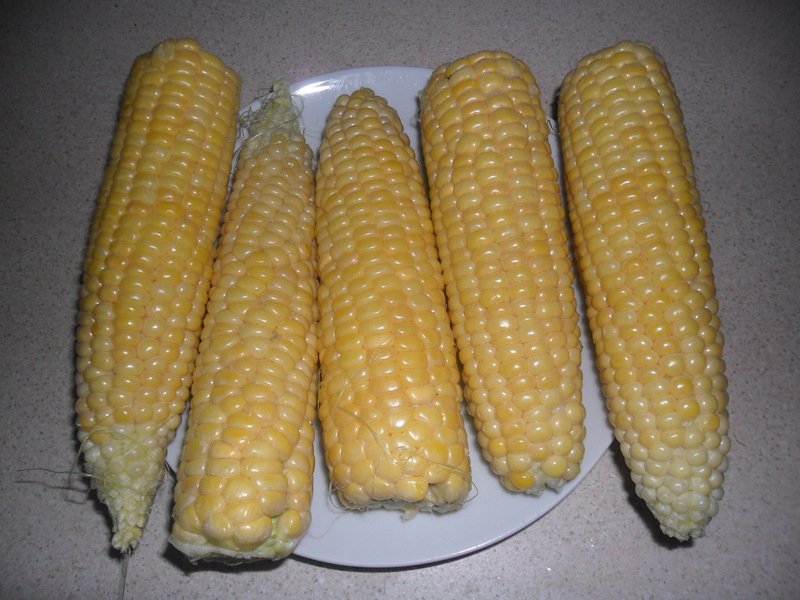 Sweet corn is delicious when it has been picked and eaten within the hour. I blanch my sweet corn whole and freeze it in bags of four or five corn on the cobs. 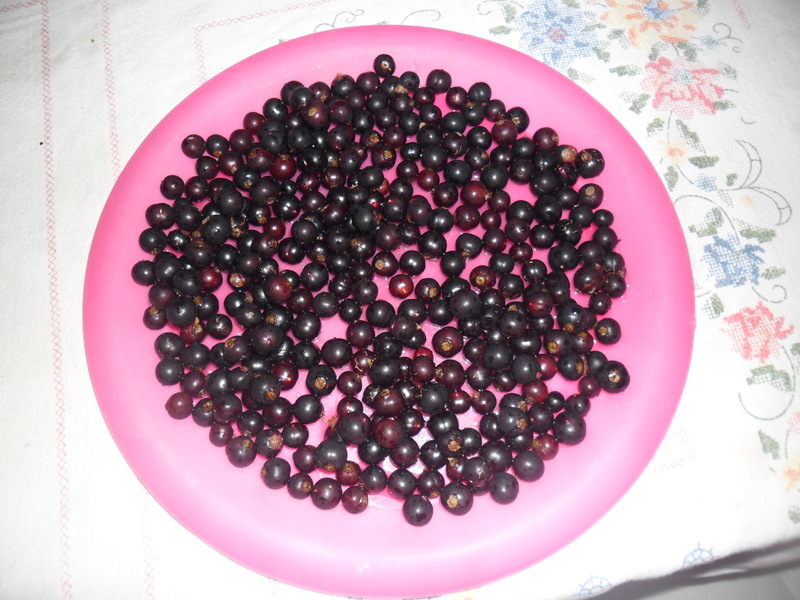 It is lovely to eat this in the depths of winter. 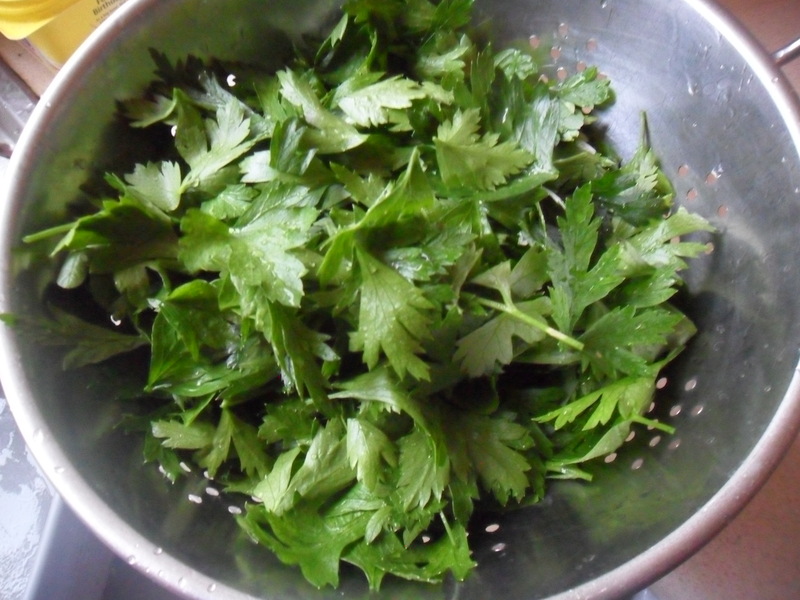 I Trim off the leaves of parsley and wash them. I put the lot in a freezer bag and freeze. I use it from frozen by crumbling it into my meals as I cook them. 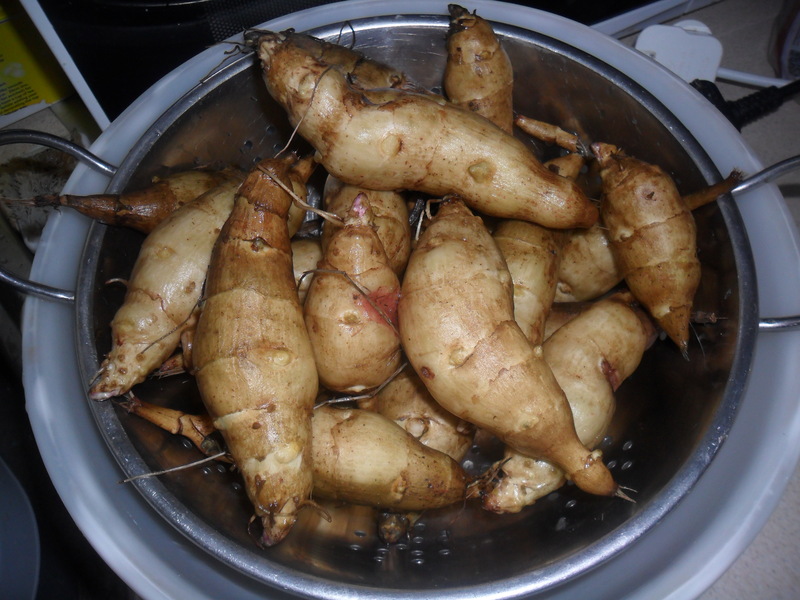 Just before my Jerusalem artichokes start to sprout in March/April time, I freeze them. 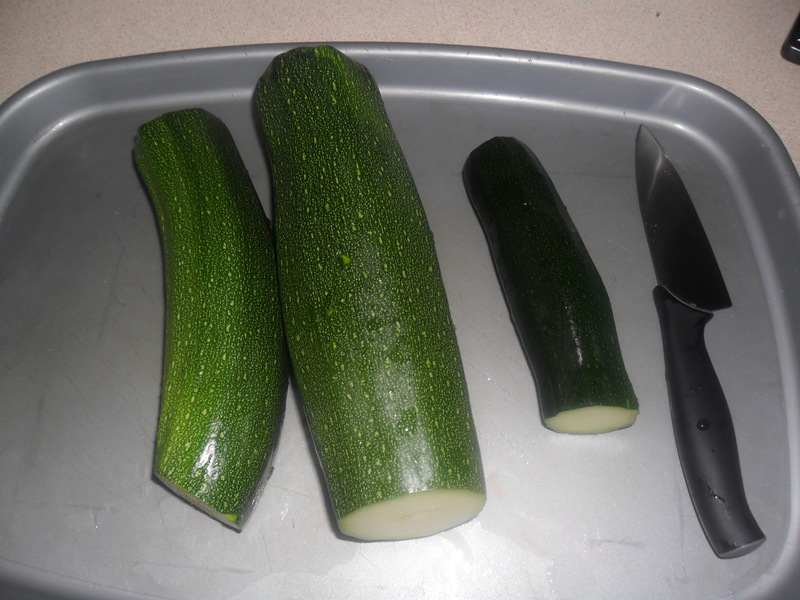 I wash and cut them ready for ‘roasting’. 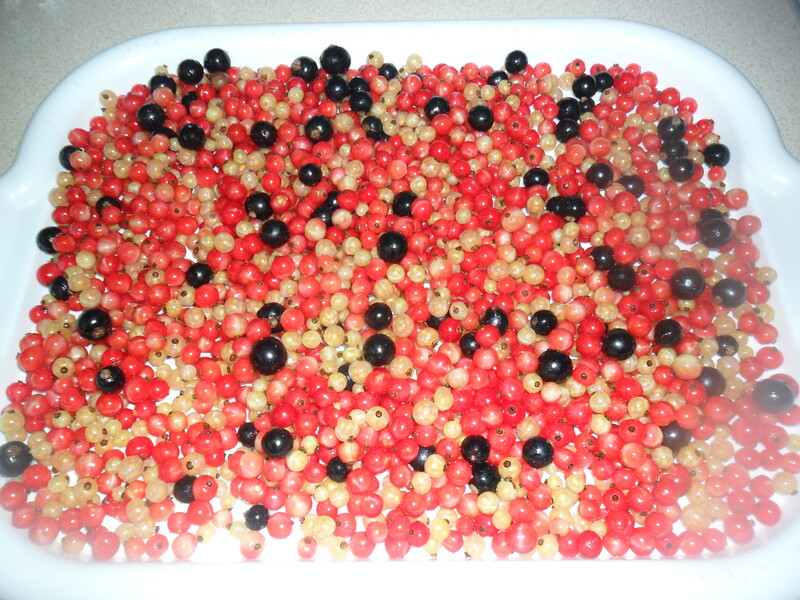 I open freeze them, without blanching and then pop them into a freezer bag. 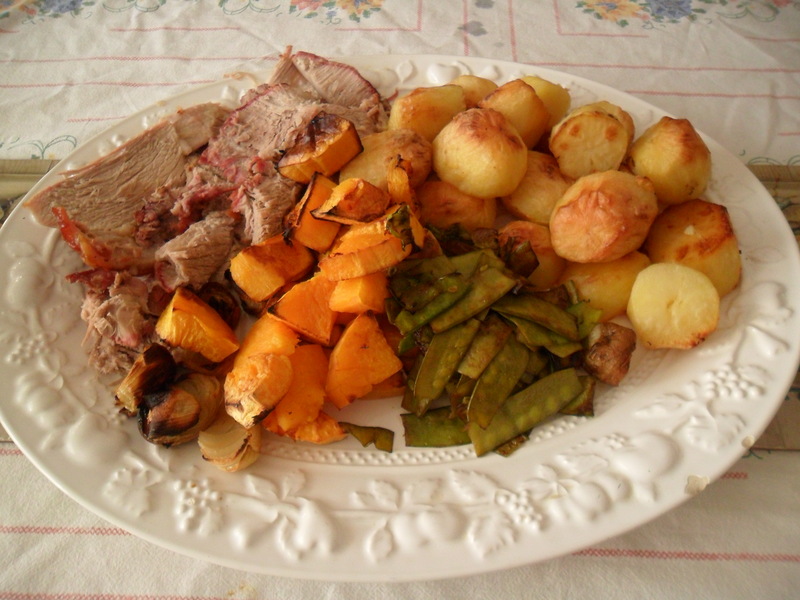 They are great to use straight from frozen and again they make Sunday lunch easier to cook. 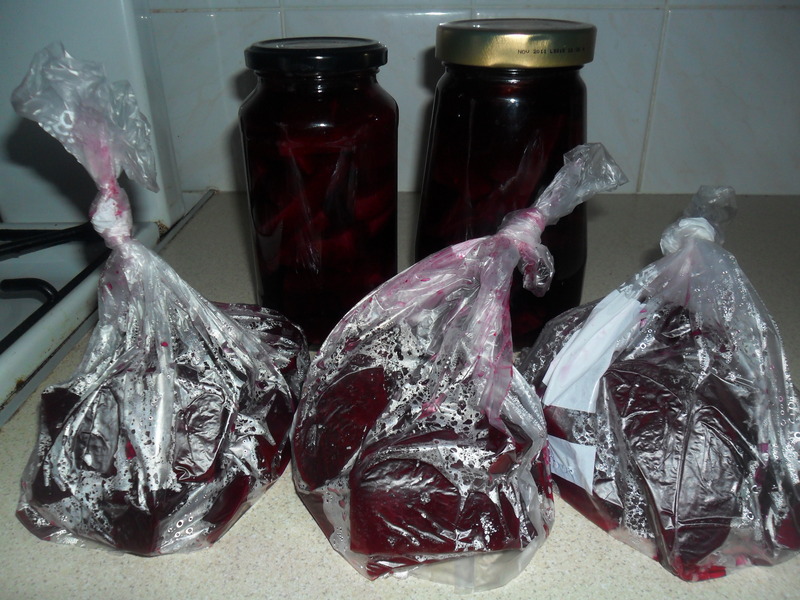 I slice my cooked beetroot and open freeze and then pop it into bags ready for use. 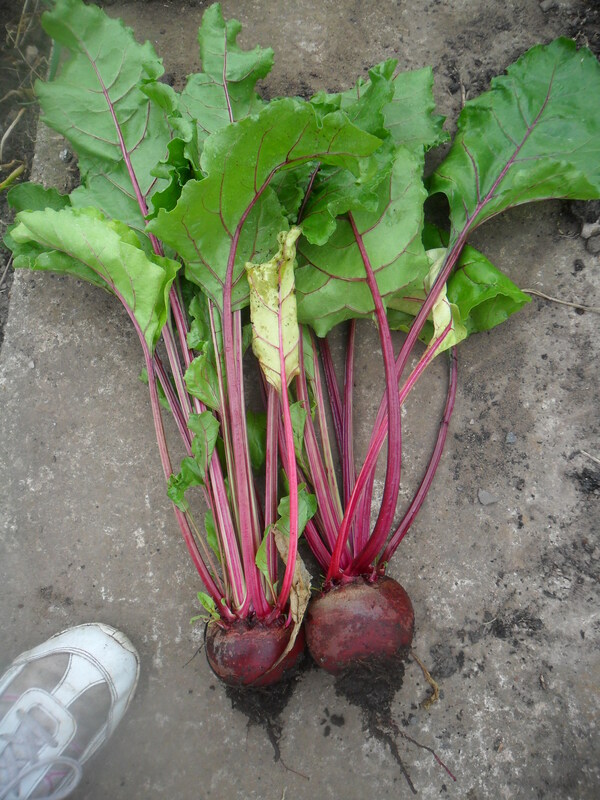 This gives an alternative to pickled beetroot and can also be used in a chocolate beetroot cake. 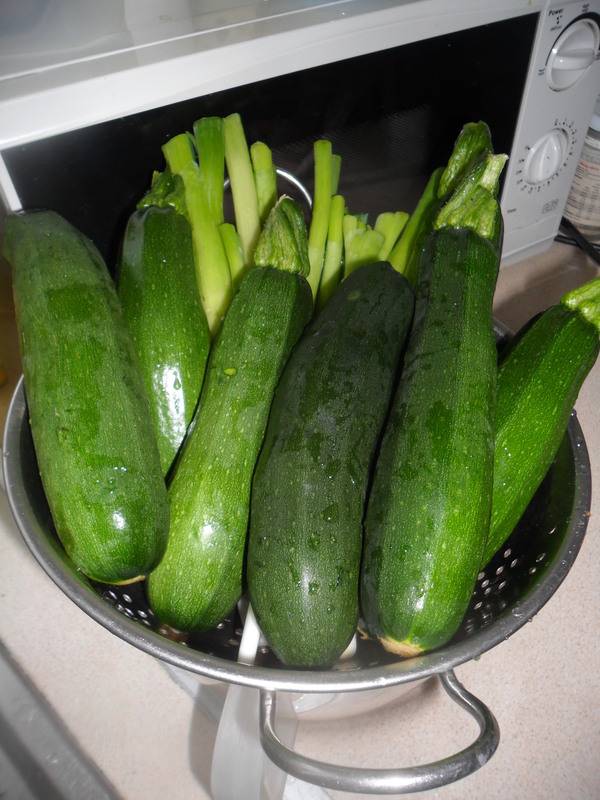 I can honestly say the only fruit or vegetables I haven’t frozen in some way or another is cucumbers and lettuce as they don’t freeze very well. 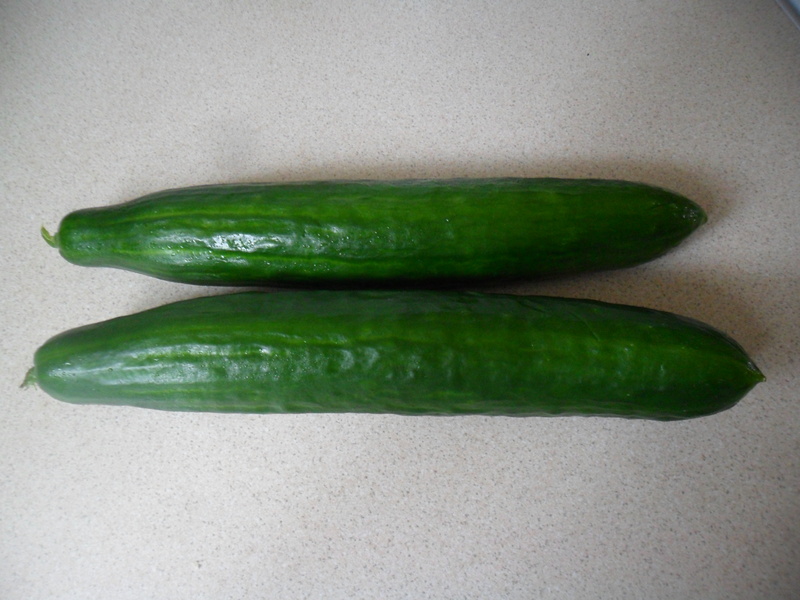 Although cucmbers and lettuce can be used in a gardener’s soup, which so far I haven’t tried to make yet, but with the amount of cucumbers I picked yesterday, I may just have a go! 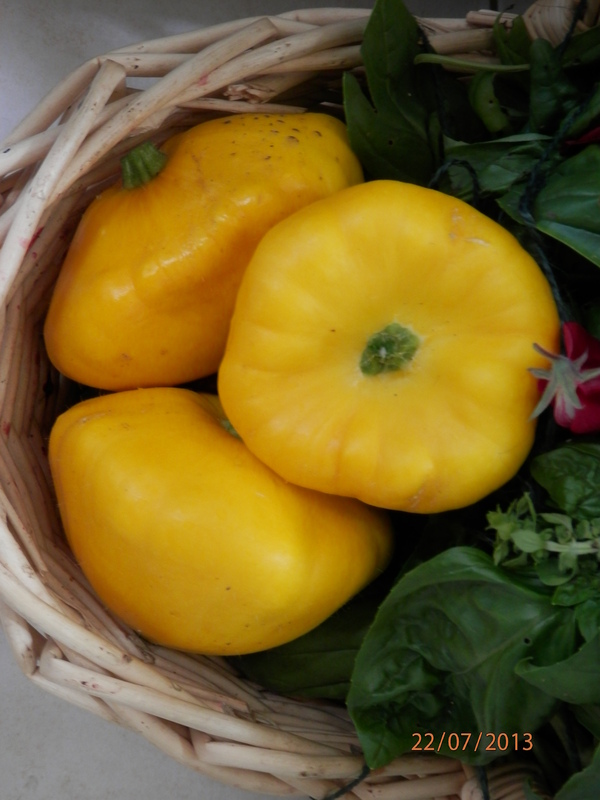 I couldn’t be without our freezers as they make my life so much easier to store my excess produce. 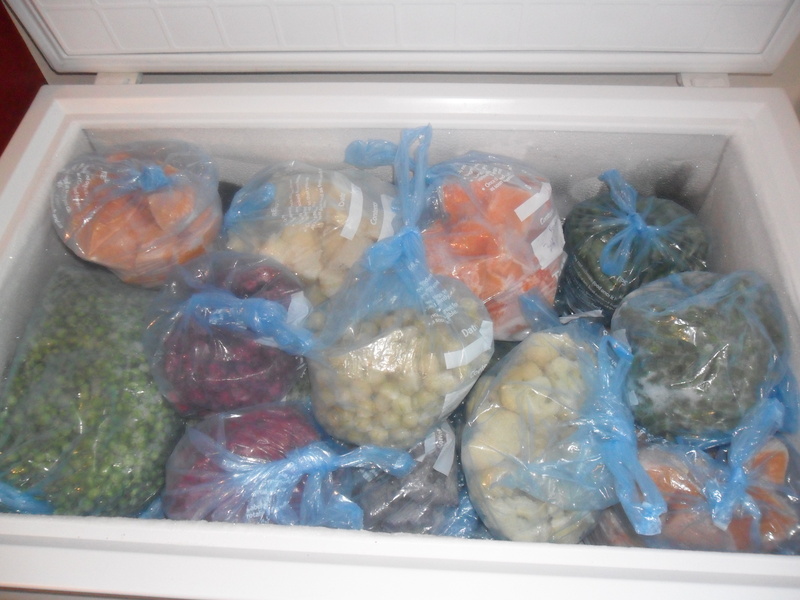 I wonder if anyone reading this has any top tips for freezing excess fruit and vegetables too? If so I would love you to hear from you. 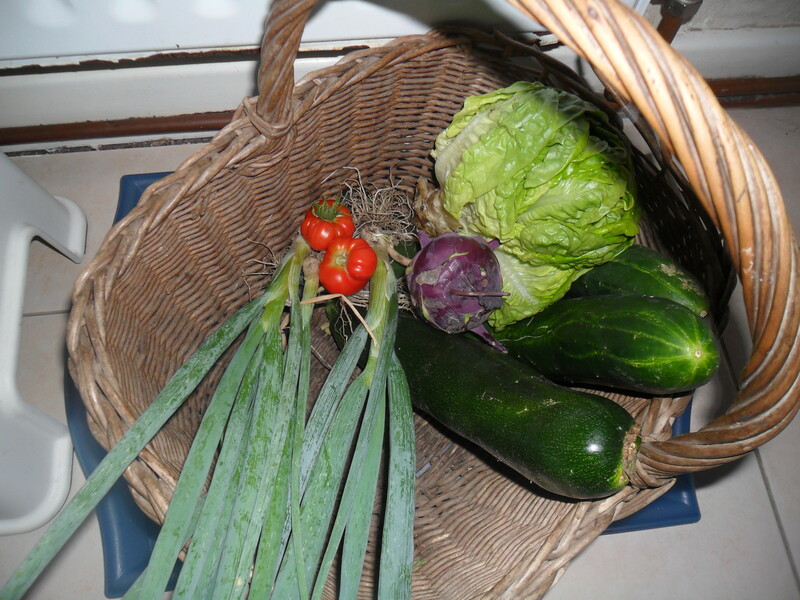 On Monday I will be writing my usual monthly post ‘What to do in the kitchen garden in September’ and I will follow this next Friday with ‘Preserving And Storing Our Crops – Part 3’. 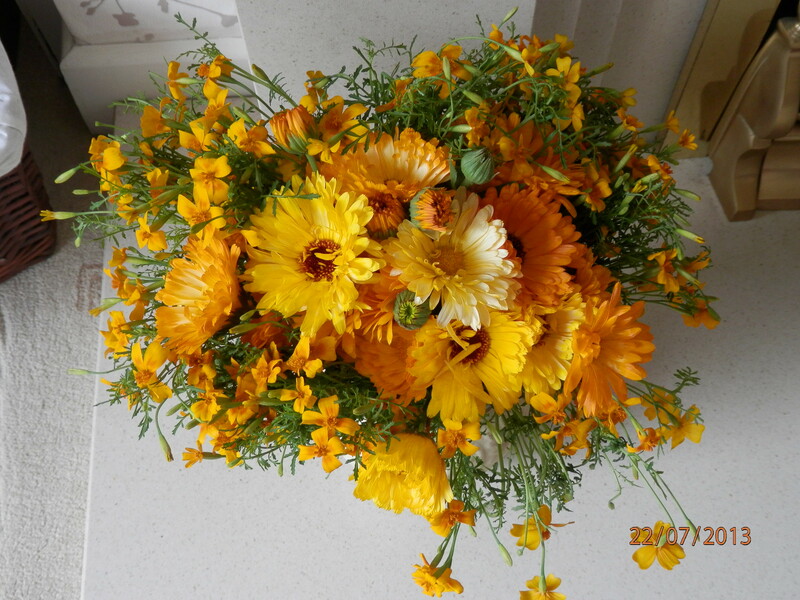 I will be back again on Monday at the usual time. 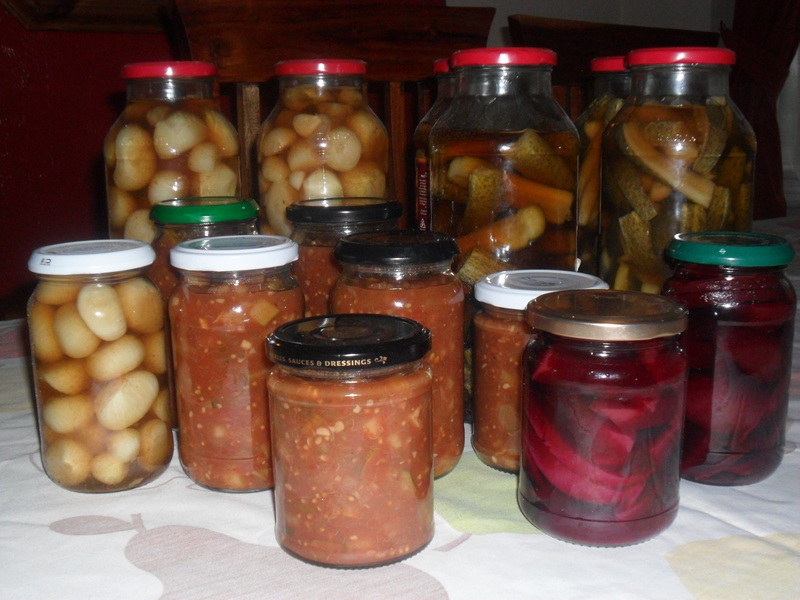 Today and on Friday, I thought I would talk about how I preserve and store my crops. We all plant our seeds and nurture our plants, until they grow big enough to start producing a wonderful harvest and this year really has been a wonderful harvest. 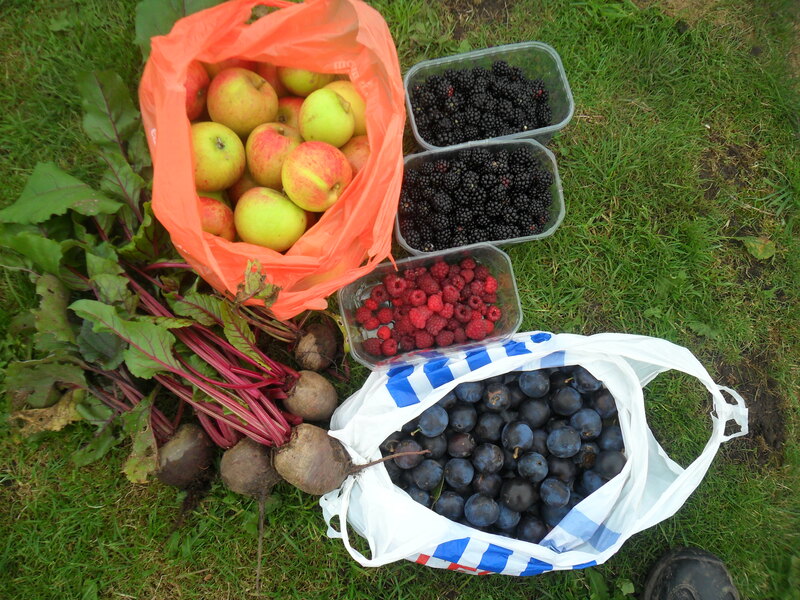 After we have picked and eaten as much as we possibly can, what do we do with the rest so it doesn’t go to waste and end up in the compost bin? 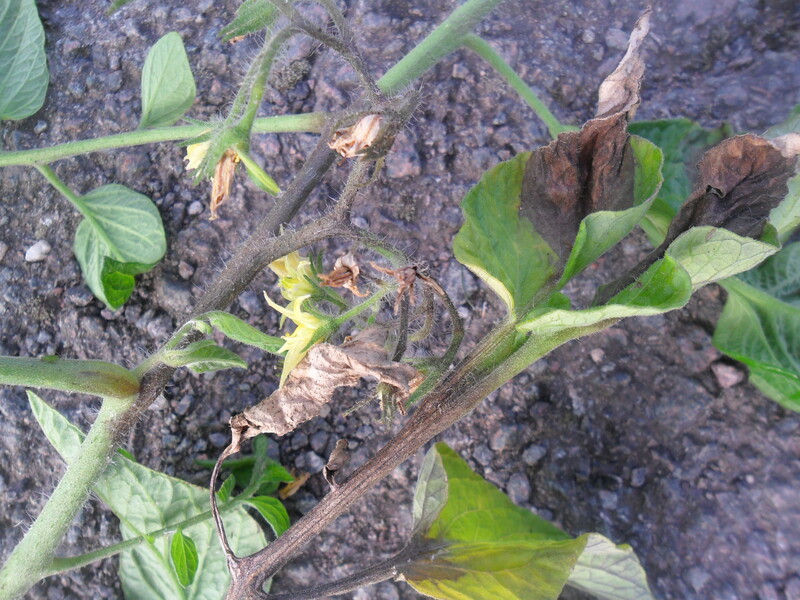 Years ago, if you didn’t preserve your crops then you would possibly starve. 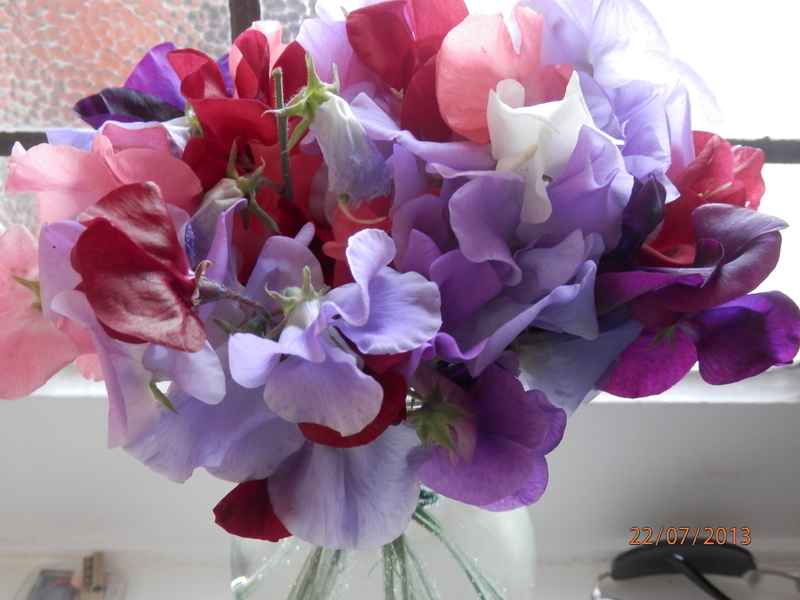 Today it isn’t so life threatening to do this, as we have supermarkets to fill our food gaps. 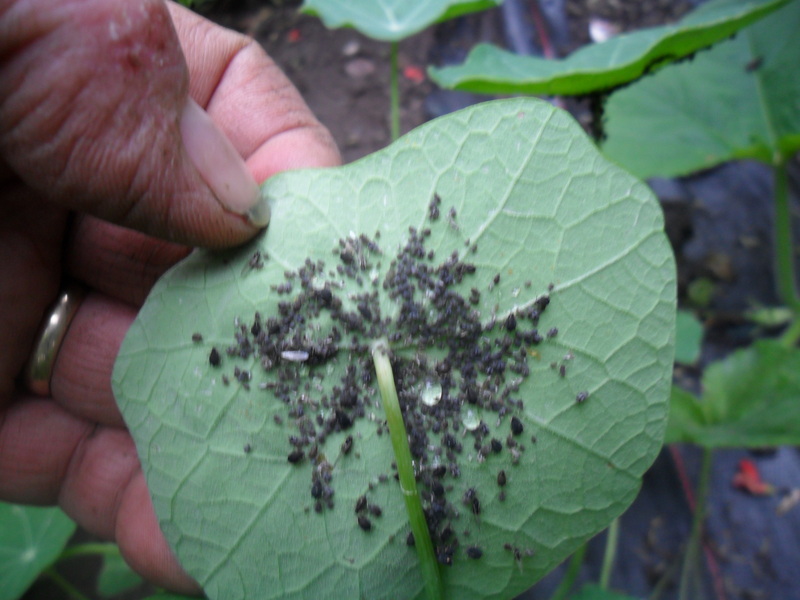 However, the food has usually flown thousands of miles to get to us and doesn’t really taste as nice, as it has been bred for its long shelf life rather than its taste. 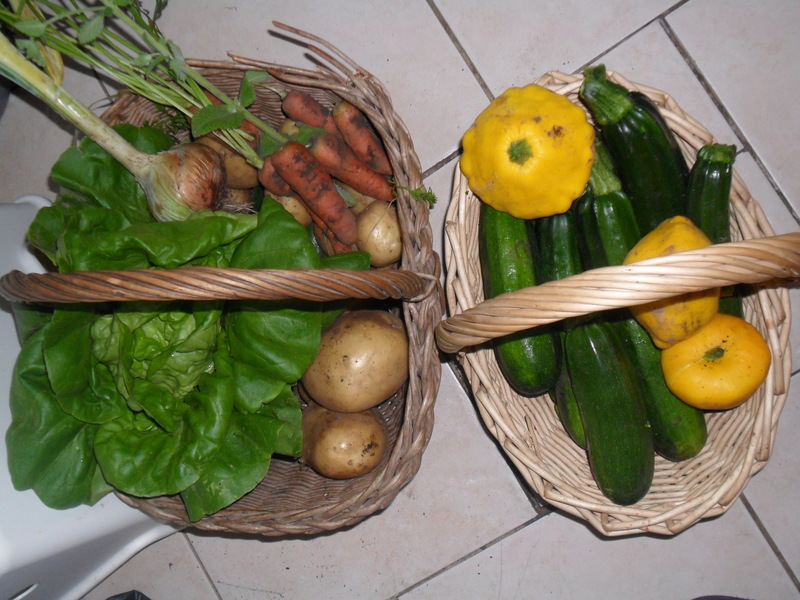 I love growing vegetables for my family and I know it’s far cheaper to grow my own fruit and vegetables rather than buy them from the supermarket. 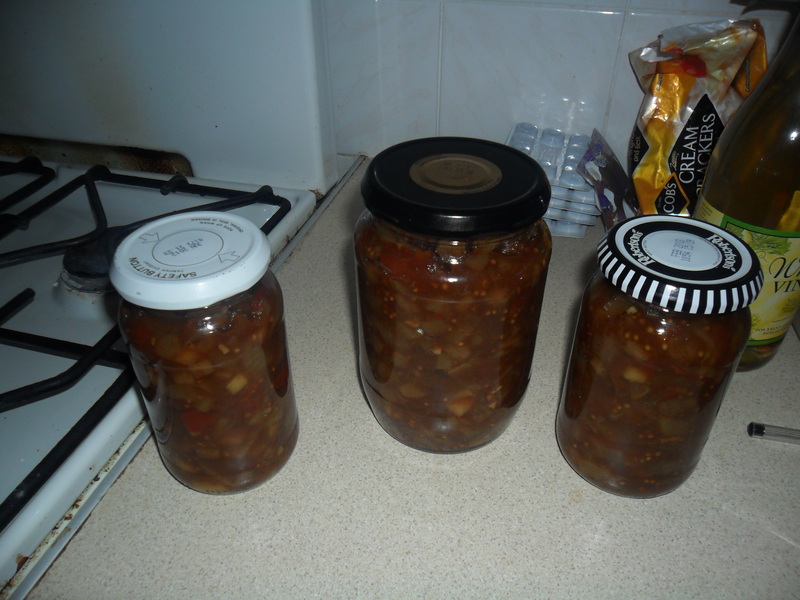 I also know that the produce that I harvest are grown organically without the use of pesticides, so it makes sense to preserve and store my produce, ready for use over the winter. 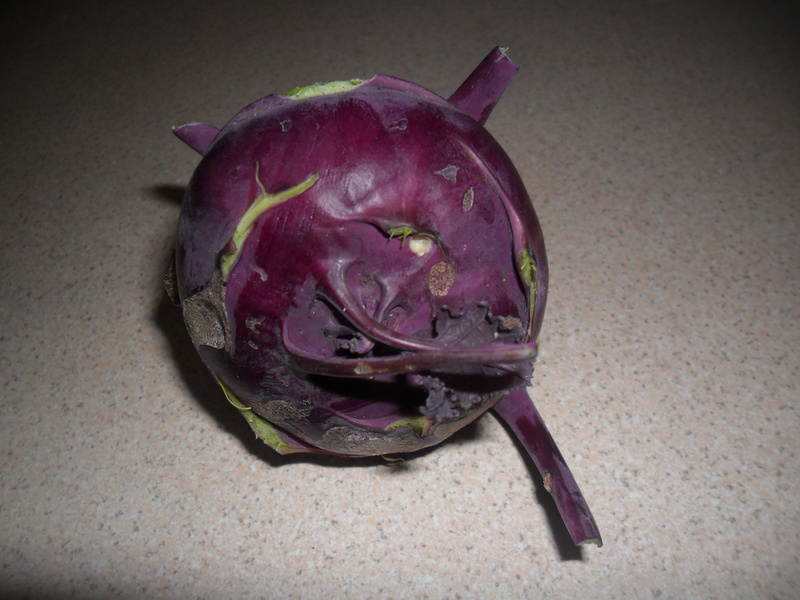 I do buy the odd vegetable in the winter, but mostly I use produce that I have stored, preserved, or I dig up the winter vegetables at my allotment. 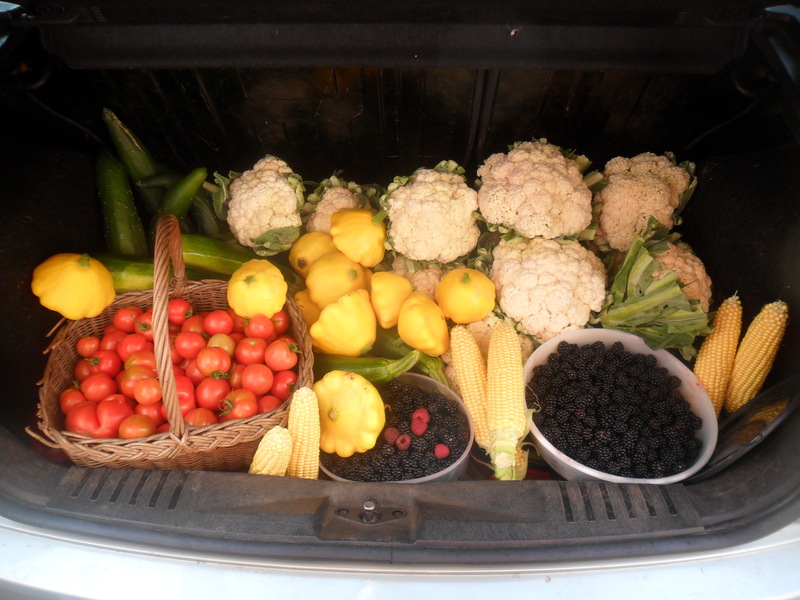 During July, August and September I spend most of my days picking, digging up, preserving and storing my crops. 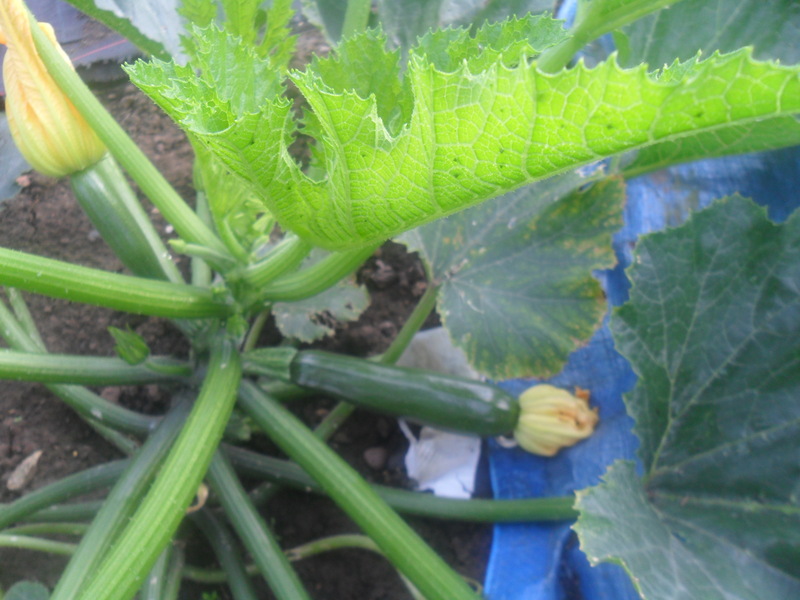 It gives me a huge sense of satisfaction to be as self-reliant as possible and I feel such a pleasure when my family are eating the food I have grown. 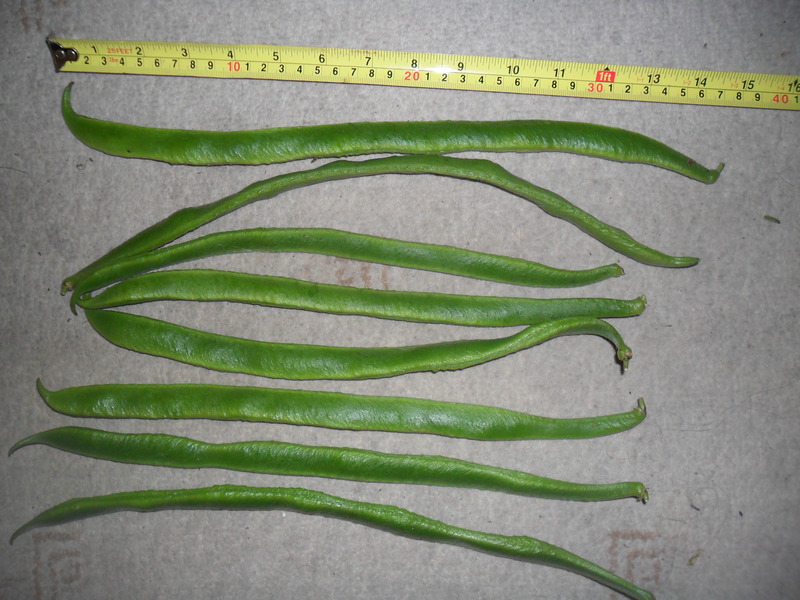 So How Do I Store And Preserve The Crops I grow? 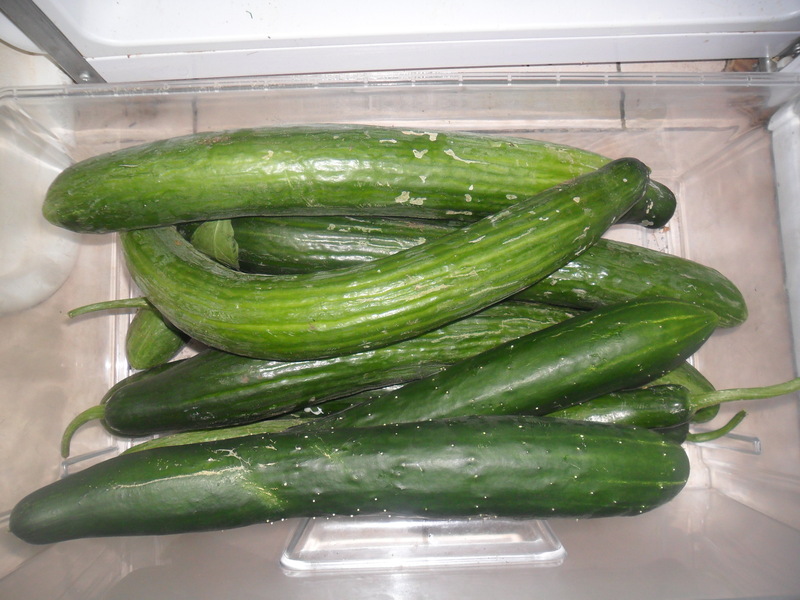 Firstly, the most natural way to store my vegetables is to leave them to nature. 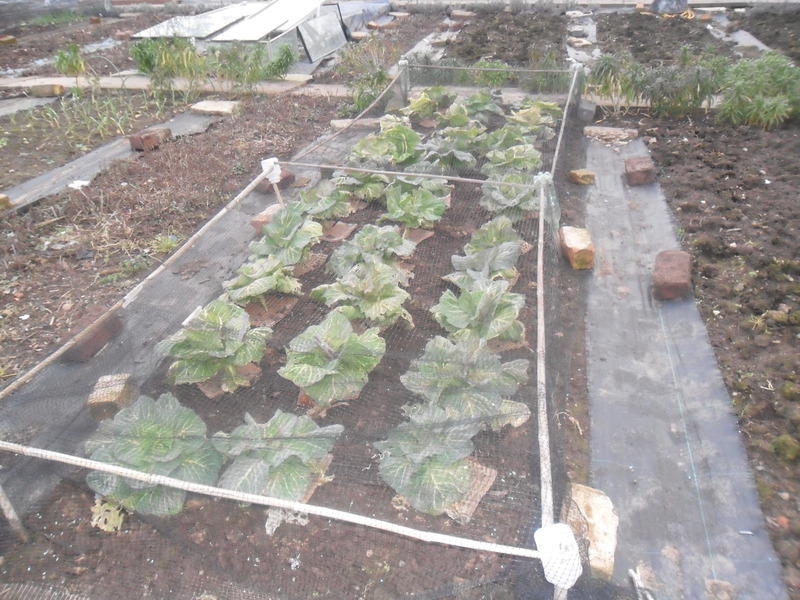 Crops that are frost hardy such as leeks, parsnips, cabbages, kale, Jerusalem artichokes, celery and spinach will sit happily in the soil over winter until I need them. 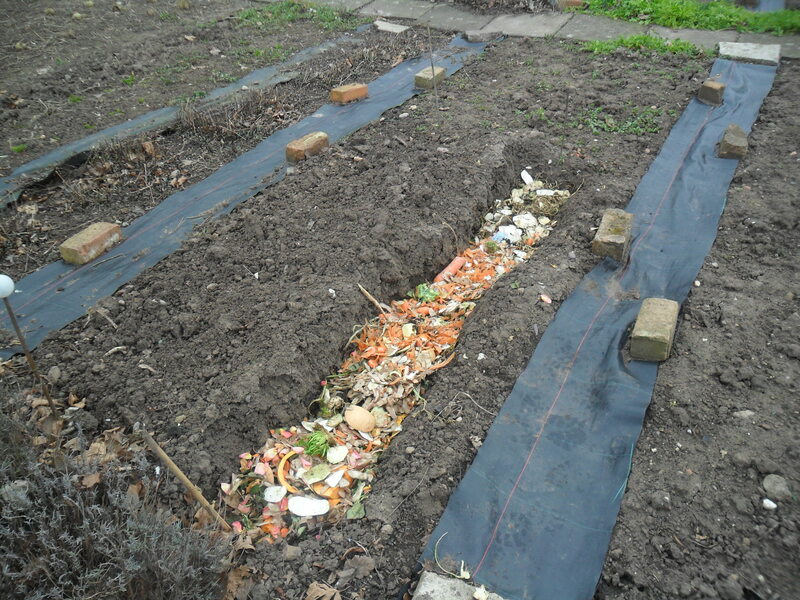 I understand that carrots, beetroot and swedes can also be left in the ground over winter if you mulch them with straw, but when I tried this they suffered a lot of slug damage, so I don’t store them like this anymore. Some crops are better lifted and stored. A good example of this is potatoes as the longer you leave them in the ground, the more slug holes you seem to have in them. 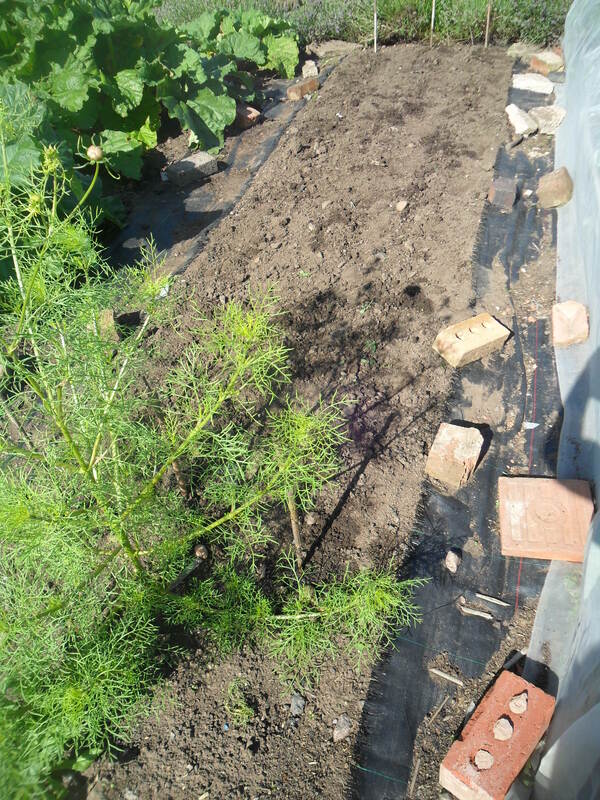 Years ago, root crops would have been stored in a ‘clamp’ in the garden, which is an inexpensive way of insulating the crop. You can still use this method if you want to. You can read about ‘clamps’ here. 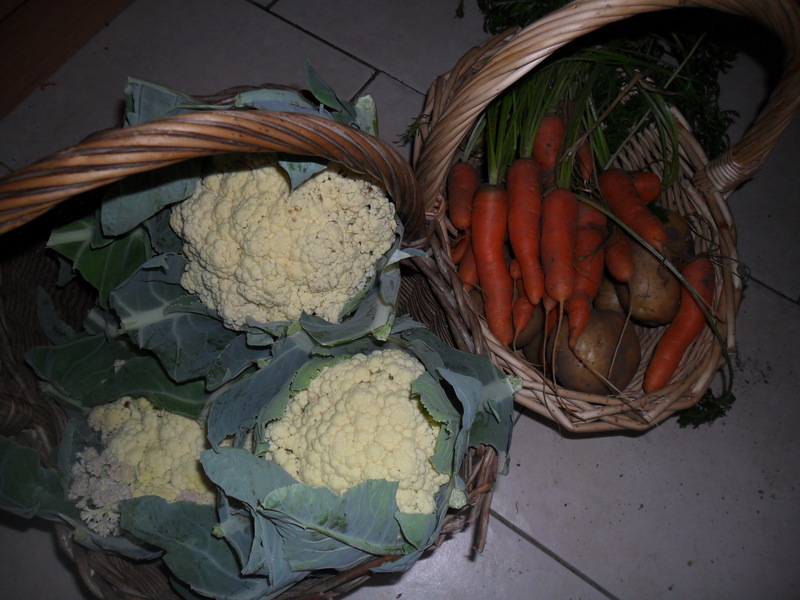 I prefer to store some of my vegetables in a dark, dry, frost free place. 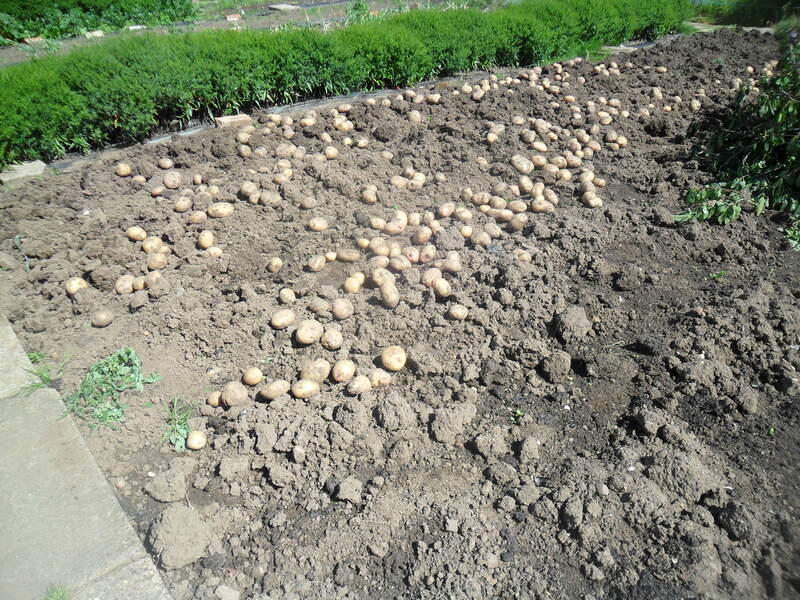 After I have dug up my potatoes I leave them out to dry for a few hours on the soil, turning them once. 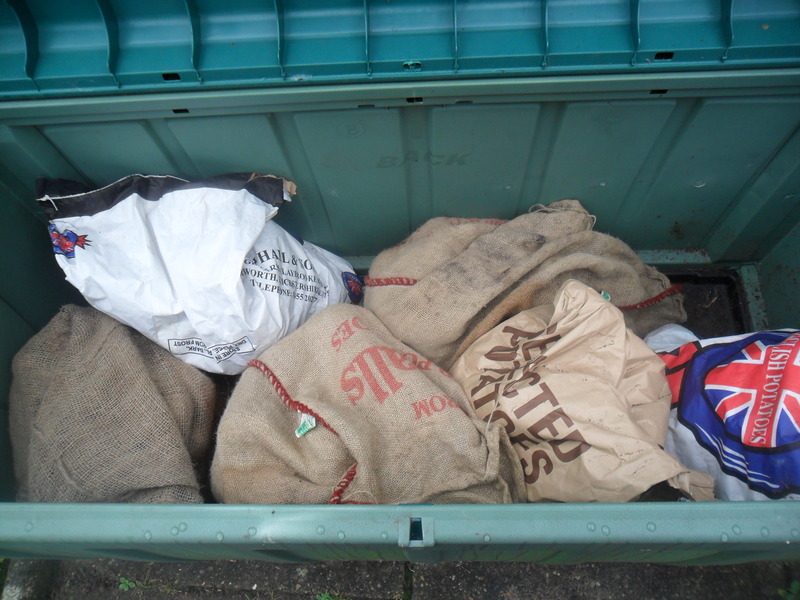 I then put them into sacks to store them. 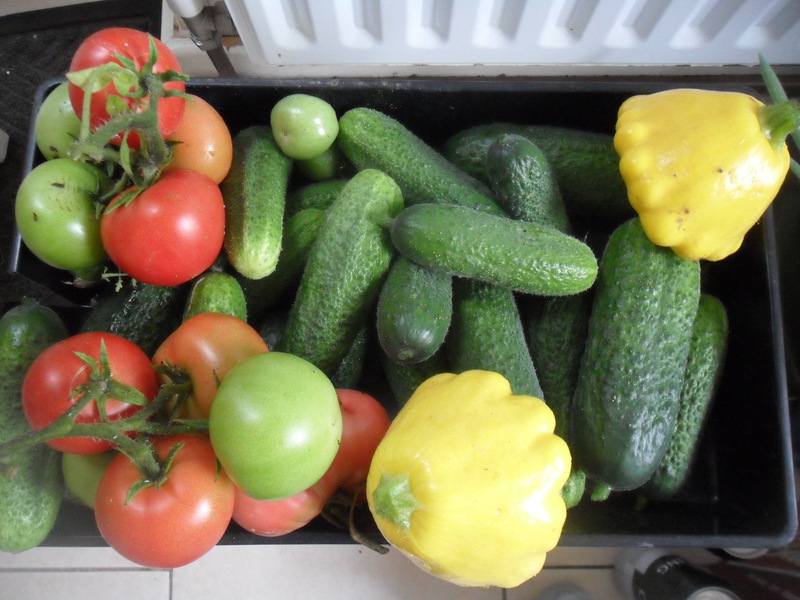 I keep them in boxes (which are actually cushion boxes from B&Q) and even though the temperature has been below freezing for quite a length of time in the last few winters, my produce has been fine. However, I do live in a town and I’m not sure if these boxes would remain frost free in a rural area. Early potatoes don’t store as long as main crop potatoes, so we use them first. 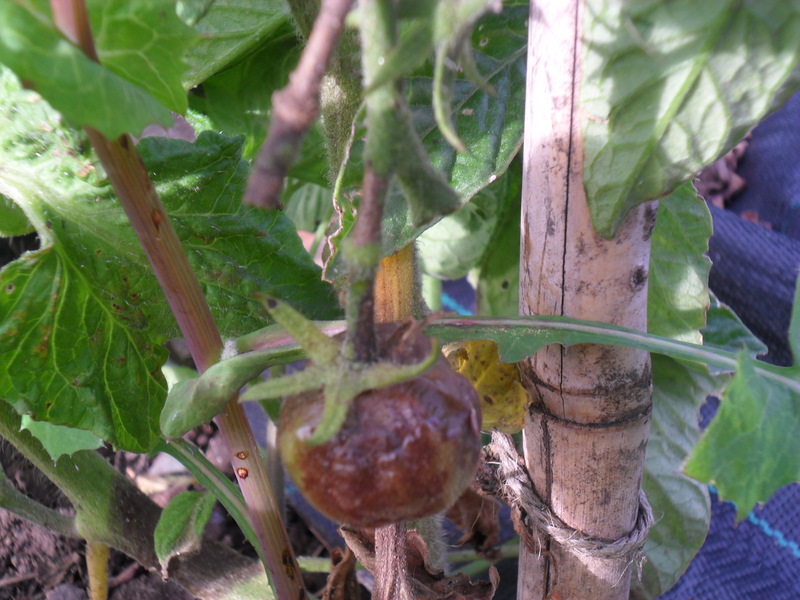 Also any that have slug holes or blemishes are eaten first too, as these just don’t store well either. 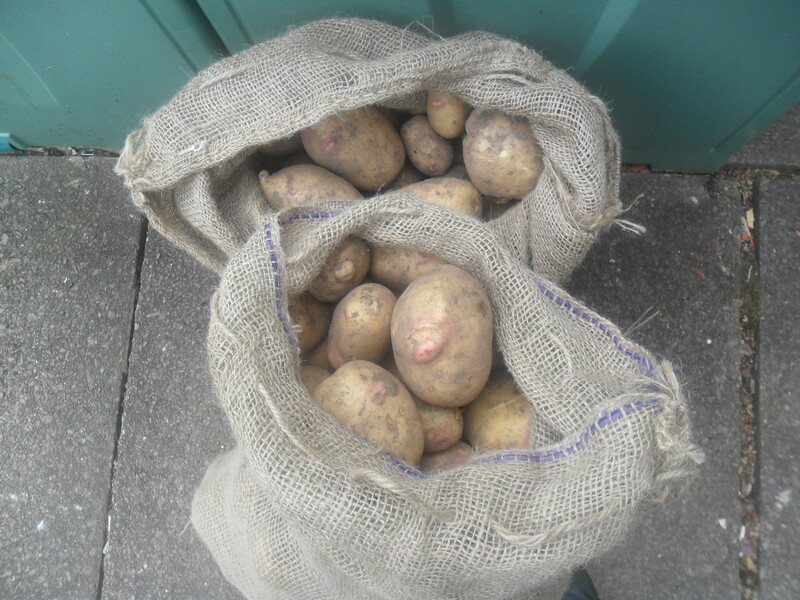 TIP: Don’t store potatoes in plastic bags as the humidity will rot them and do check the potatoes for any signs of rotting every so often, as one rotten potato will rot the a whole sack if you don’t notice it. I also store carrots, beetroot and swedes in my ‘cushion’ boxes. 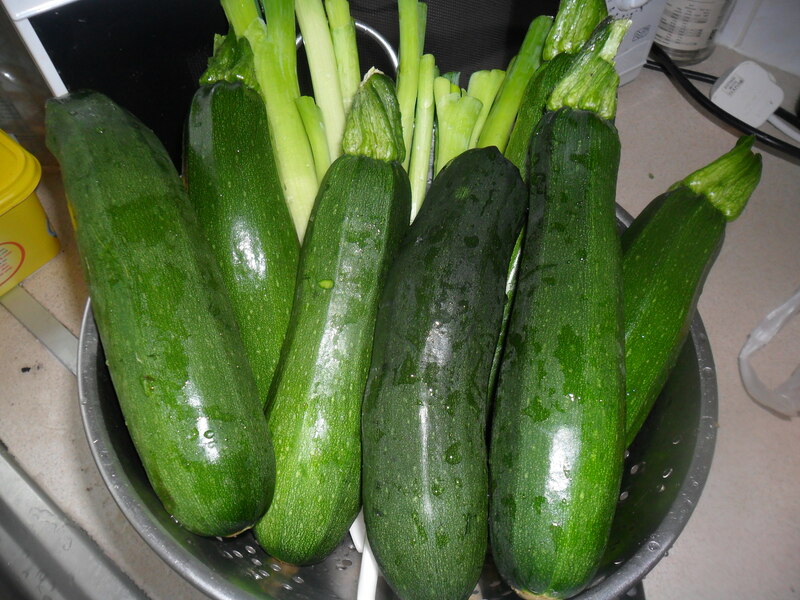 It is easy to store them and very convenient to pop outside to get something to prepare for dinner. 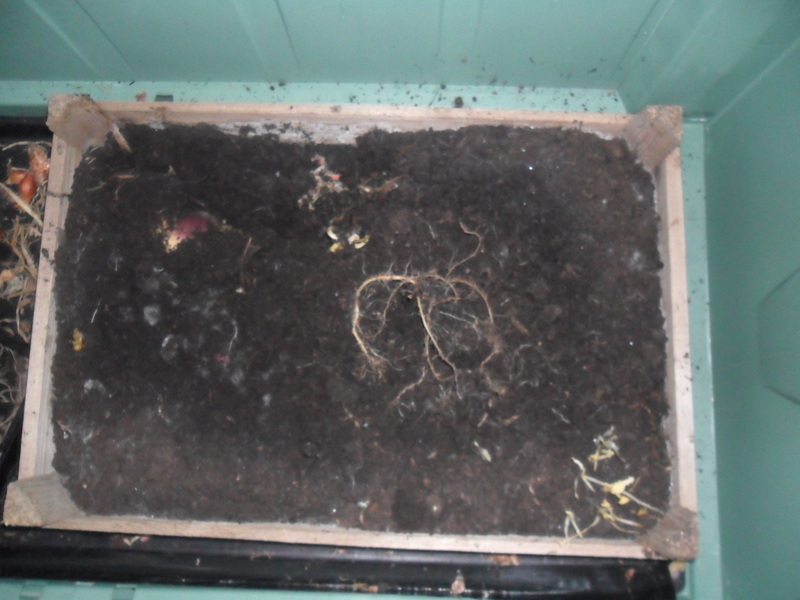 I lift the vegetables and twist off the tops and then put them into a wooden box on top of a layer of compost (you can use sand for this too). 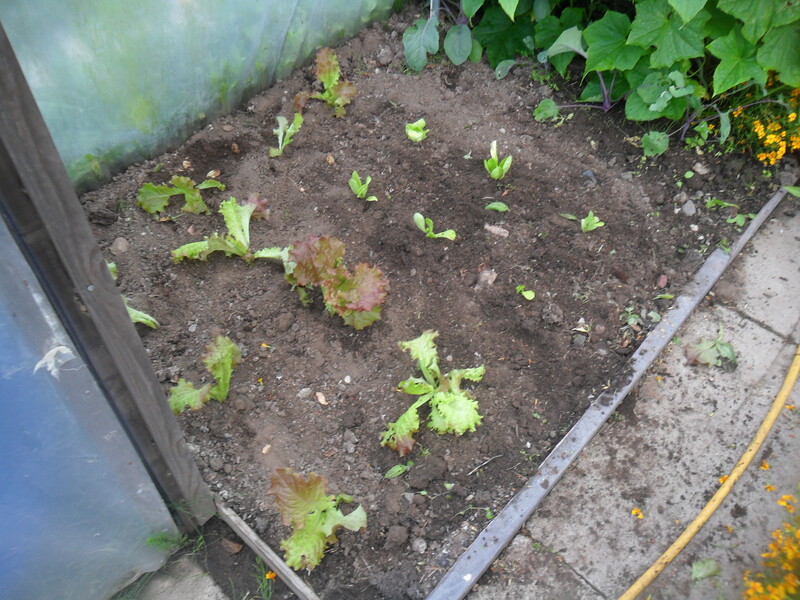 I make sure the vegetables aren’t touching and then I cover them with compost. This way they store beautifully over the winter. 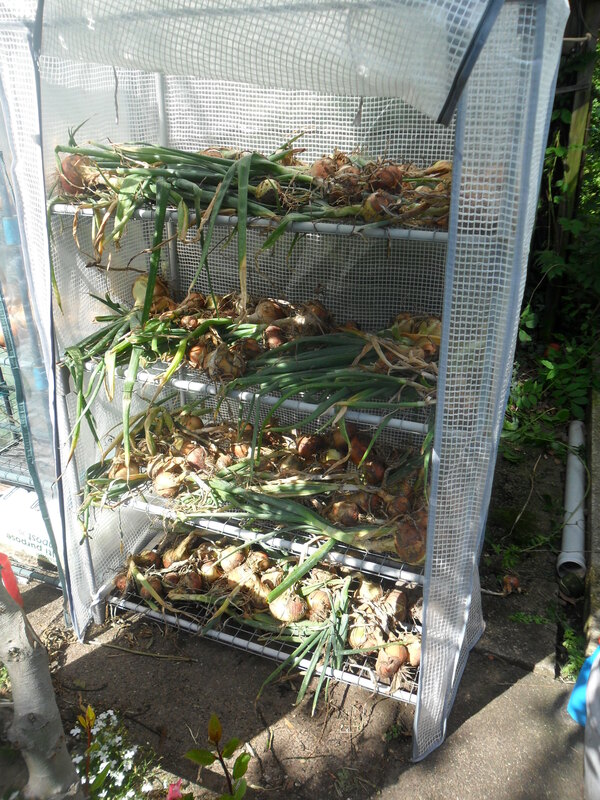 When my onions and shallots are ready, I lift them and dry them on racks under cover for two or three weeks. Books tend to tell you to lift them and leave them on the ground for two weeks in full sun…but when do we ever have two weeks of full sun in the UK? 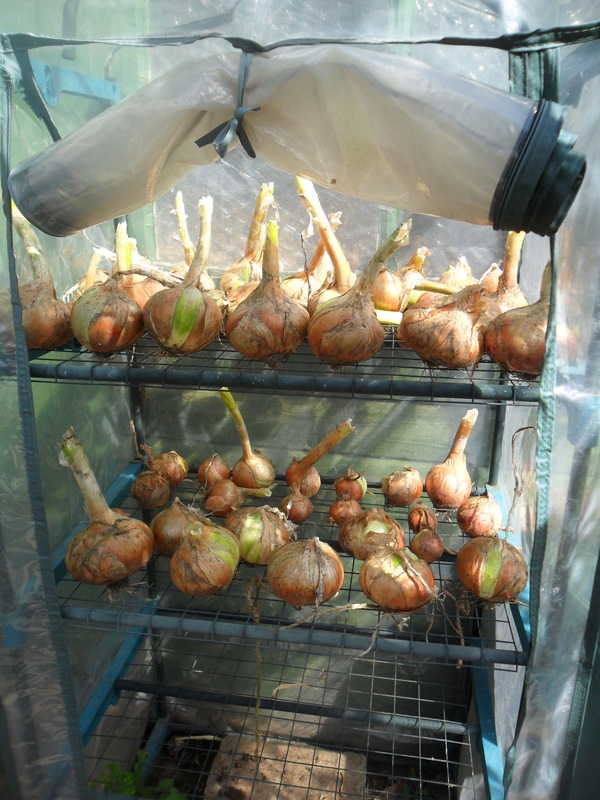 After two or three weeks I put the onions in nets and again I put them in my ‘cushion boxes’. I also store my apples over winter. 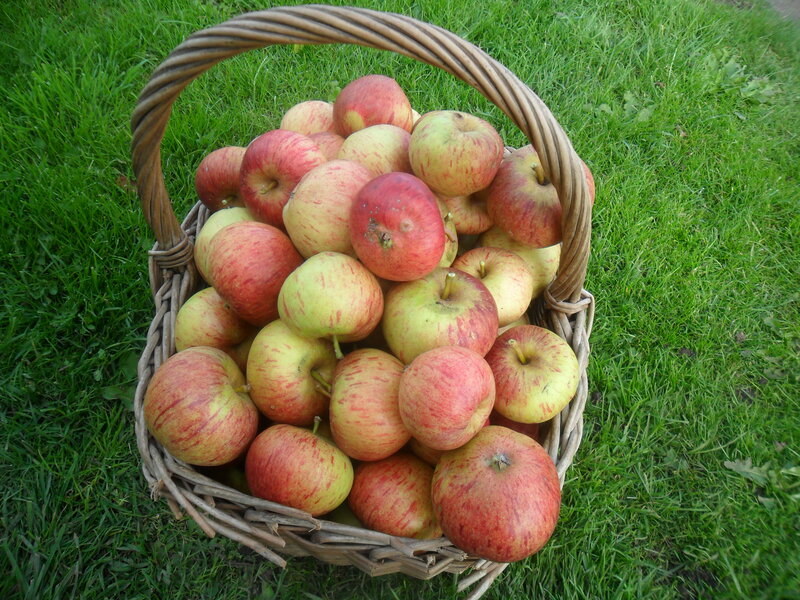 Early varieties of apple don’t store very well, so I store the apples from my later variety of apple trees. 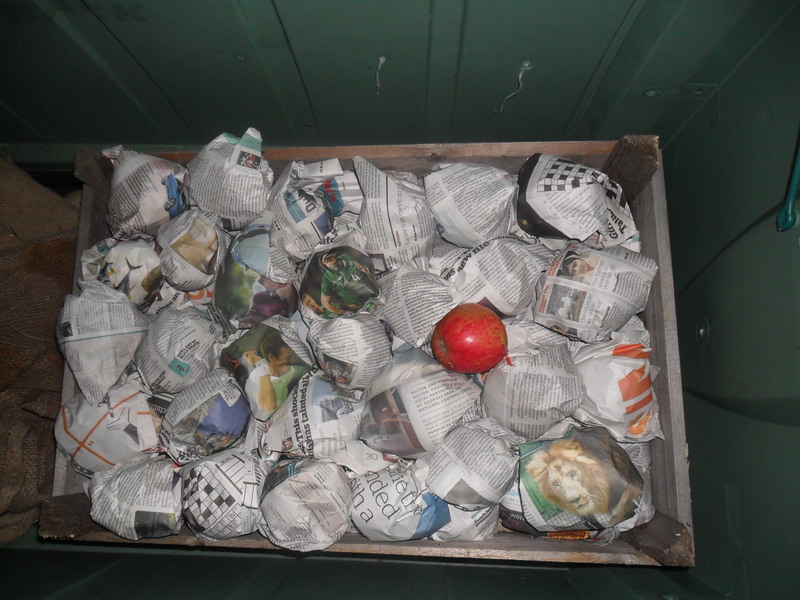 All I do is wrap each apple up individually in newspaper and stack them in a box. Again I check them every so often as one bad apple can destroy the whole box. 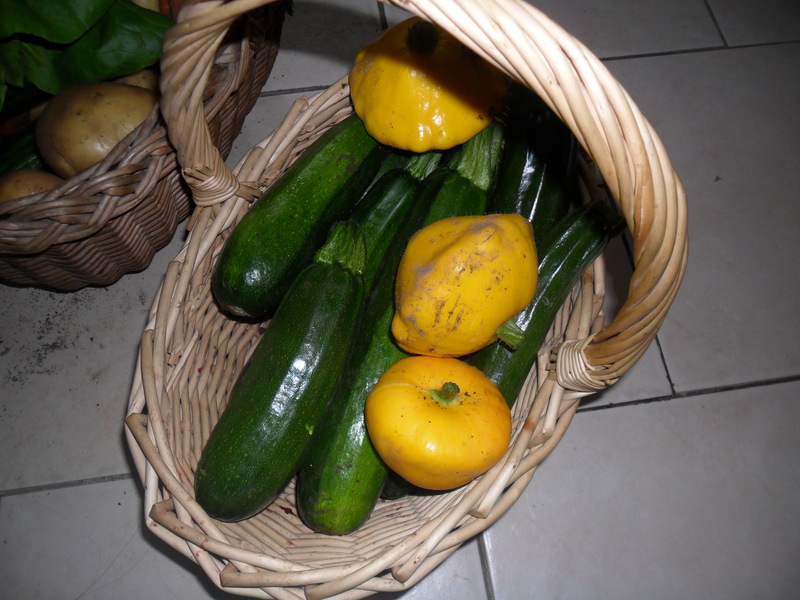 Finally, winter squashes can be stored for approximately six months in a well ventilated place. 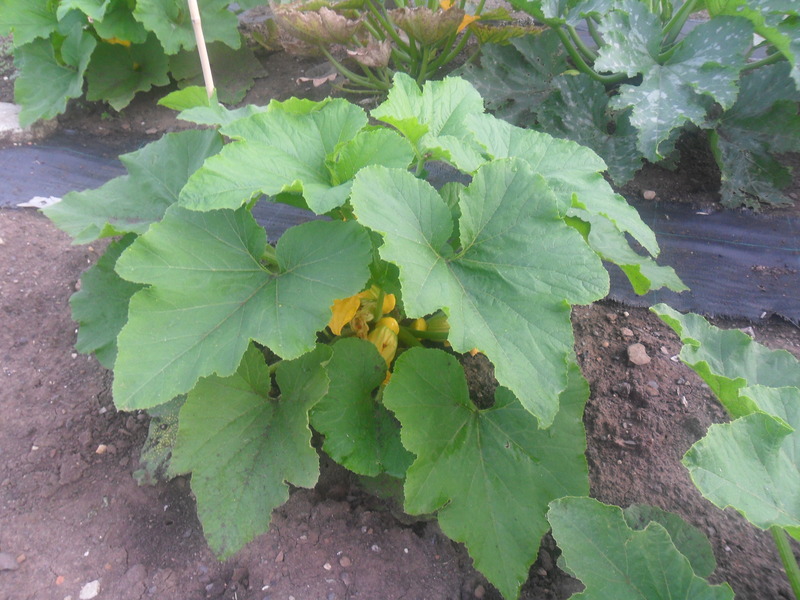 The RHS recommend that winter squashes are kept between 10C and 15C. 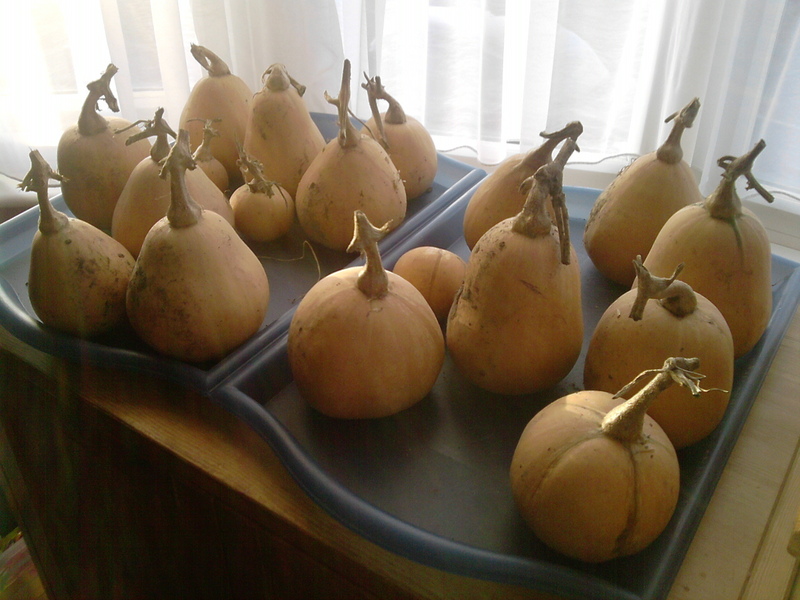 I keep mine in our bedroom on top of our chest of draws on a tray, which I know is not the most romantic thing to do, but the squashes last for ages as it’s the coolest room in our house. 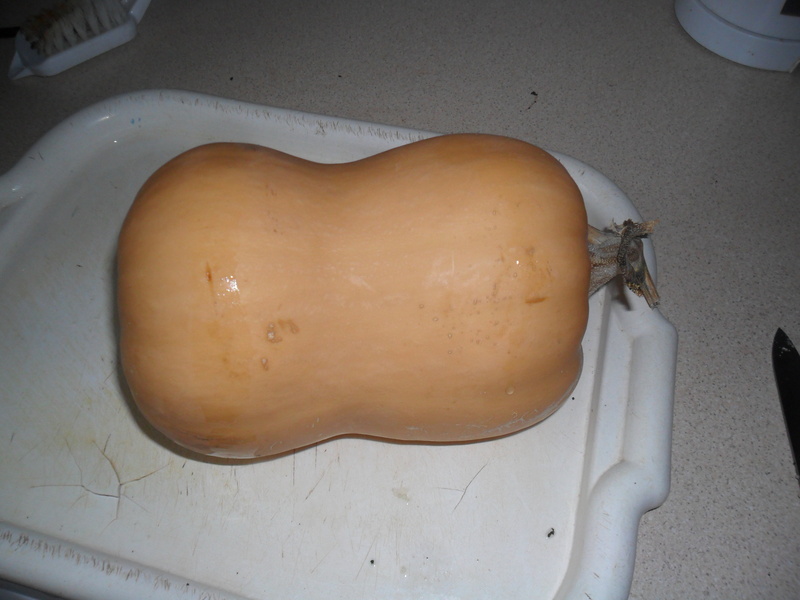 Before storing winter squashes it is important to ‘cure’ your squash. 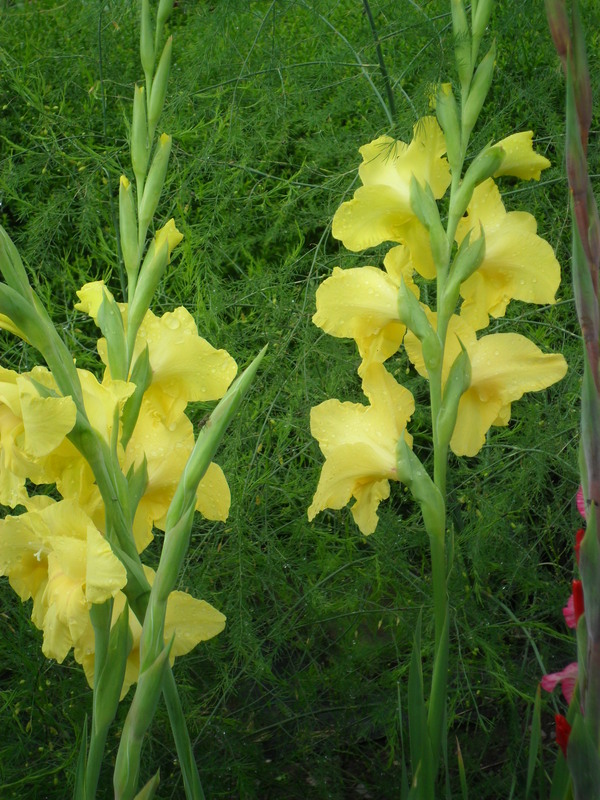 All this means, is to leave them outside in the sunlight after you have cut them from the plant, for a week to ten days (more if possible). 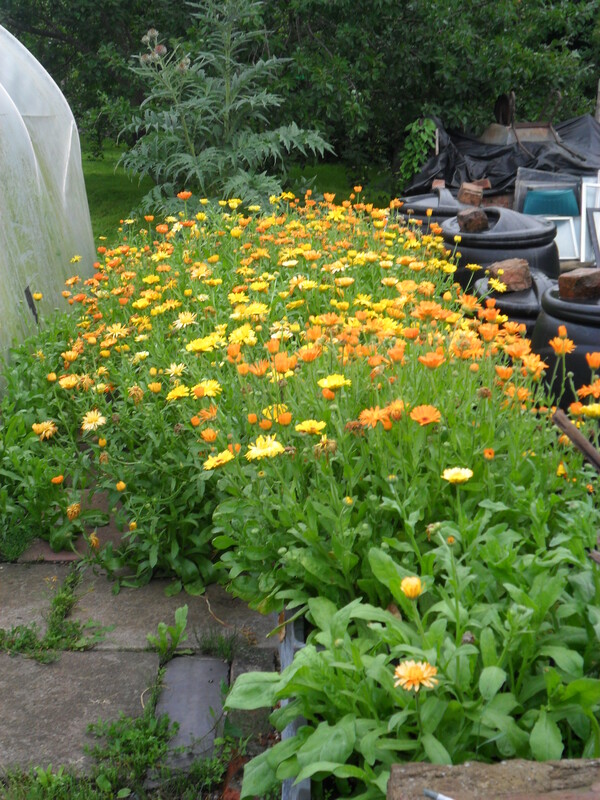 Ensure you cover them or take them indoors if a frost threatens. I cure mine in my greenhouse, which gives them some protection. 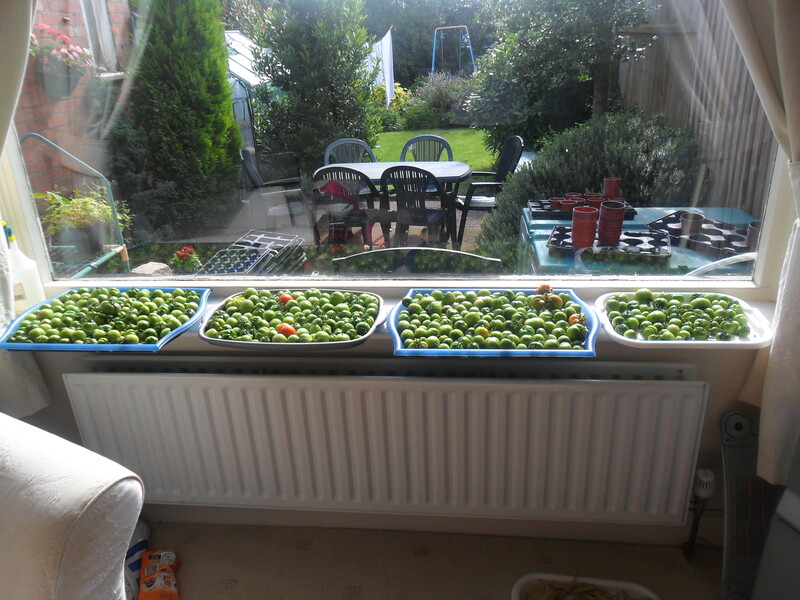 I think I’ve written enough for today, so on Friday I’ll continue to write about freezing and preserving our produce. 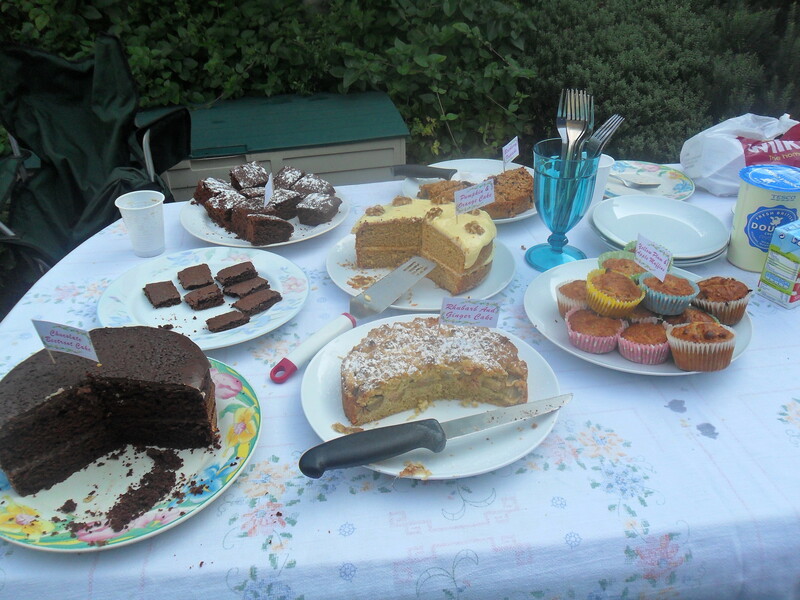 This week I watched the first episode of the new series of the ‘Great British Bake Off’ (BBC Two on Tuesday Evenings). 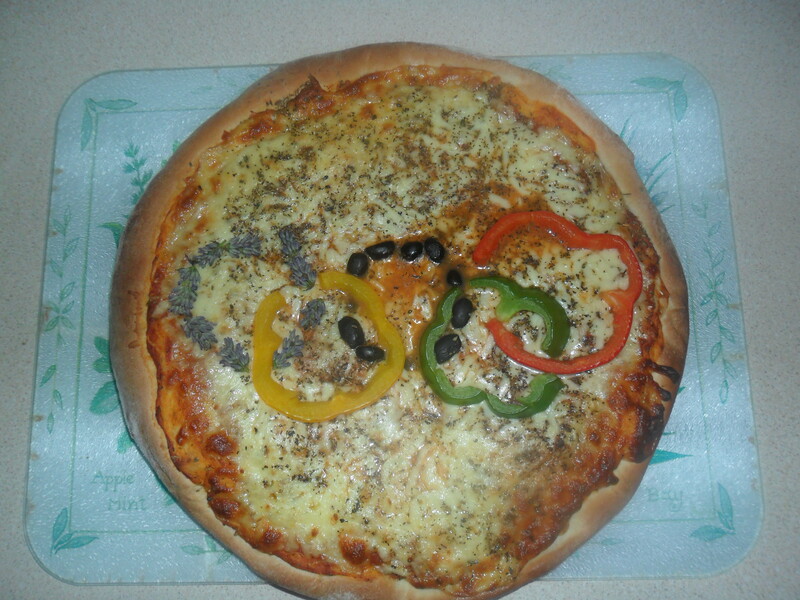 I don’t watch many programs on TV, but I enjoyed the last series so I made a special effort to watch it. For those who have never seen this program, the contestants bake the most amazing cakes, biscuits, breads and desserts that all look stunningly perfect and Mary Berry and Paul Hollywood taste and judge their heavenly creations. At the end of the program I made a comment to my youngest daughter that I would love to bake as well as the contestants on the program and she replied “you always bake a perfect chocolate cake”, which is not quite true but it made me feel nice and gave me a warm feeling inside. 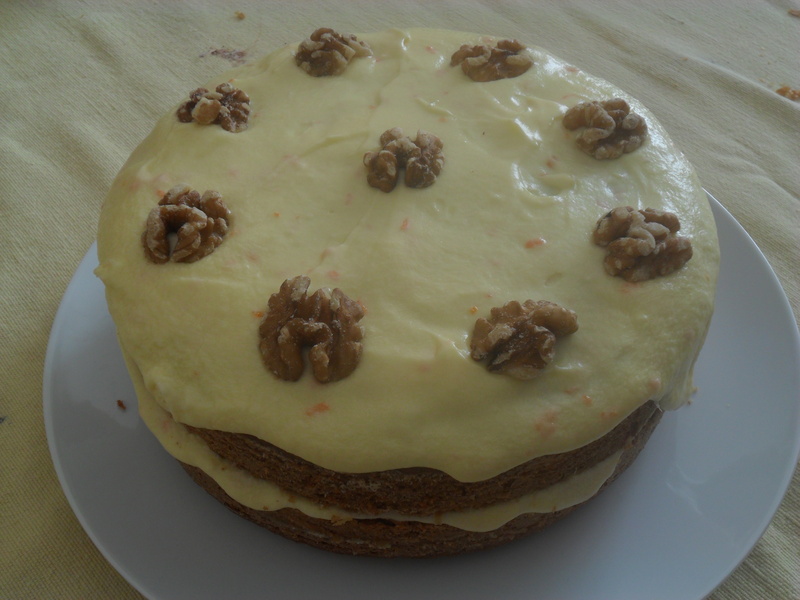 I then began to think about ‘baking’ and ‘cooking from scratch’…. 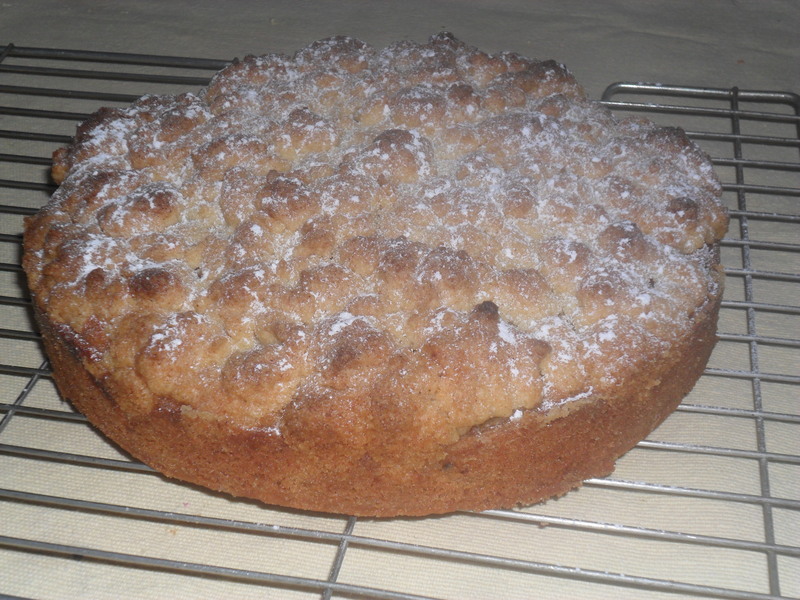 I enjoy baking and cooking meals from scratch and I feel it is part of living a ‘simpler life’. I love the contented feeling I have when I see my family happily eating the food I have produced for them. 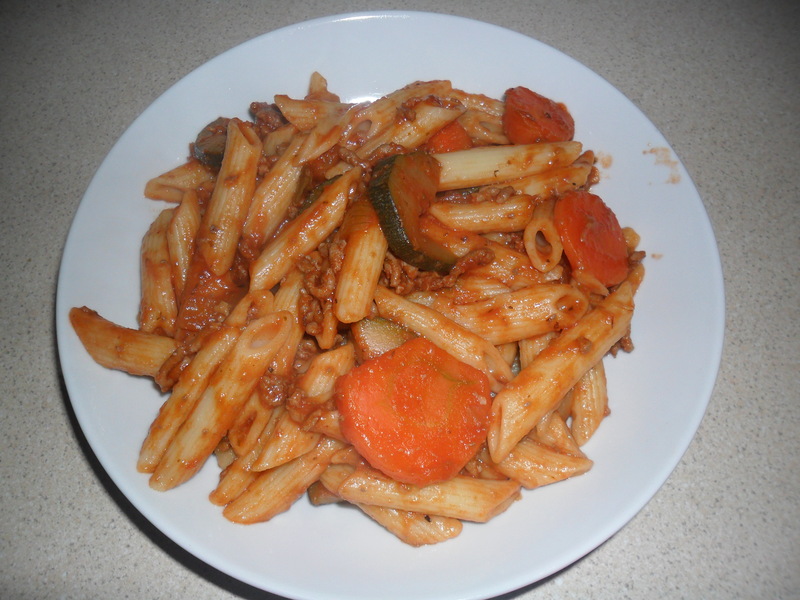 The meals I cook are not always perfect and I sometimes have the odd burnt bits on top, or some cakes may slope to one side, but as long as the things I cook are within our budget, healthy, taste nice and fill empty stomachs, then I have achieved what I set out to do. 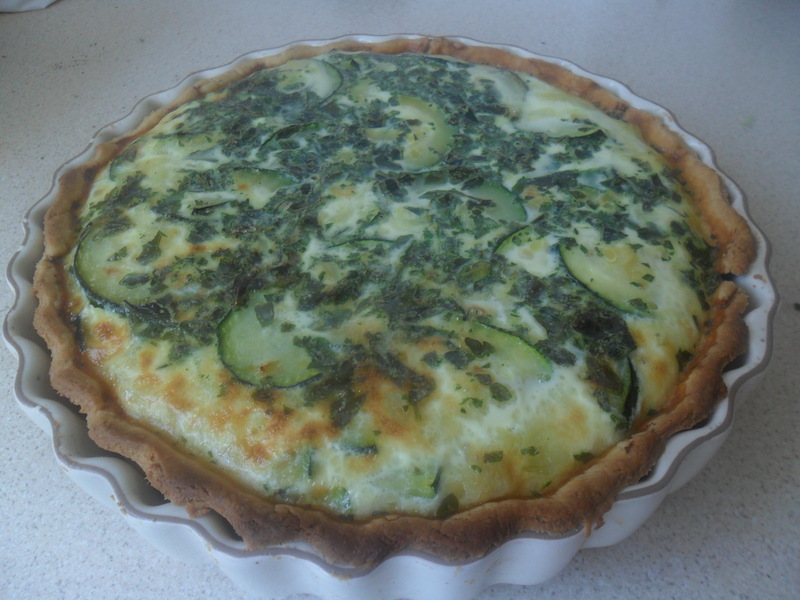 I know most people just do not have the time to cook meals from scratch or even ‘want’ to cook meals from scratch, but I enjoy it and love the challenge of feeding my family healthily on a tight budget, which is why I took on my allotments. 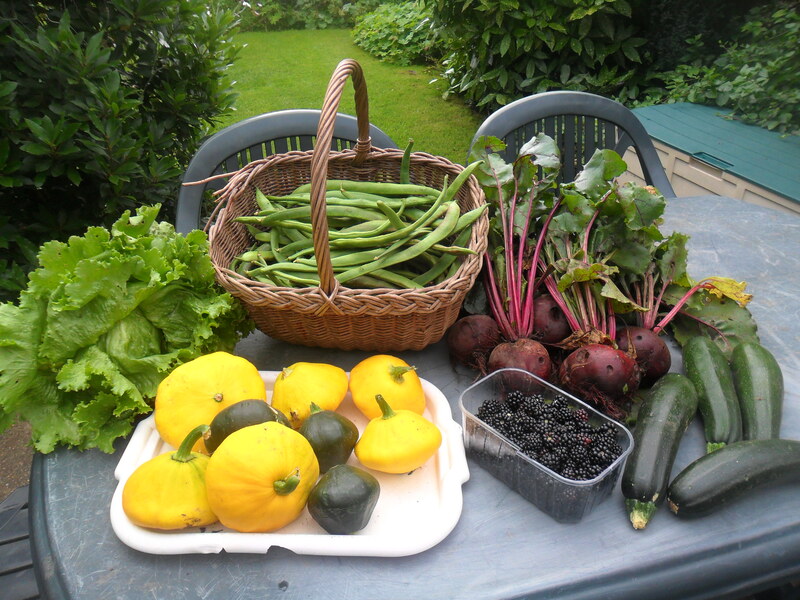 My allotments enable me to provide my family with organic fruit and vegetables, which we wouldn’t ordinarily be able to afford. 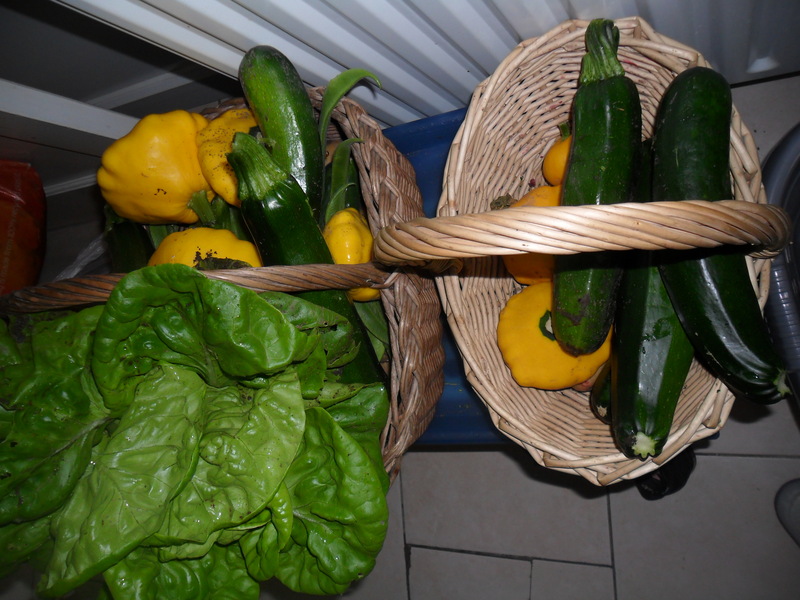 It took me a while to get into the swing of growing my own food, but now it is second nature and it is something I really enjoy. 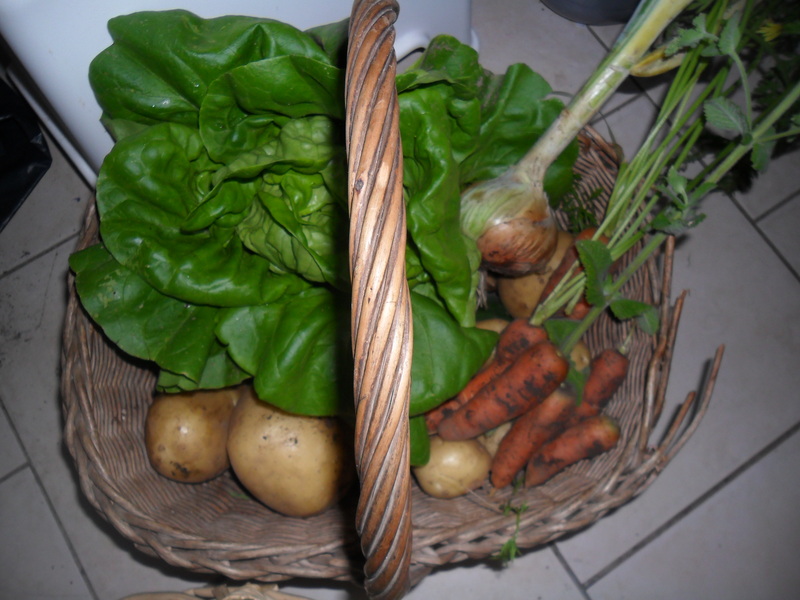 Between 1st January 2011 and 31st December 2011, when I was cultivating three plots (I have four plots now), I worked out how much money I saved by growing my own fruit and vegetables during the year. When I picked any fruit or vegetables I weighed them the same day and worked out how much they would have cost me if I’d bought the ‘value’ (not organic) version from my local supermarket and made a note of this on a spreadsheet. 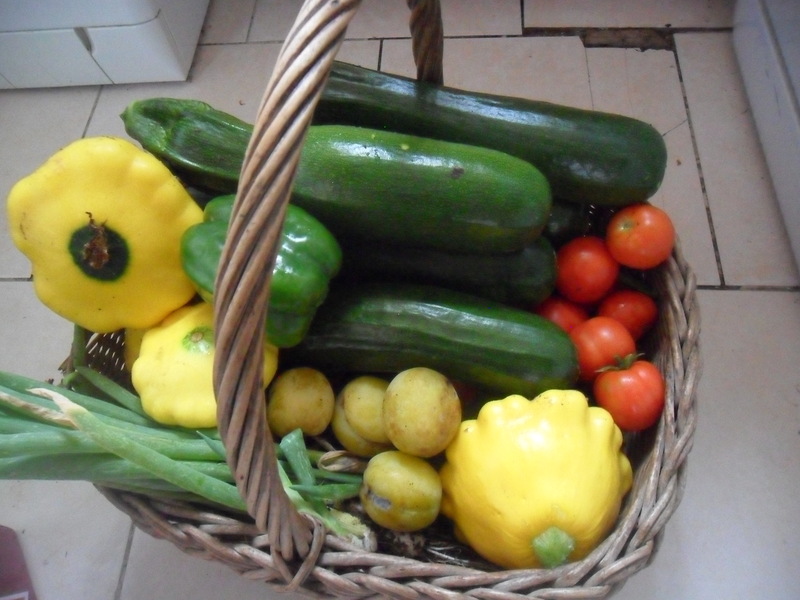 I picked the cheapest priced fruit and vegetables to work the cost out, as this is what I would have to buy if I didn’t grow it myself, even though my vegetables were grown organically. 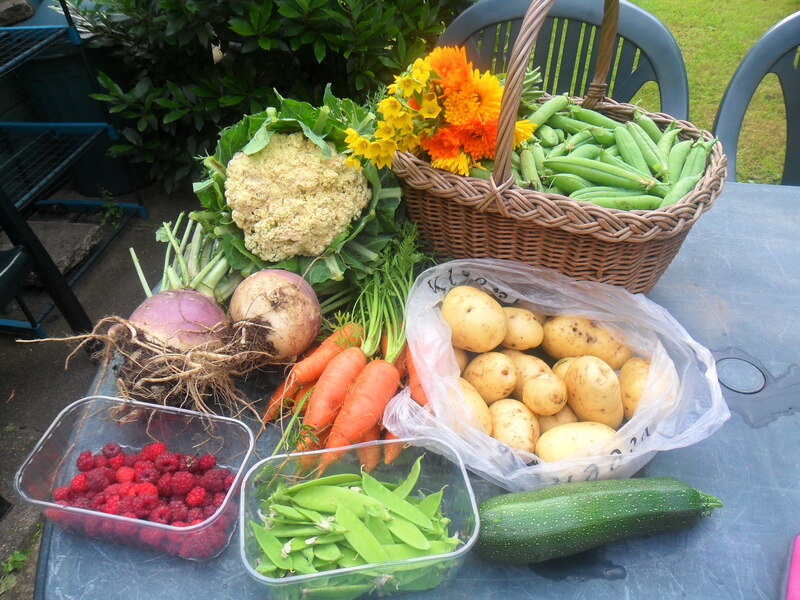 By the end of the year I had picked and used £1454.53 of fruit and vegetables and this didn’t include things which you just can’t buy from the supermarkets e.g. 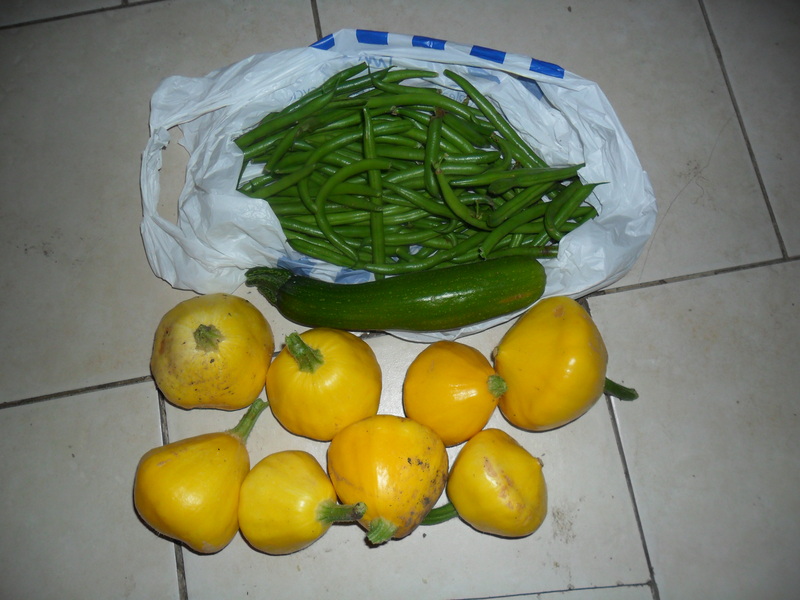 patty pans, kohl rabi and fresh gherkins. 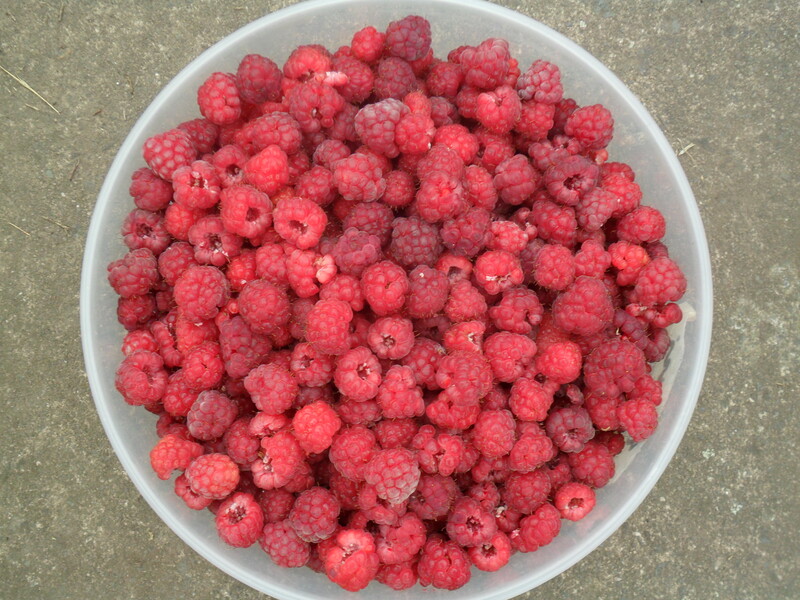 So I decided it definitely pays to ‘grow your own’. 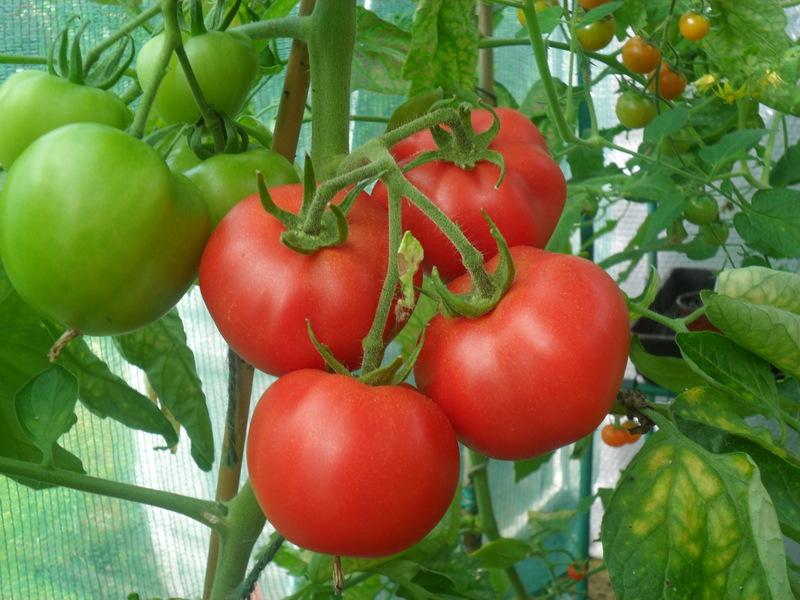 By growing my own fruit and vegetables I know that no pesticides have been used to grow them and by using basic ingredients to cook from scratch, I nearly always know what my family are eating. 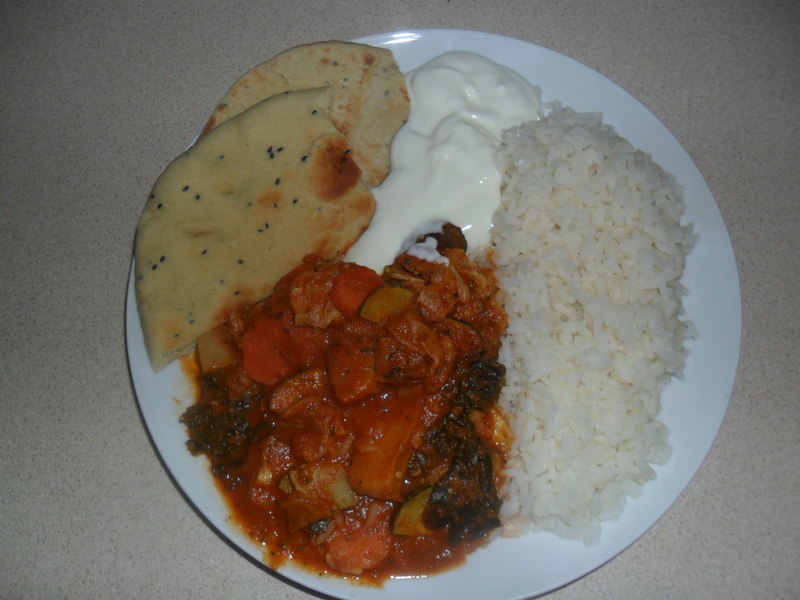 Cooking from scratch is a skill I learnt over time, by reading cookery books, blogs and looking up recipes on the internet. Years ago my friends used to call me the ‘packet mix queen’ as I never cooked anything myself. 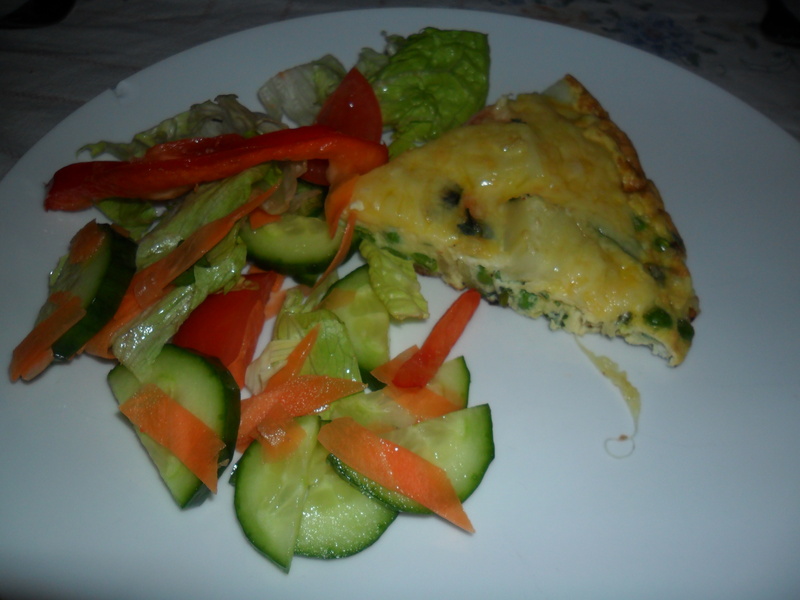 I learnt to cook because I had to, as money was so tight, but it’s something I really enjoy doing now. 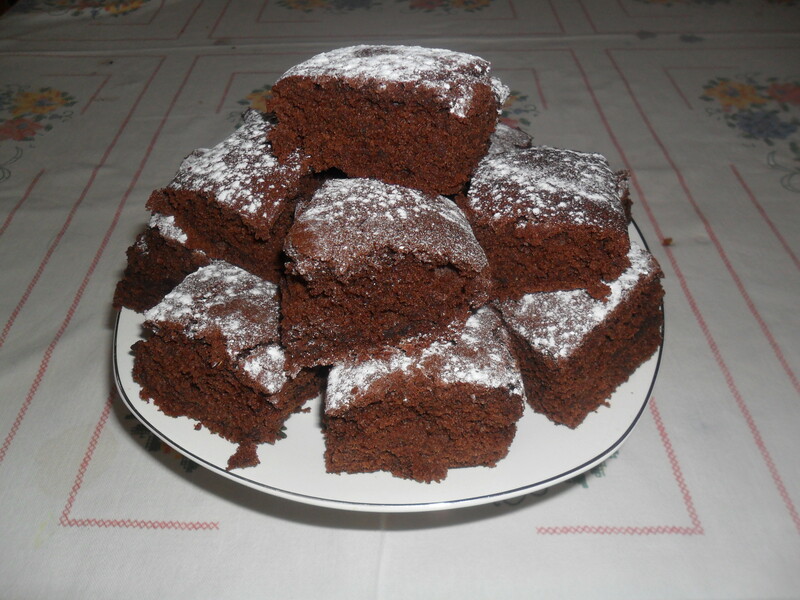 All the recipes I use are not difficult and can be made easily. When my confidence grew, I followed this by learning how to preserve my fruit and vegetables, use leftovers and then I started to batch bake. 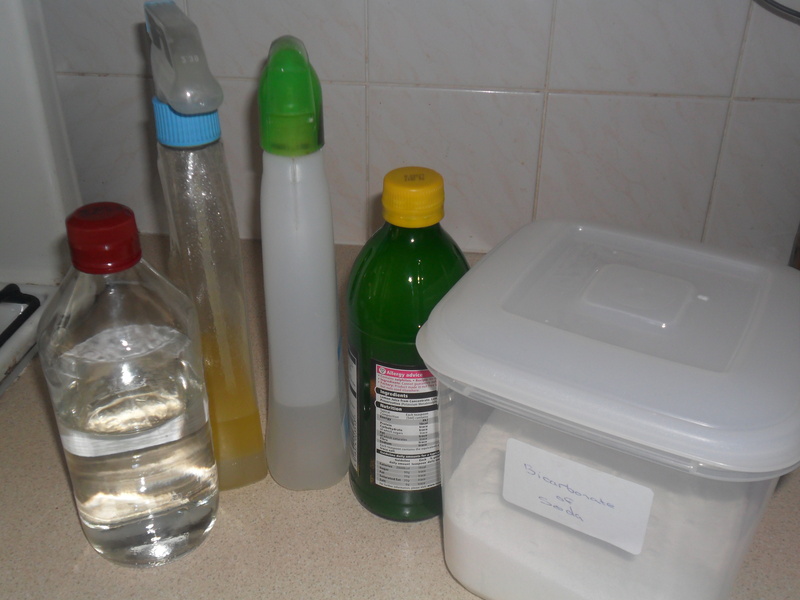 Finally I learnt to make my own laundry liquid here and clean using old fashioned cleaning methods, using lemons, olive oil and white vinegar, which avoids using harsh chemicals. 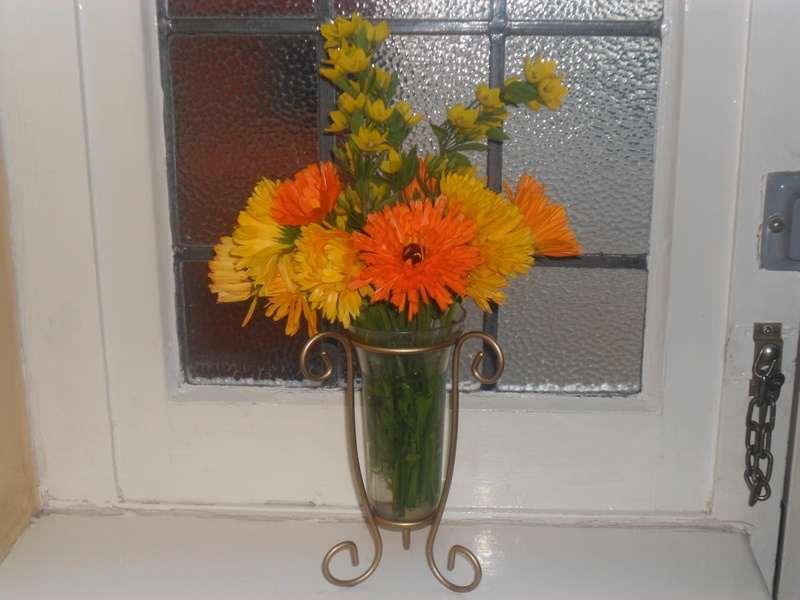 I have written about old fashioned cleaning methods here. The above things all helped to save money. I am still learning new things as I go along today. I think my generation have the best of both worlds, as in the past cooking from scratch and cleaning would take all day to do. We now have the advantage of modern day appliances that make cooking and cleaning much easier. 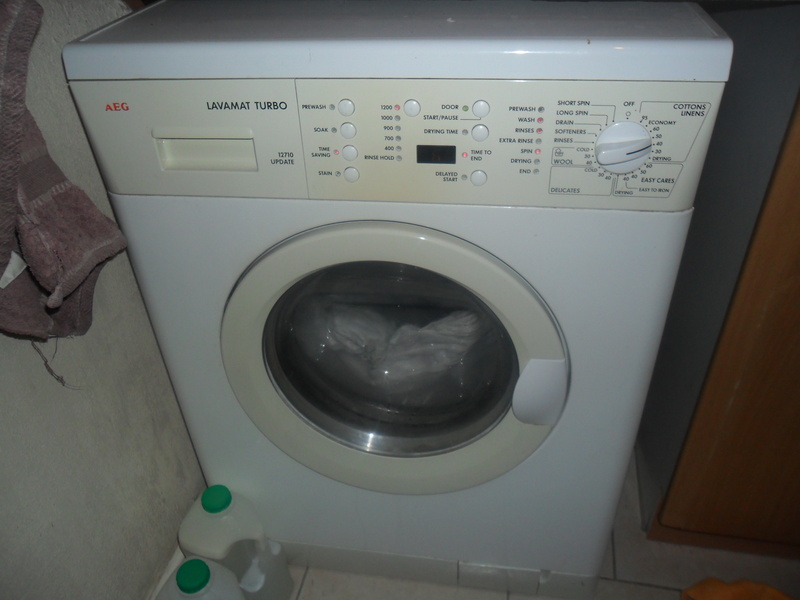 We have bread makers, microwaves, washing machines etc. which all make light work out of the things that would have taken our ancestors a long time to do, but we also have the benefit of their experience and knowledge too. Through reading blogs on the internet I have realised that there are a lot of people out there that want to live more simply in our modern day world and I’m hoping that simple living blogs like mine will help people to take their first steps towards this way of life, enabling them to leave empty ‘materialistic’ lives behind them. We started living this way because of necessity (we chose to live on one wage so I could stay at home with our children). 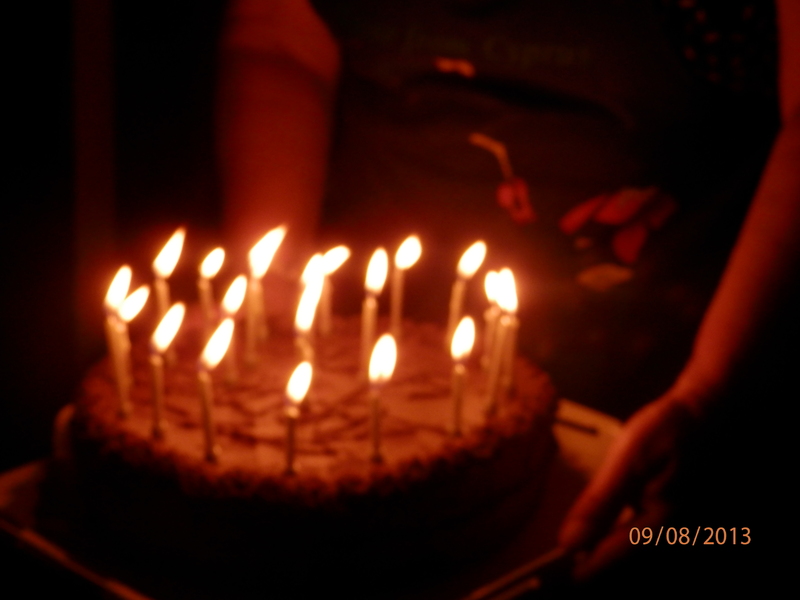 My children are now 15 and 13 years old and yes I could have gone back to work a long time ago, but we chose for our life to continue in the same ‘simple’ way, as we think this way of life is the best way of life for us. The journey hasn’t always been easy, but now we can see and reap the rewards. Hi all, I hope you had a good weekend. Since the New Year, I have only been blogging twice a week and I am finding it really hard to cover everything I actually do in just two posts a week. So I try and cover as much as possible, but I do miss out a lot, so I would like to apologise for that. If there is anything you would like me to write about, or anything that puzzles you, please let me know. 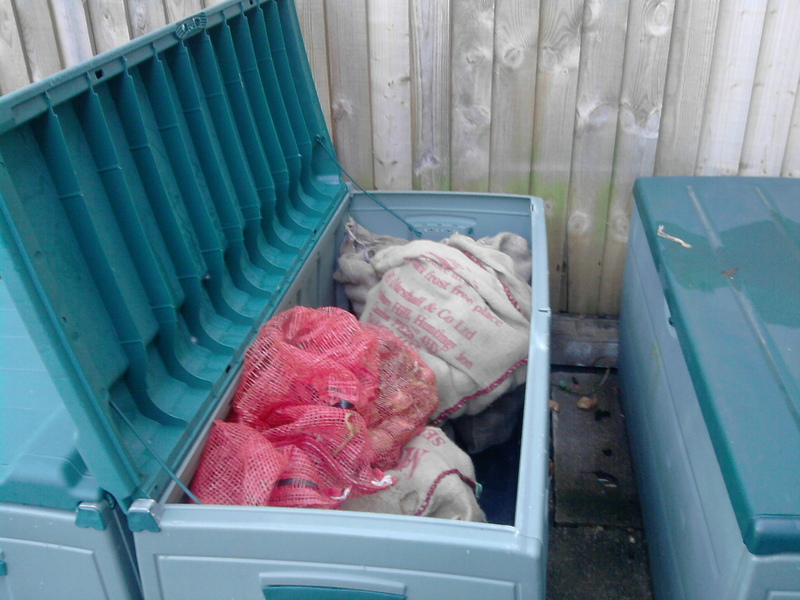 The weather was good here yesterday, so I managed to dig up two more rows of potatoes and dry them ready for storing. These potatoes are a variety called ‘Piccasso’ which I have grown a lot over the years. 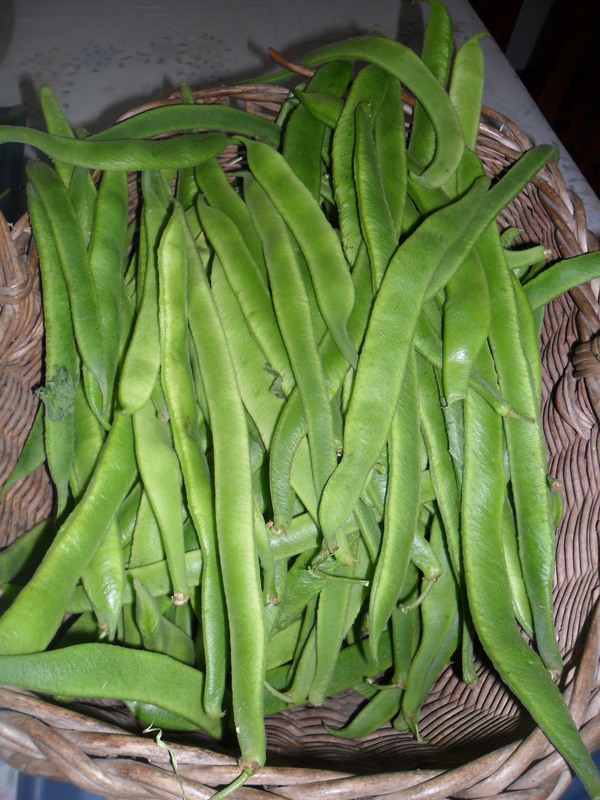 They are great for roasting, mashing and baking and I find they boil and hold their shape well. 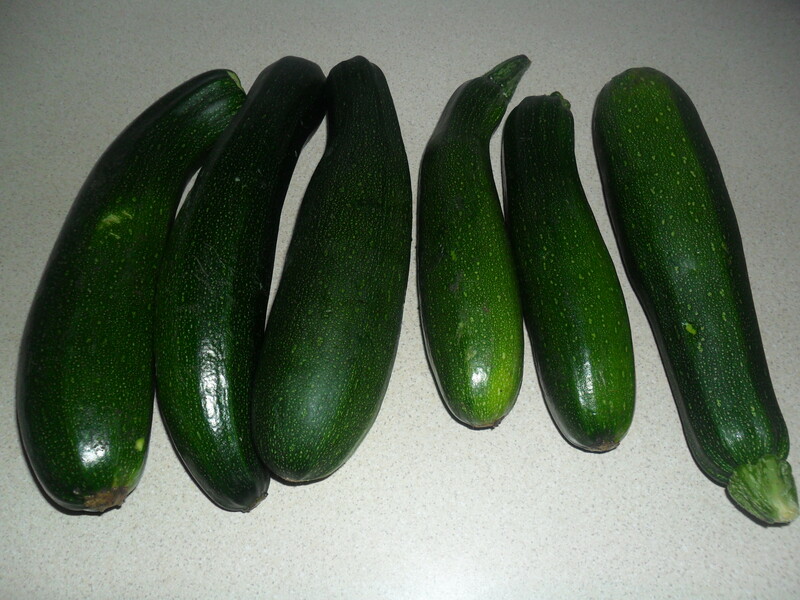 So they are a good all rounder, which are great for storing over the winter. 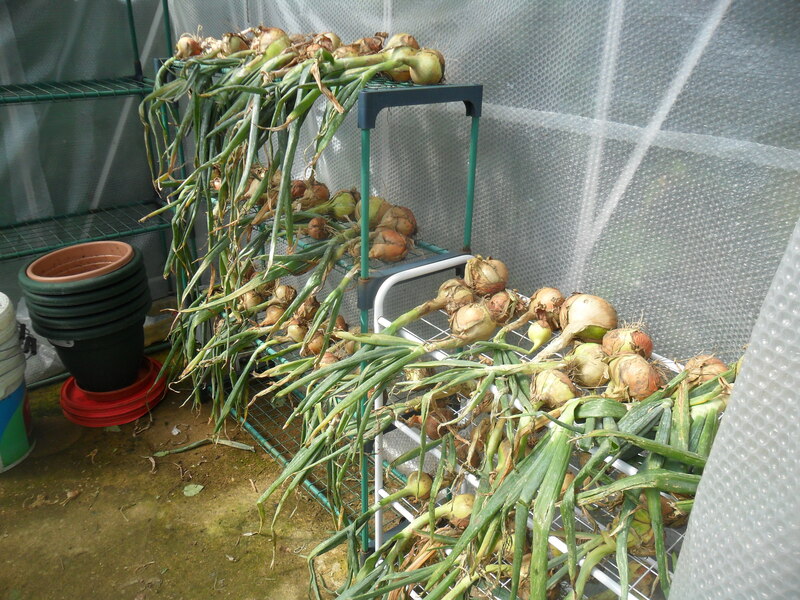 A couple of weeks ago, I took up my over-wintering onions. 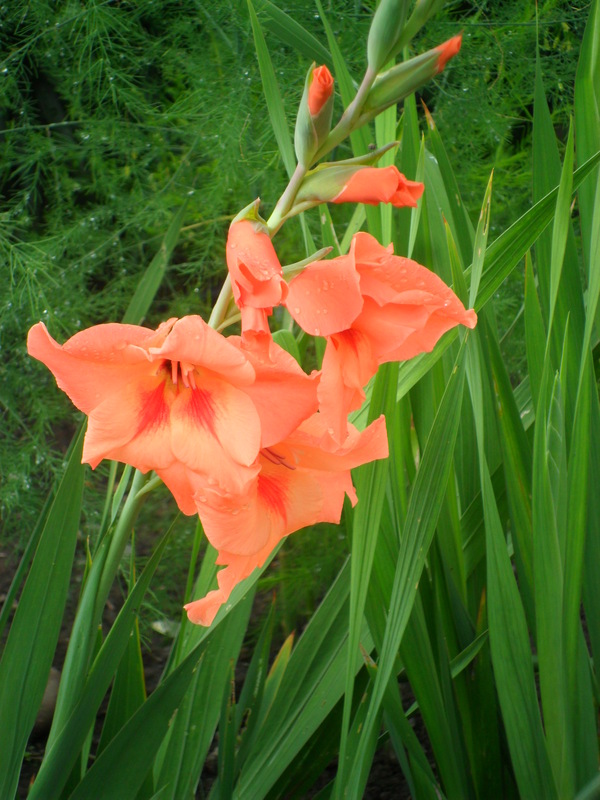 This is a job I usually do in July, but this is another crop that was behind due to the cold spring we had. 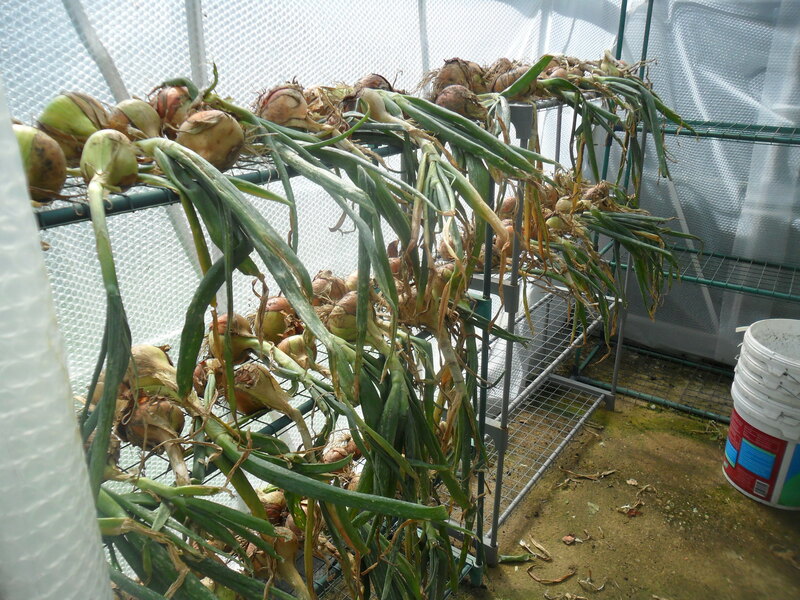 My over-wintering onions last year didn’t do very well at all, due to an attack of the ‘allium leaf miner’. 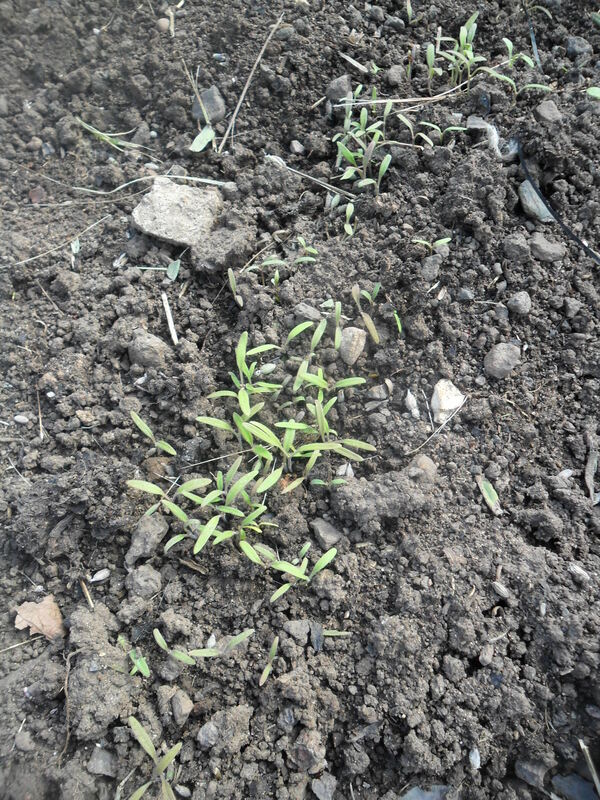 So in autumn last year, I planted seed sown over-wintering onions (rather than sets), in the hope that they would grow stronger than the sets I usually plant. I also covered them in environmesh to protect them. The allium leaf miner is a pest that was only detected in Britain in 2002. 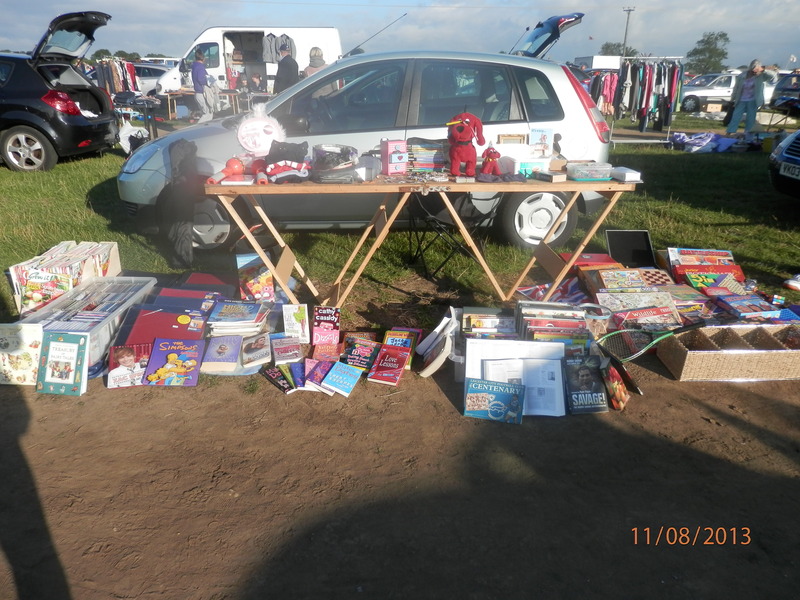 It has been spreading rapidly since and spread to many places in the Midlands for the first time two years ago. 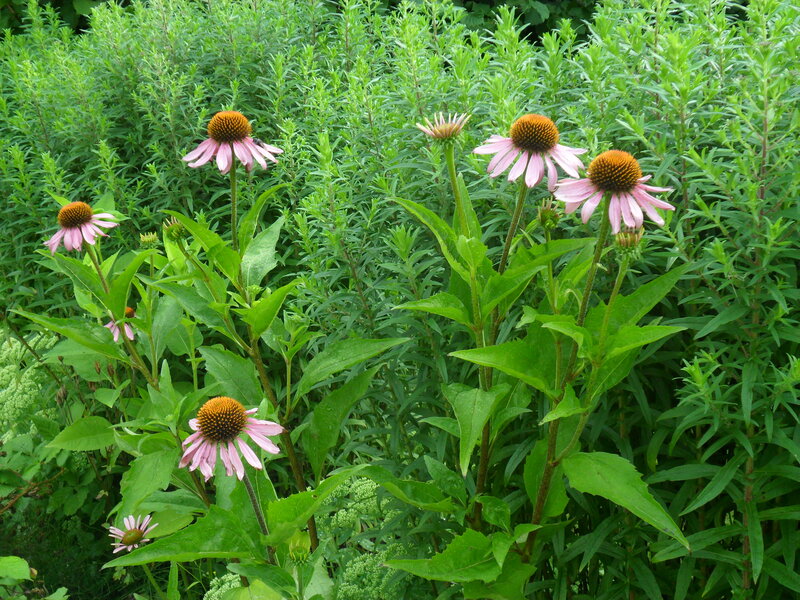 You can read more about the pest here. 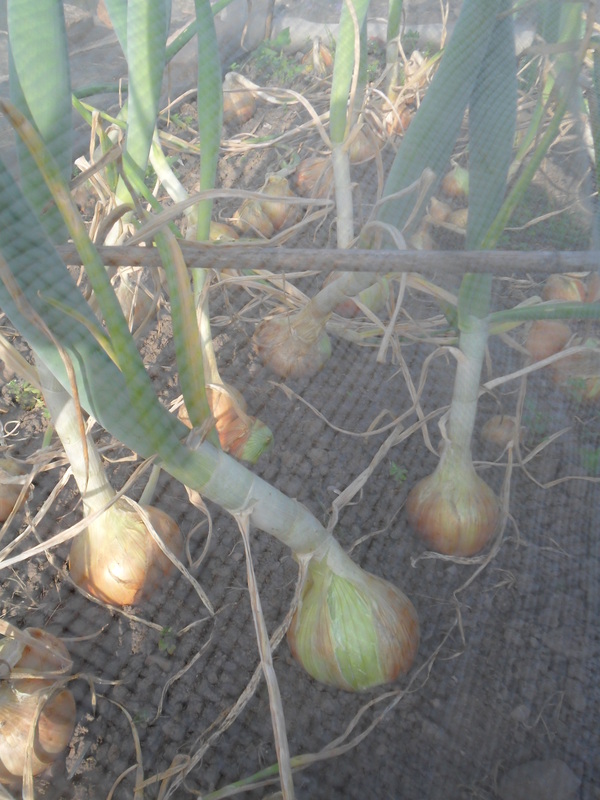 I will use my over-wintering onions first, as they don’t store for as long as summer onions do. 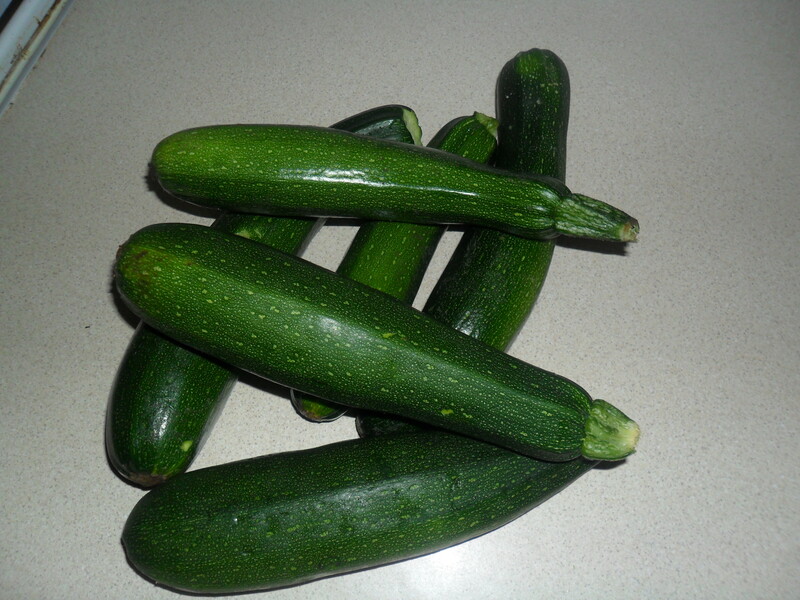 I usually chop them up and freeze them, ready to use when my summer onions have ran out. 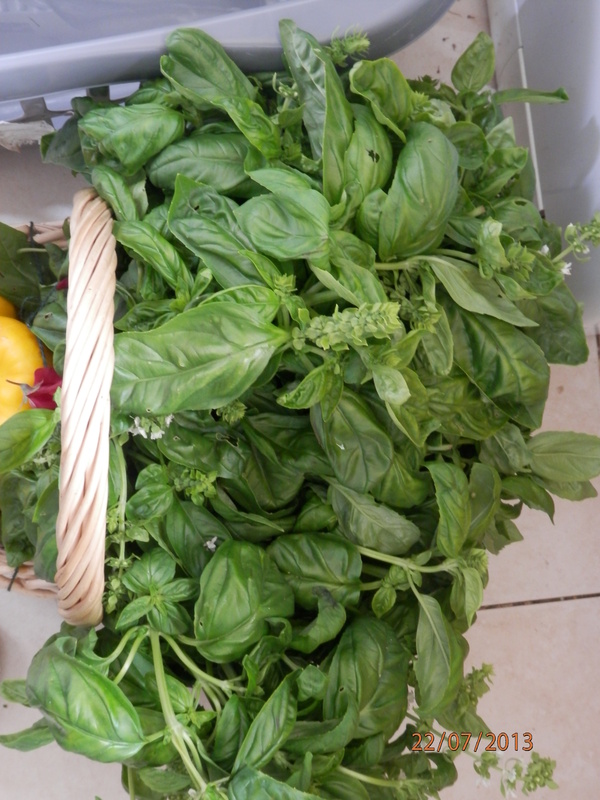 However, as it’s been such a good growing year, I am struggling with space in my freezers. 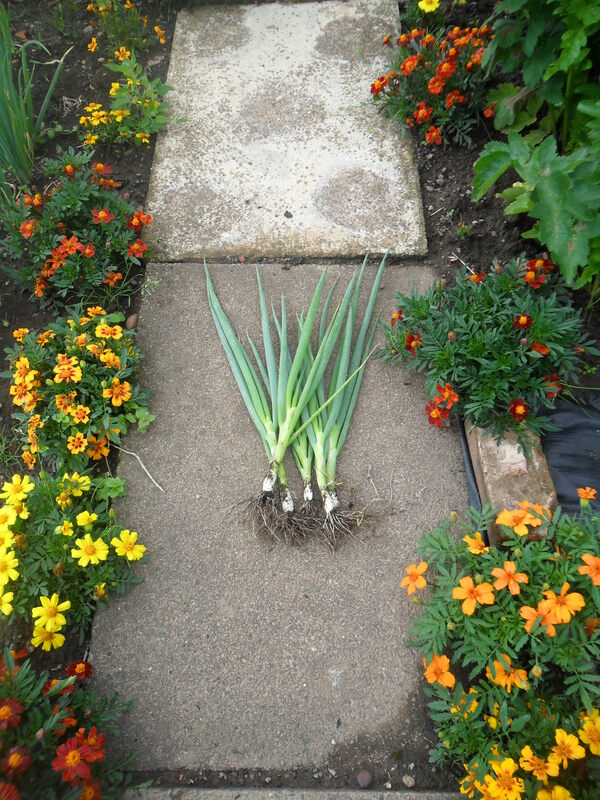 Yesterday, I also managed to pull up my summer onions. 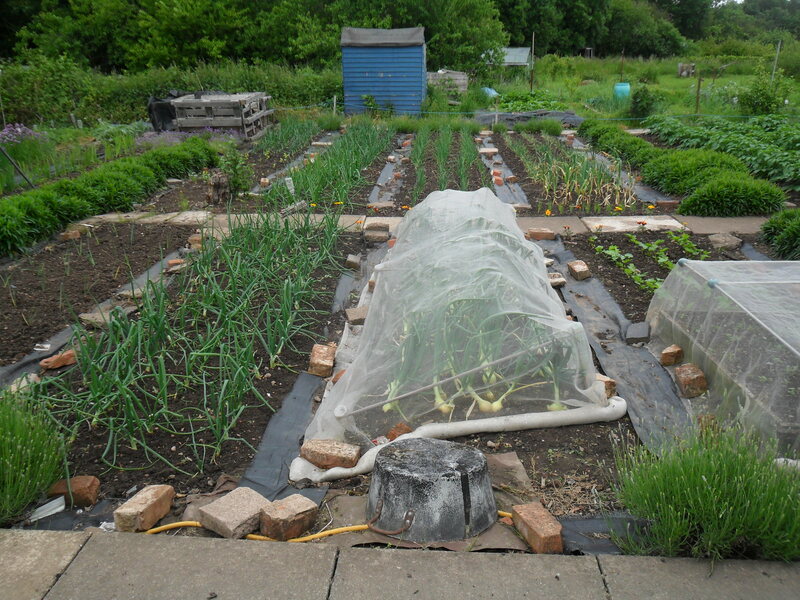 I planted a variety of onions this year so I could compare them and find out if one variety was more resistant to the allium leaf miner than the others, as my summer onions also suffered badly last year from this new pest. 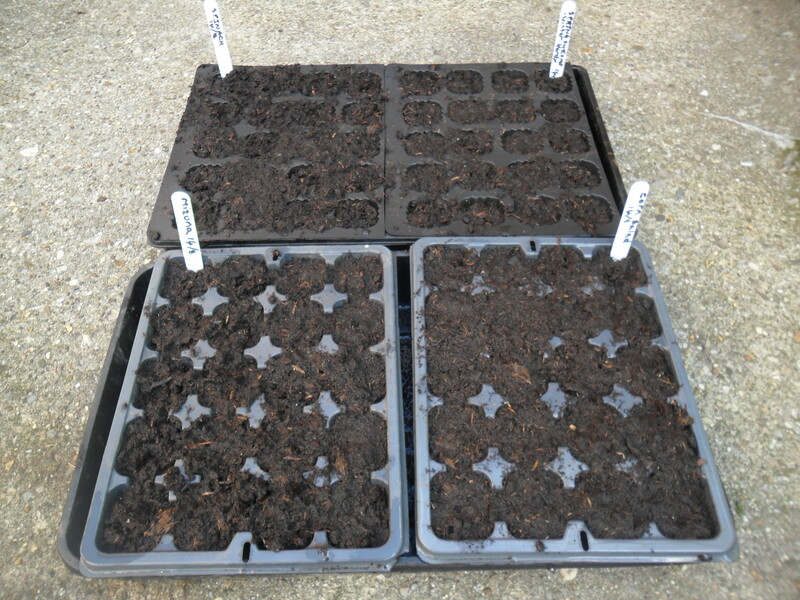 I sowed some seeds back in January called ‘Bedfordshire Champion‘ and in March I planted two different varieties of onions sets, one variety called ‘Sturon‘ and another called ‘Turbo‘. Incidentally, both of these onion sets have been awarded the RHS Award of Garden Merit (AGM). I didn’t suffer very badly this year at all with the allium leaf miner, even though my summer onions weren’t covered in environmesh. However, a few onions were affected on all three varieties, so I can safely assume that the allium leaf miner is not fussy about which onion variety it chooses and it didn’t make a difference whether the onion was grown from a seed or sets. I don’t know yet which onion I prefer, as I need to taste them first and I would like to see how well they all store over the winter. But on first impressions, it’s definately ‘Sturon‘ that has given me the biggest onion. 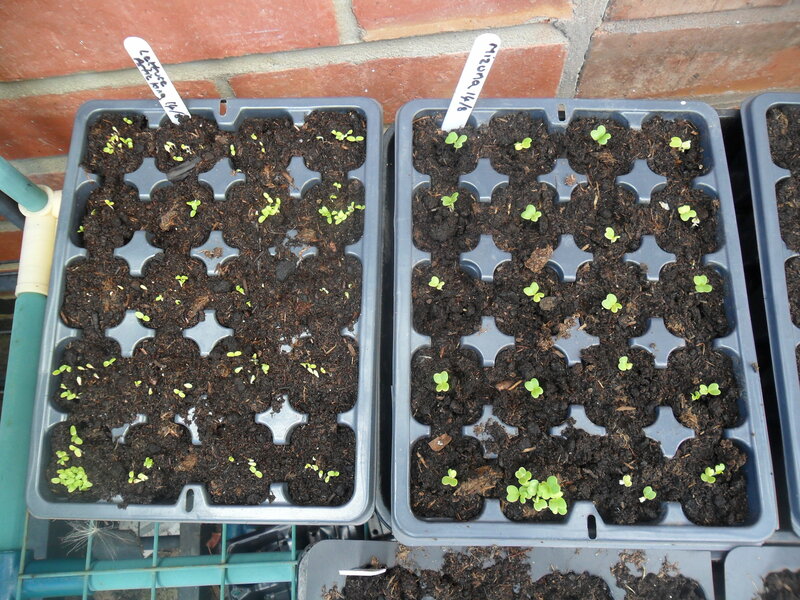 Last week I sowed a green manure called ‘Phacelia’ and I am pleased to say that it has germinated and growing well now. I like using this particular green manure as I don’t need to worry about my rotational beds as it isn’t a brassicca, legume, allium or part of the potato family. 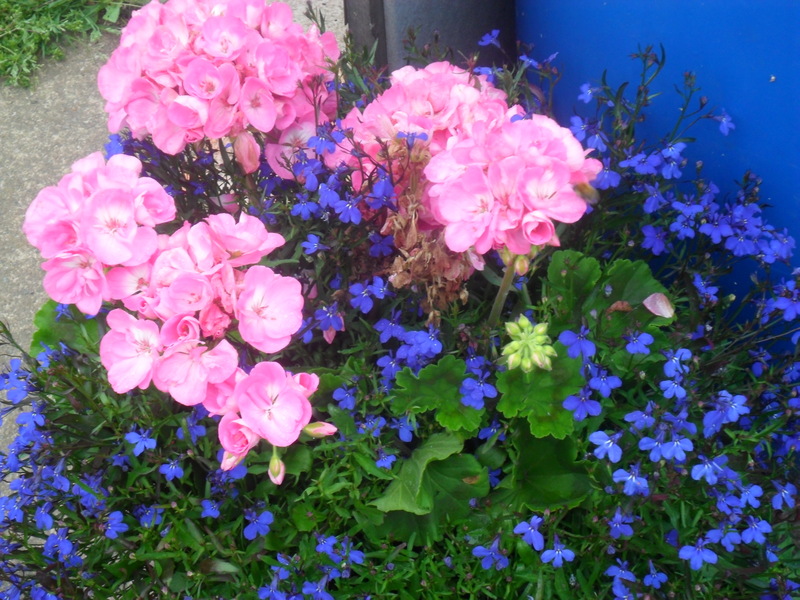 I usually sow it at this time of year in any areas that become available. 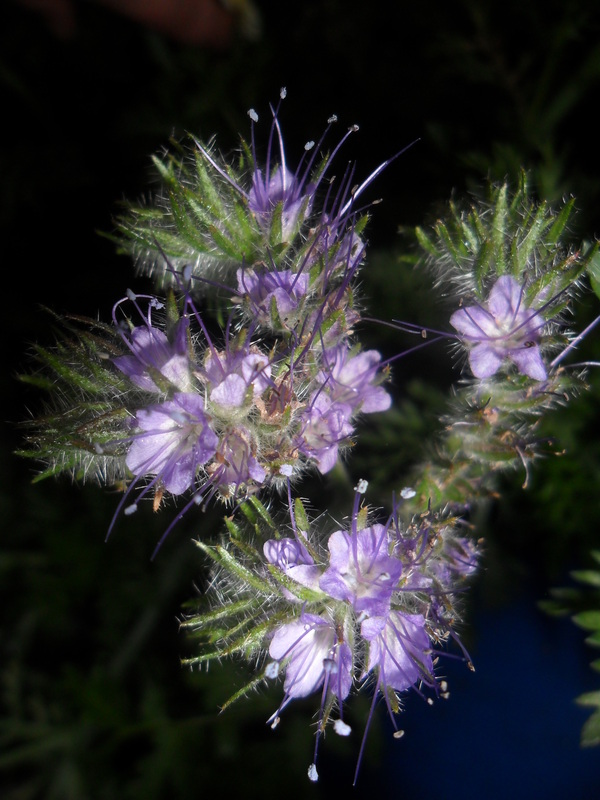 ‘Phacelia tanacetifolia’ is good for sowing between March and September and it takes between one and three months to grow depending on growing conditions. 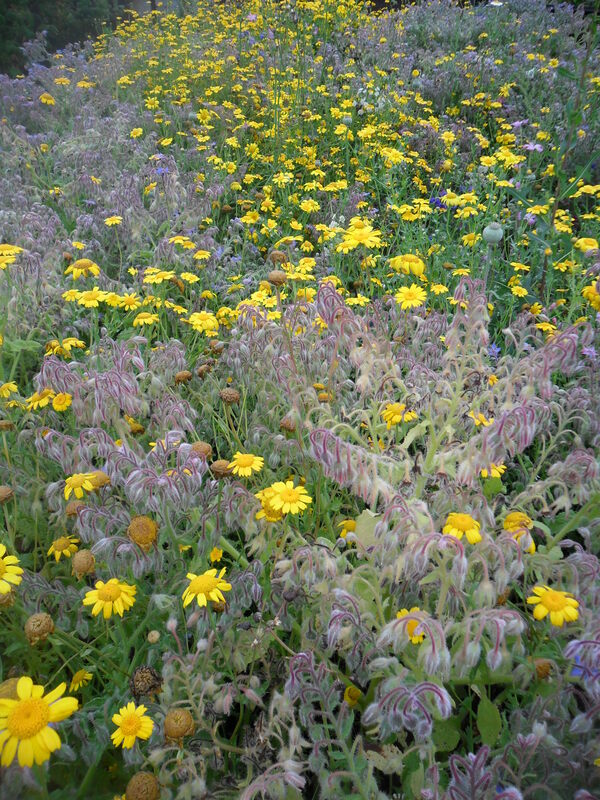 It is a green manure that tolerates most soils, which is why I chose it, as I have a heavy clay soil. If you leave phacelia to flower, it is a beautiful lavender colour that the bees absolutely love, which is why I grow it in my wildflower area. 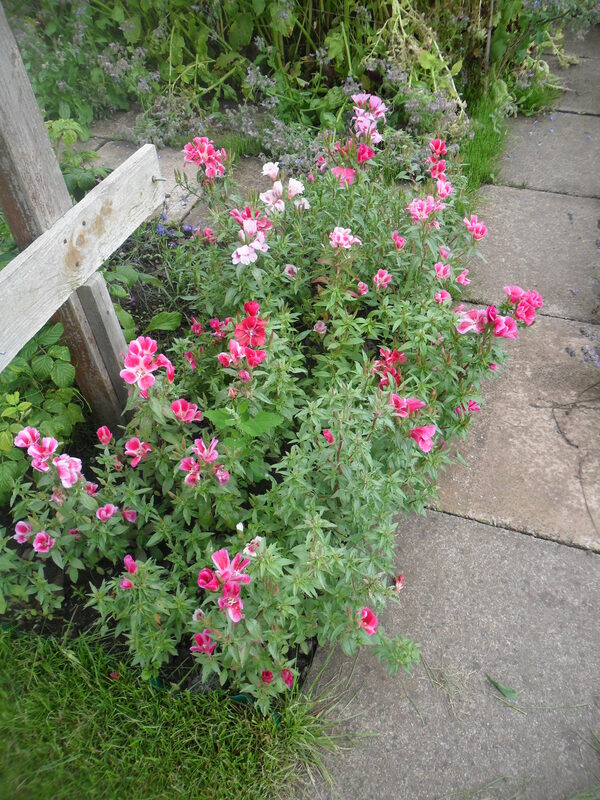 The one drawback is that if you leave it to flower it self seeds like mad. 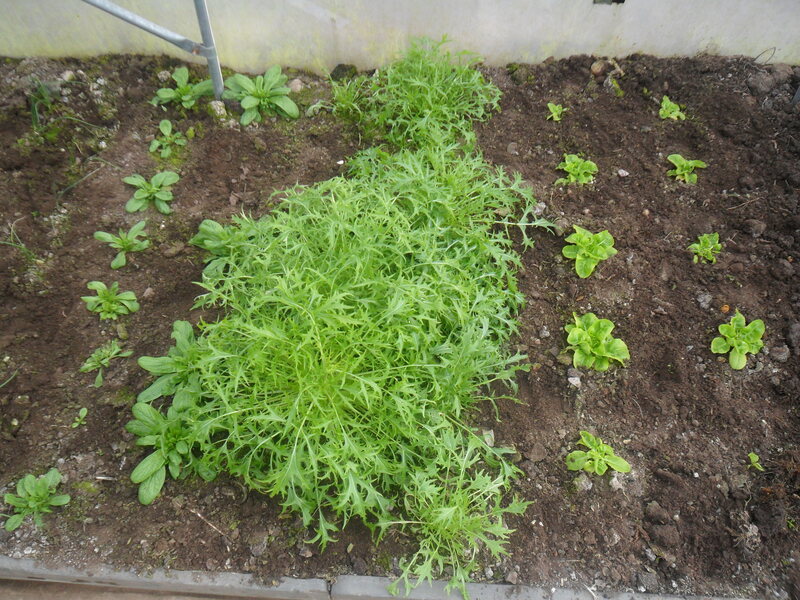 As I am sowing it as a green manure, I will chop it down and fork it in to the soil before it flowers, so it doesn’t grow and become a weed to me next year. 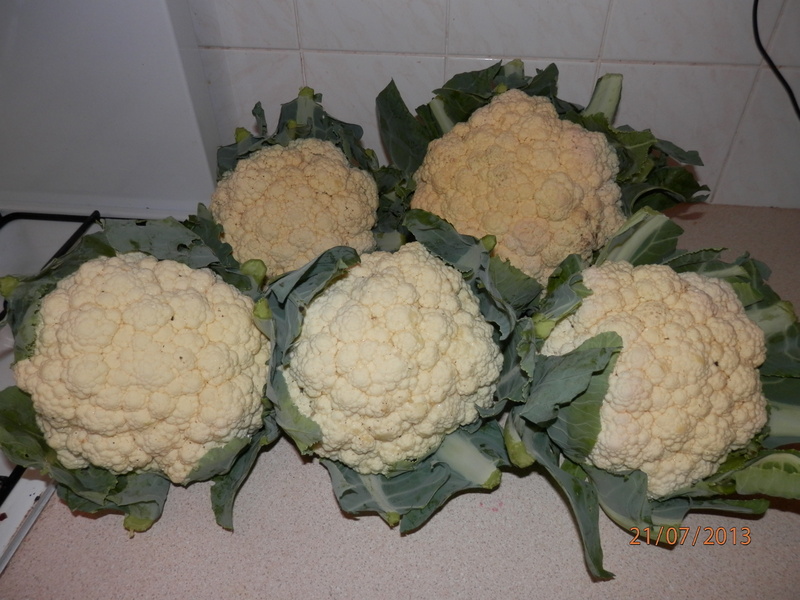 I’ve been busy in my kitchen this week too, blanching and freezing my crops. 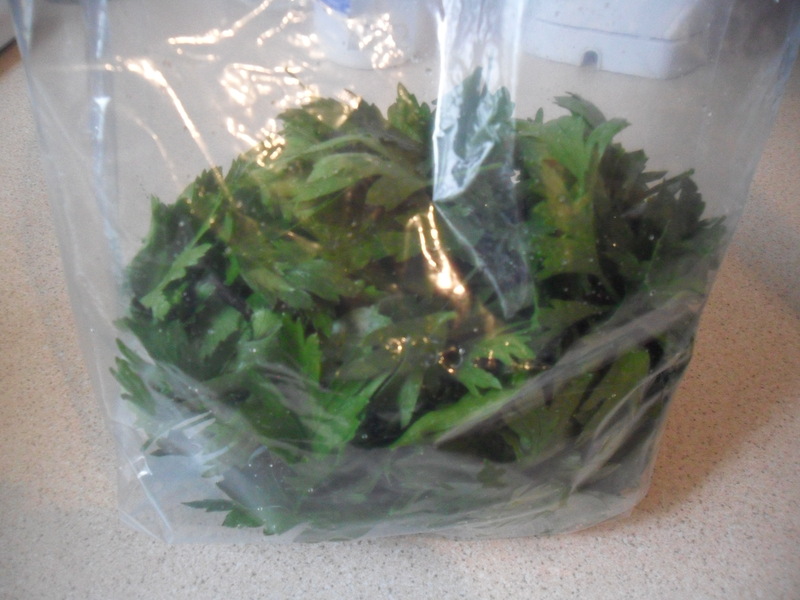 One of the things I have frozen is my parsley. 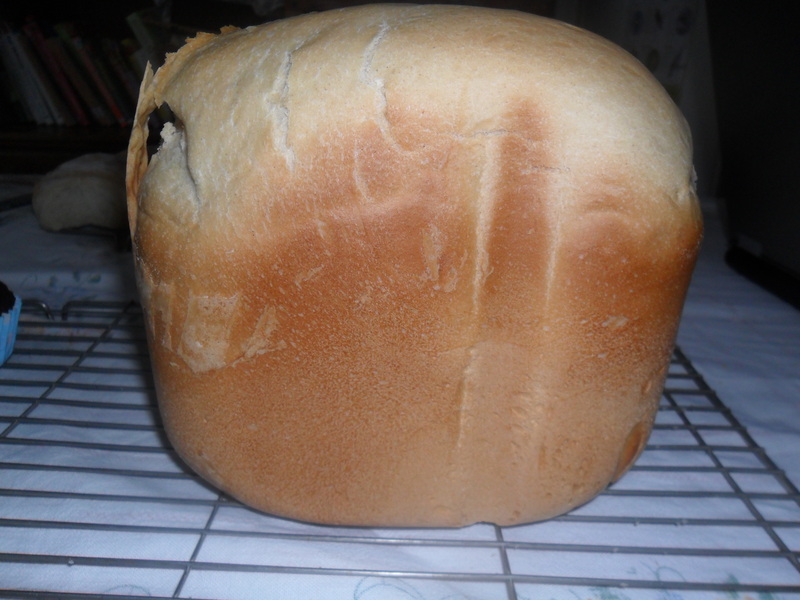 I don’t bother drying it, as I only really use it in a handful of recipes, including homemade garlic bread (you can find the recipe here). 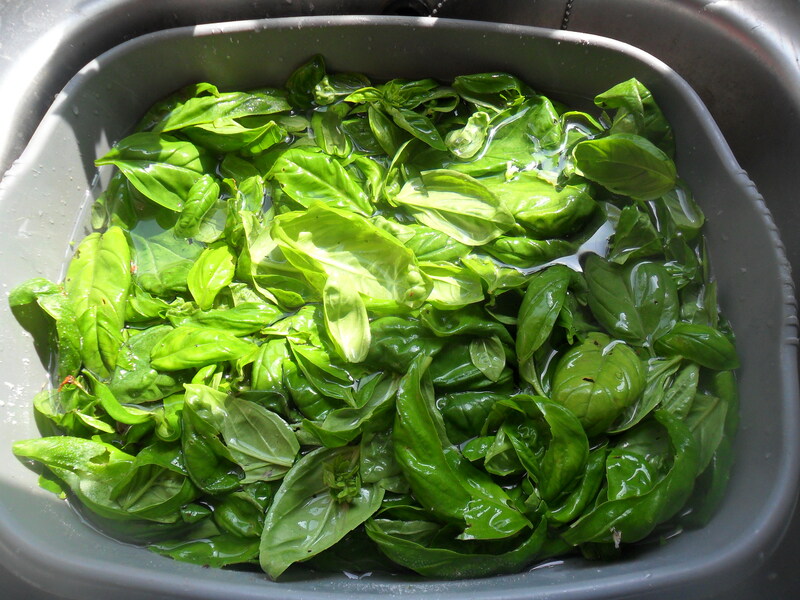 Leave the leaves to drain so the leaves are not too wet when you freeze them. 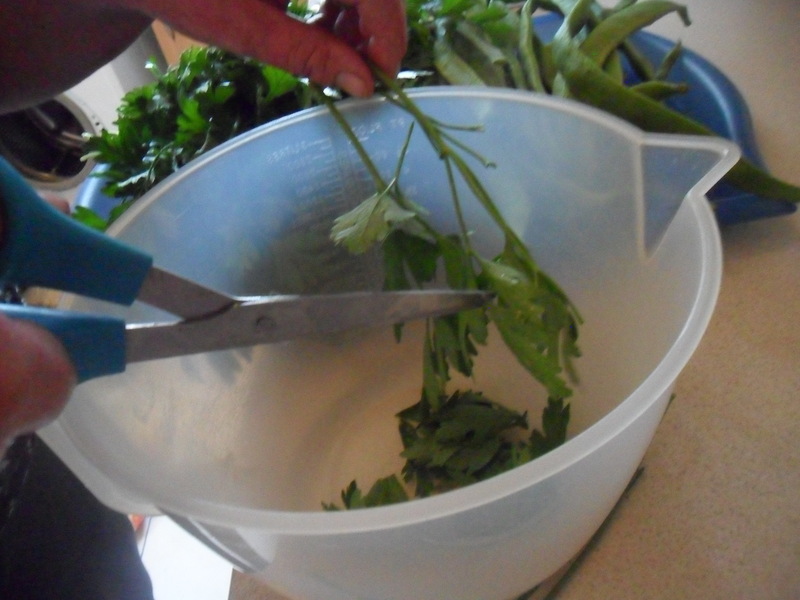 Pop the leaves in a freezer bag and put the bag in your freezer. Use the frozen parsley straight from the bag. 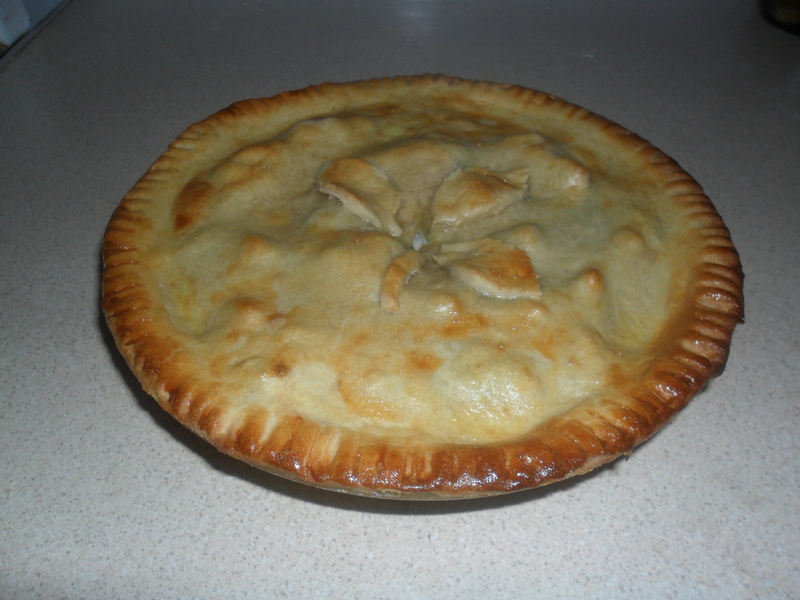 You will find it crumbles easily ready for use when it is frozen. 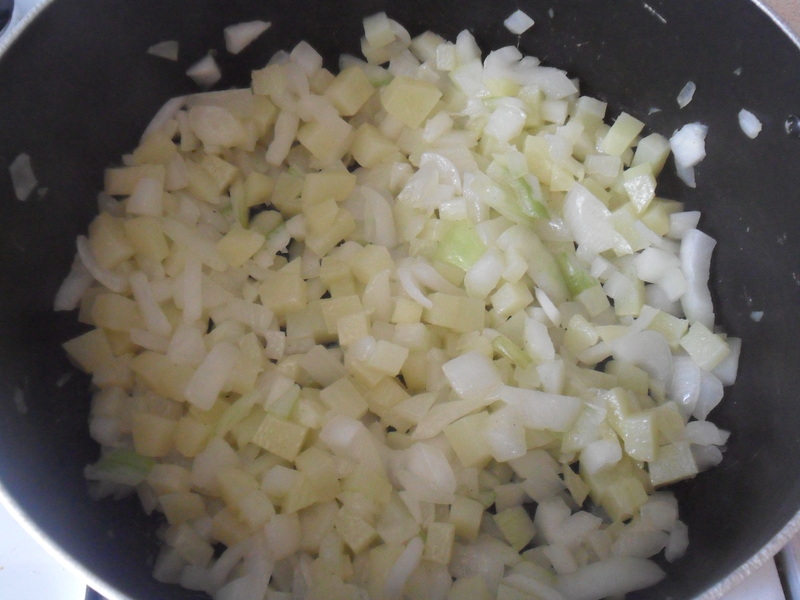 Gently heat the olive oil in a large pan, add the onion and potato and soften for approximately 15 minutes, without it all browning. 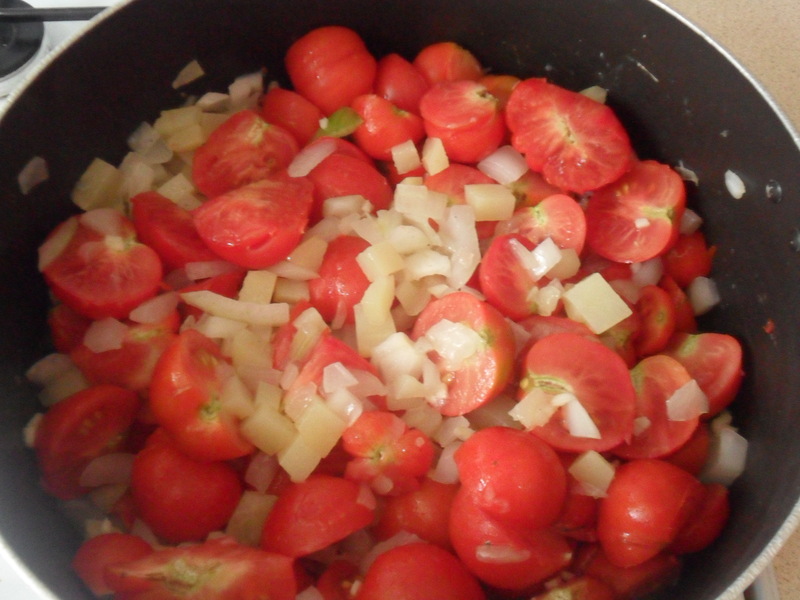 Add the tomatoes and cook for a couple of minutes. 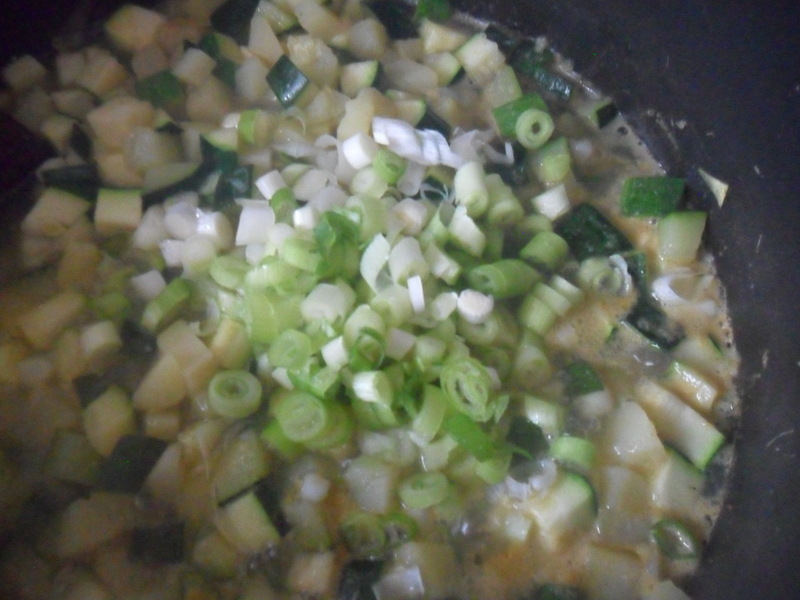 Add the stock, garlic and basil. 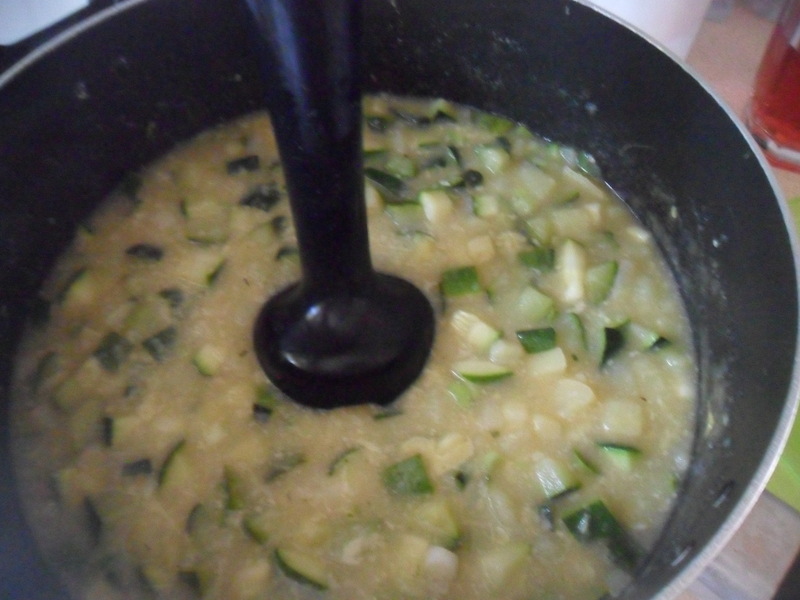 Cover and simmer for 25 minutes. 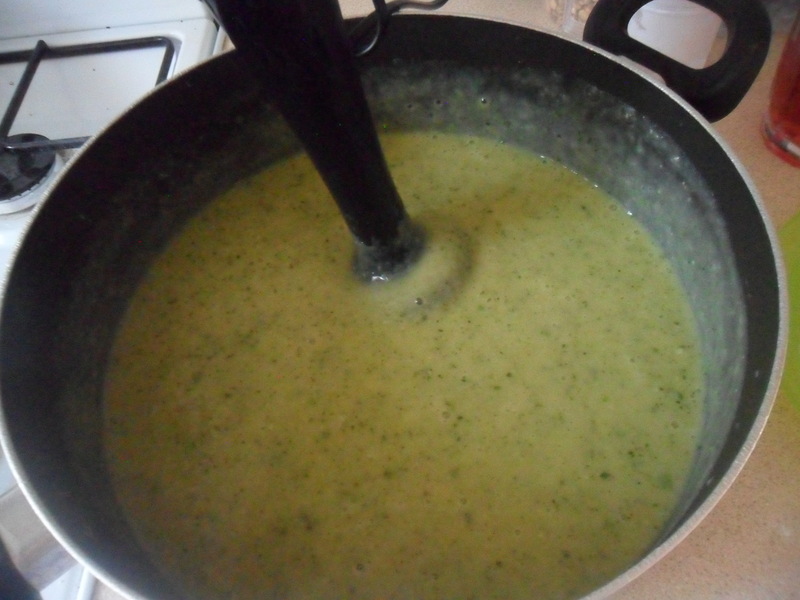 Use a hand blender to blend the soup roughly and then pass the whole lot through a sieve to extract the seeds. 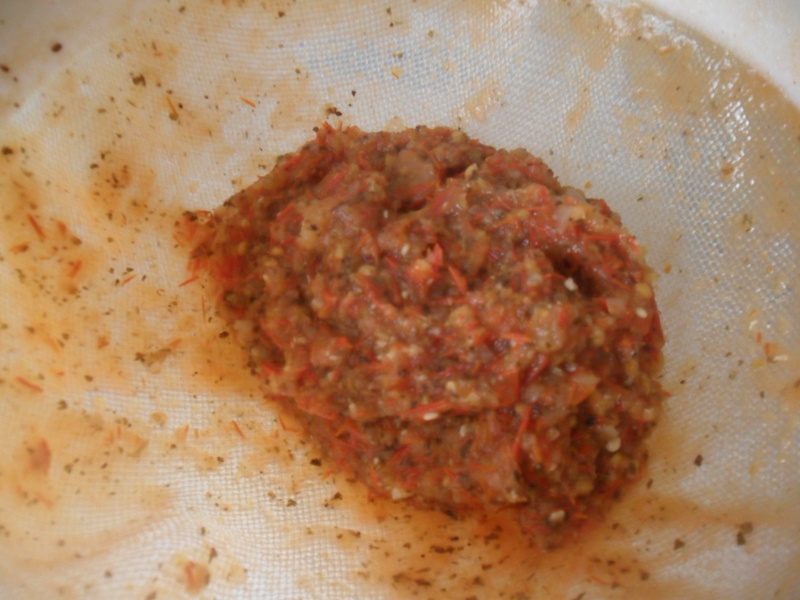 Throw away the contents of the sieve. 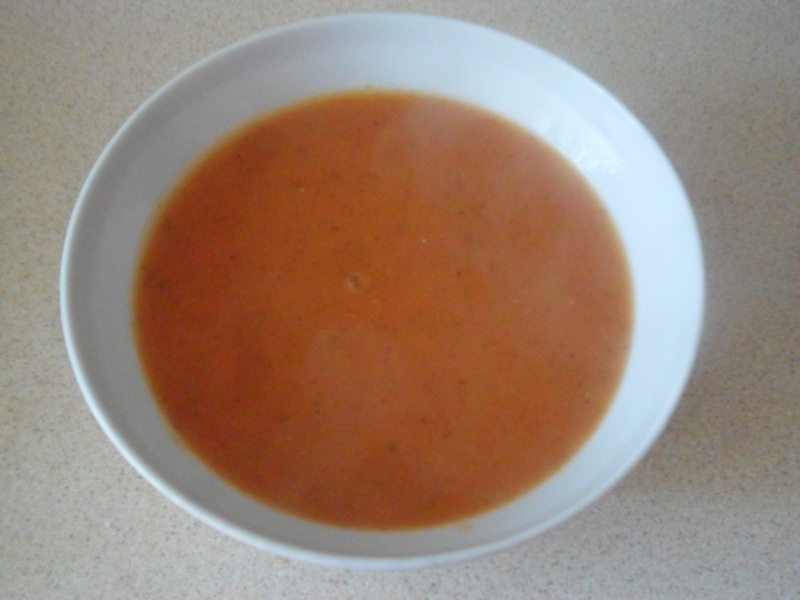 Re-heat the soup and serve. 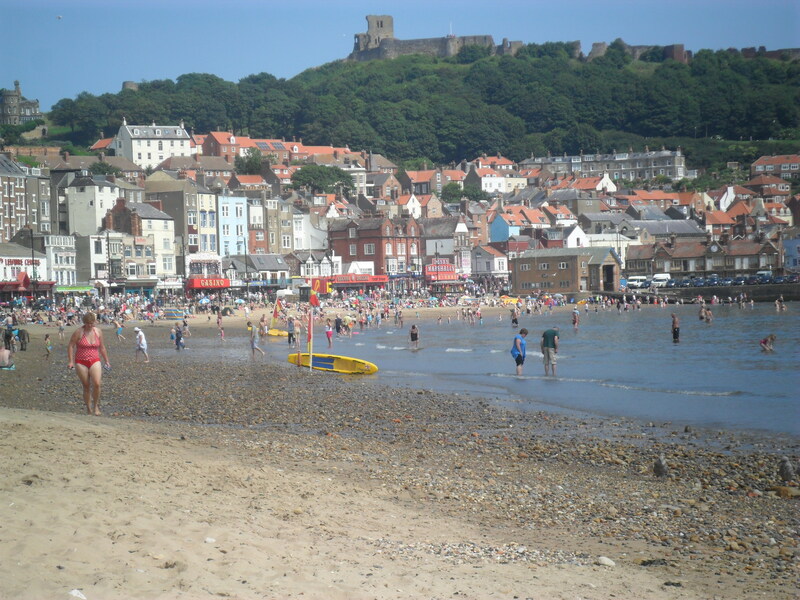 It’s lovely to be back blogging again and I have so much to tell you, but equally I have had a lovely break. 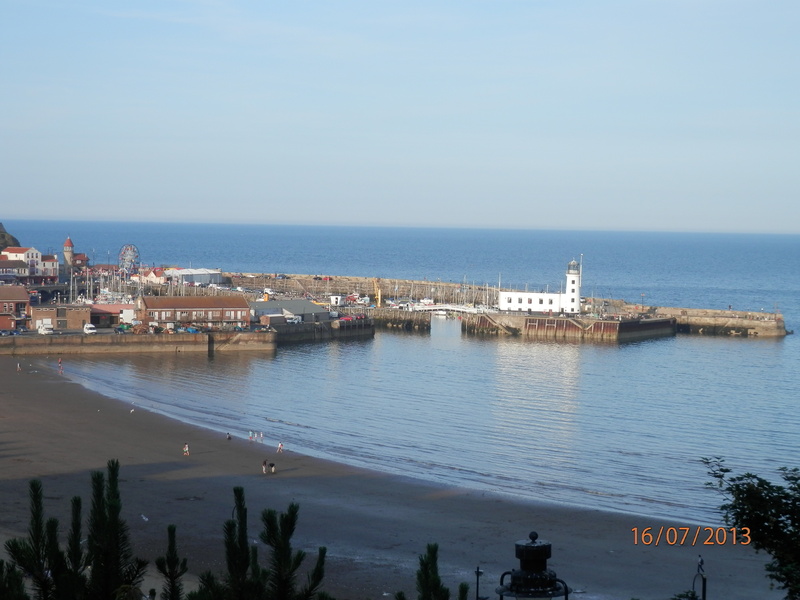 At the beginning of the school holidays we went to Scarborough and had a wonderful time. 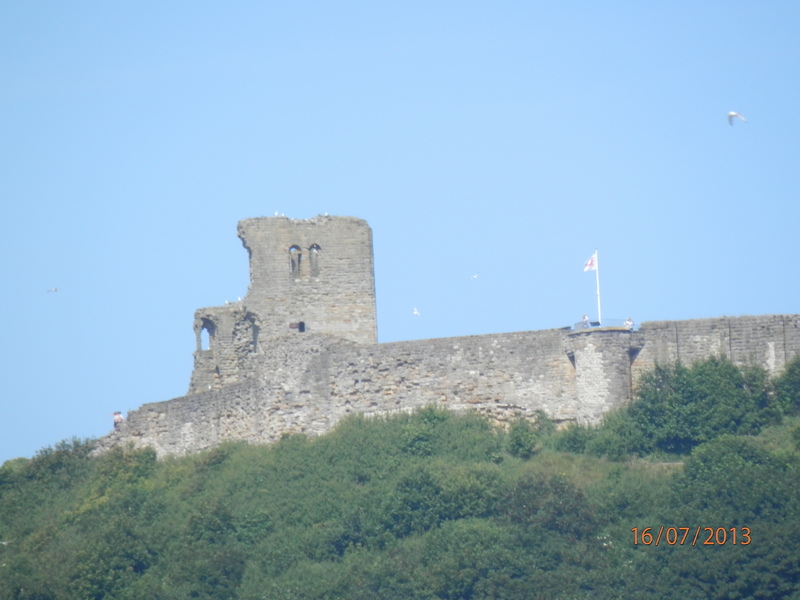 We stopped in a Travelodge again for six nights and it cost us just £230 for two adults and two children with breakfast included…..what a bargain! 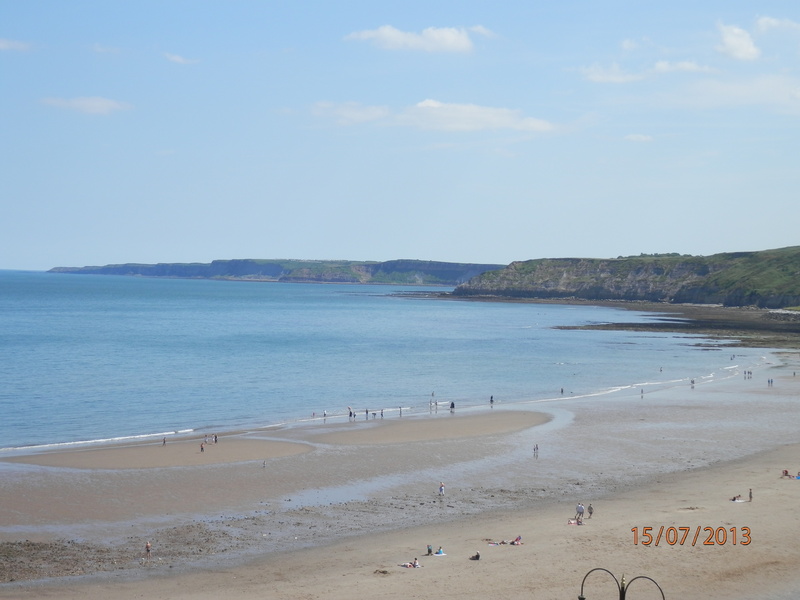 We were so lucky with the weather, as it was really hot the week we were there and we spent every day on the beach. 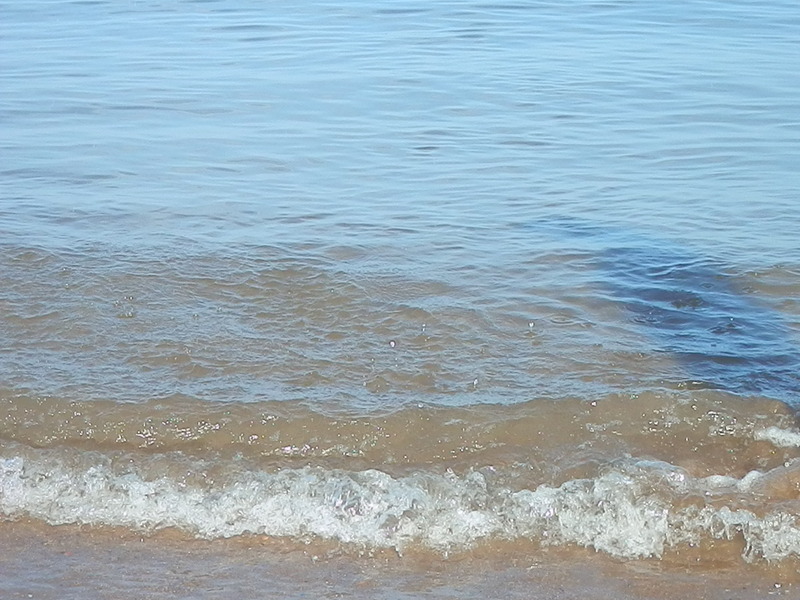 The sea was so calm and clear, we could even see little fishes swimming around in it. With the heat, it felt like we were abroad. 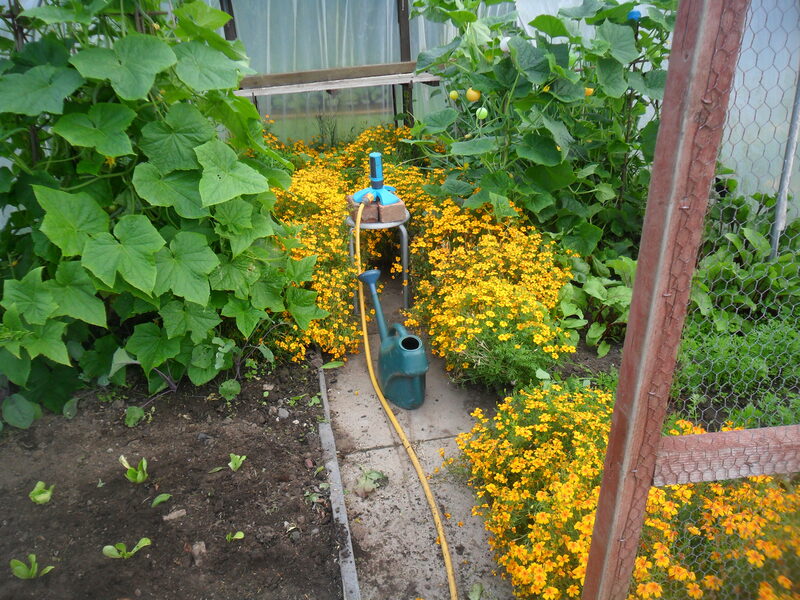 My friend at my allotment watered my polytunnel for me while I was away and he did a grand job, but I must say I was worried about my other crops as it was so hot and I had told him not to bother watering them, but they all seemed to be ok. 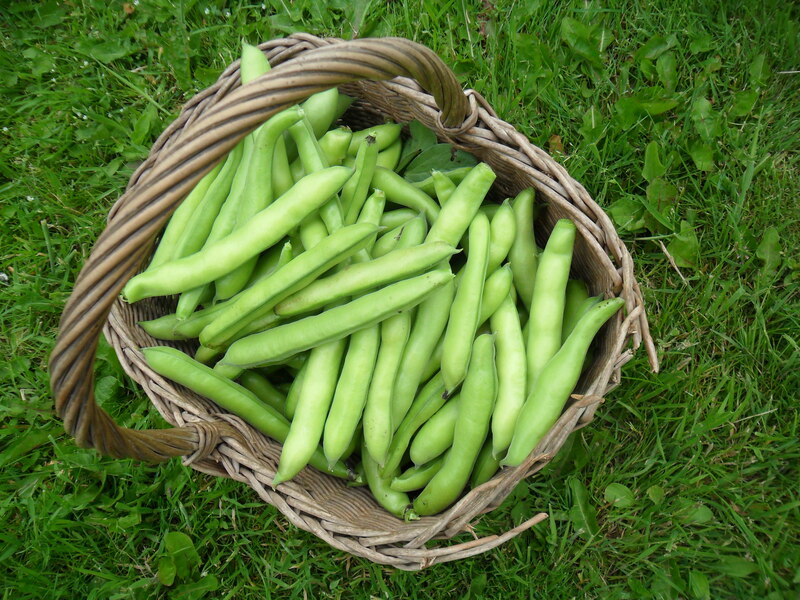 I was very pleased that I had planted my runner beans on top of a runner bean trench, that I had filled with old peelings, etc. 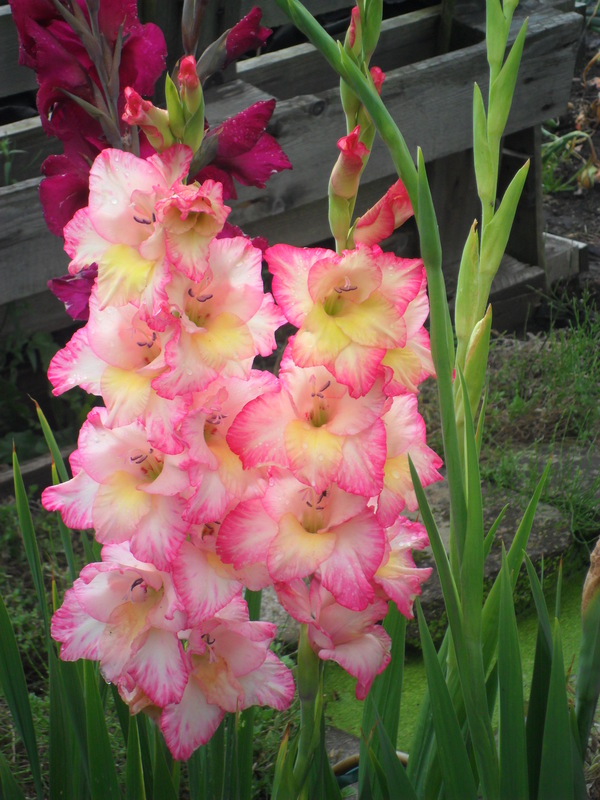 during the winter, as this would certainly have helped to retain the moisture. 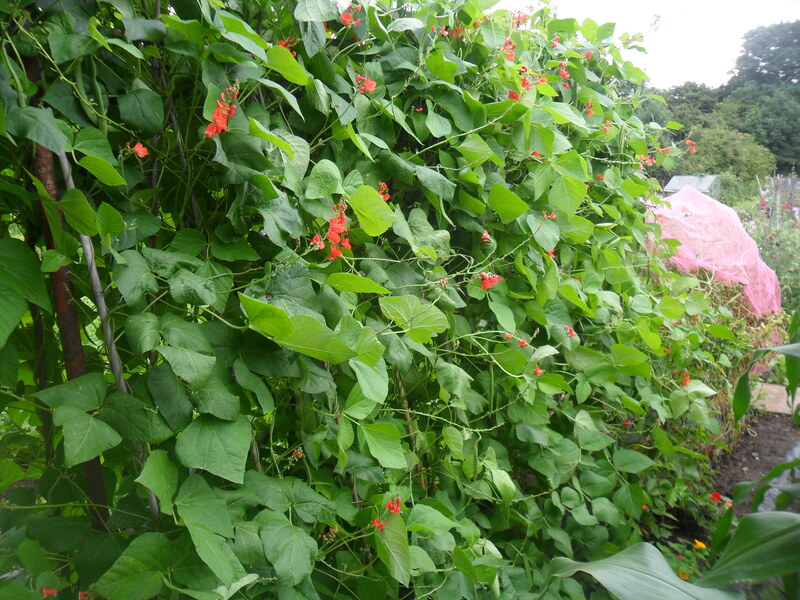 You can read how I made my runner bean trenches here. 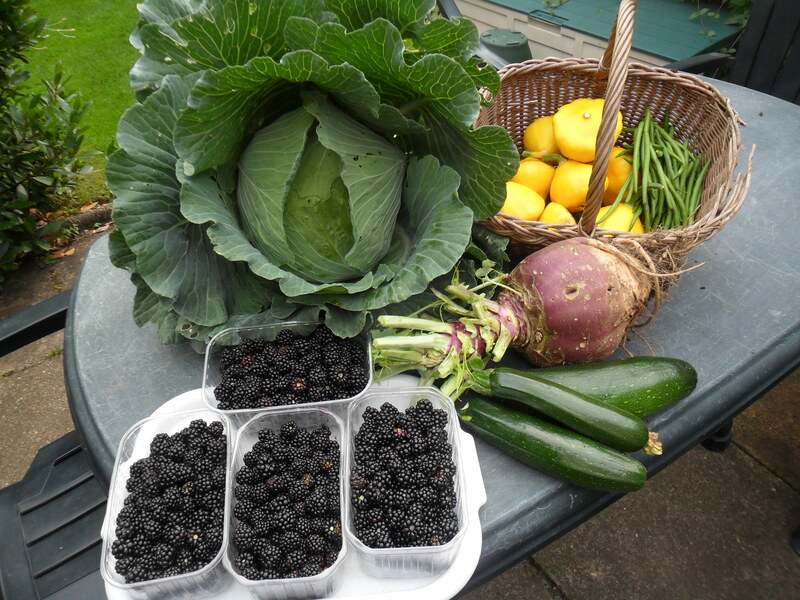 Since we came back from our holiday I have been frantically harvesting all my crops at the allotment. What a difference a year makes! 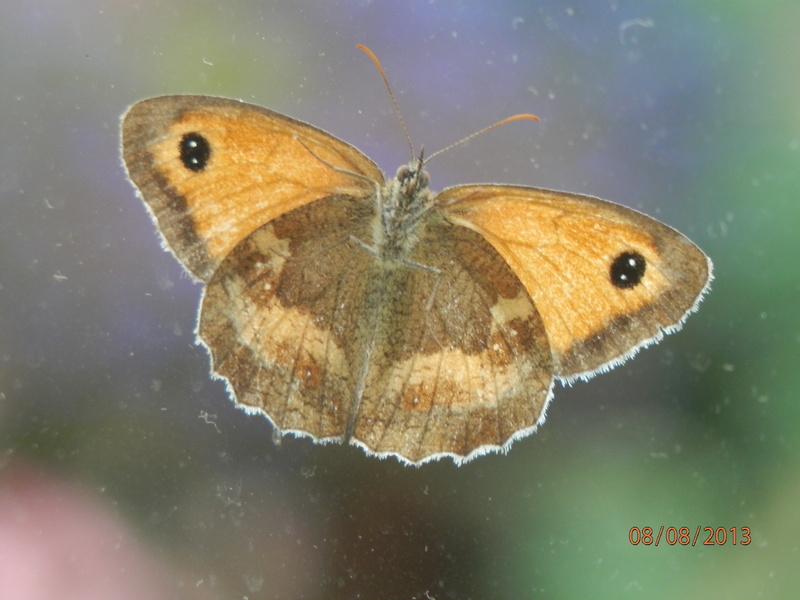 This time last year it was really wet and crops were struggling to grow, but this year is a bumper year for most things, though I have found that some things are still behind due to the cold spring we had e.g. 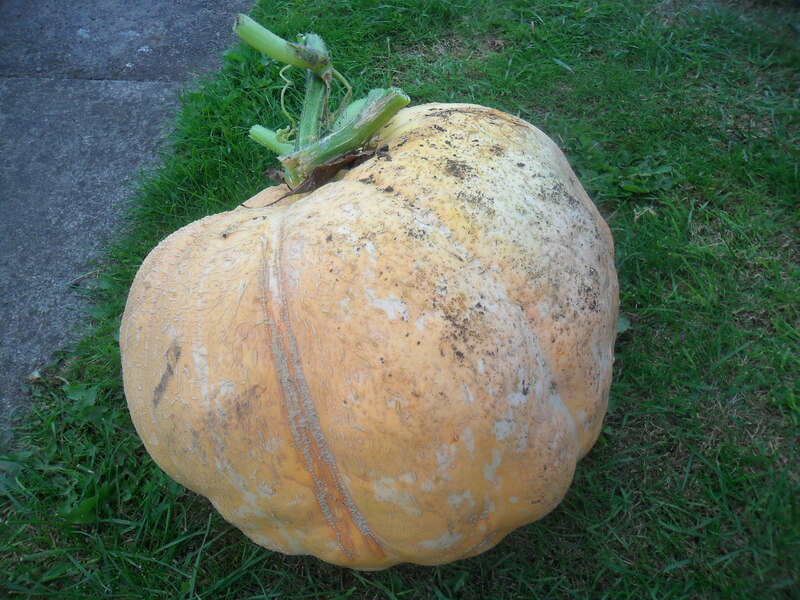 pumpkins, butternut squashes and my early apples. I noticed my early potatoes did have a lot of slug holes again, though they can still be used. 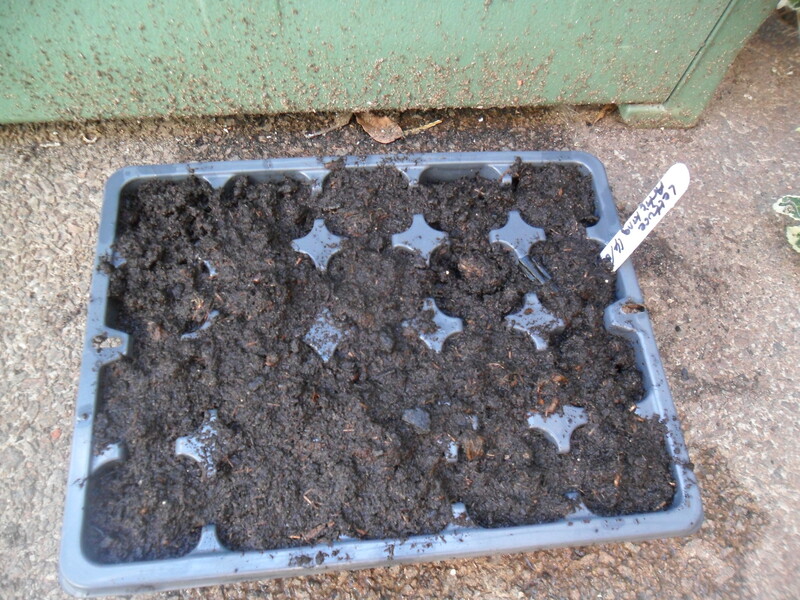 I wonder if there were so many slugs around in the soil after last year, that we are bound to see lots of holes? 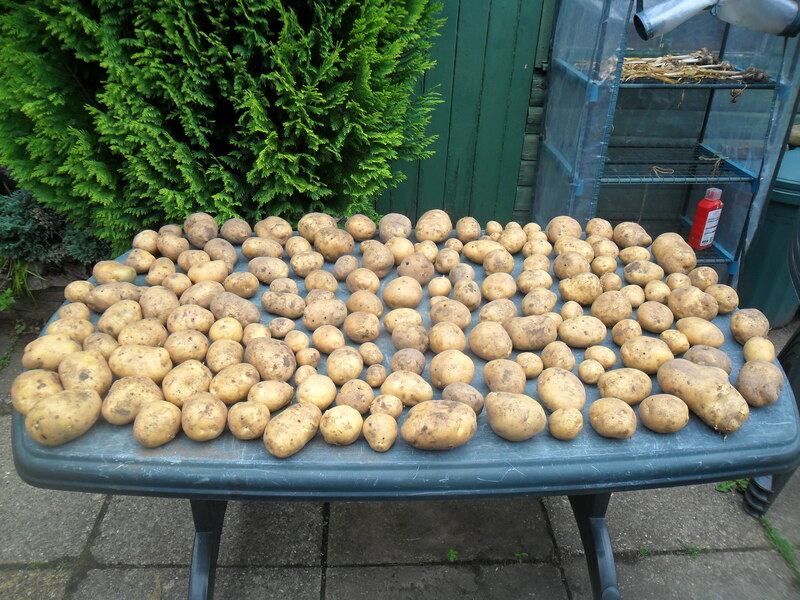 I would love to hear how your potatoes are and if your earlies have also suffered from slug holes? I still have so much to share with you, but I think I better finish for today. 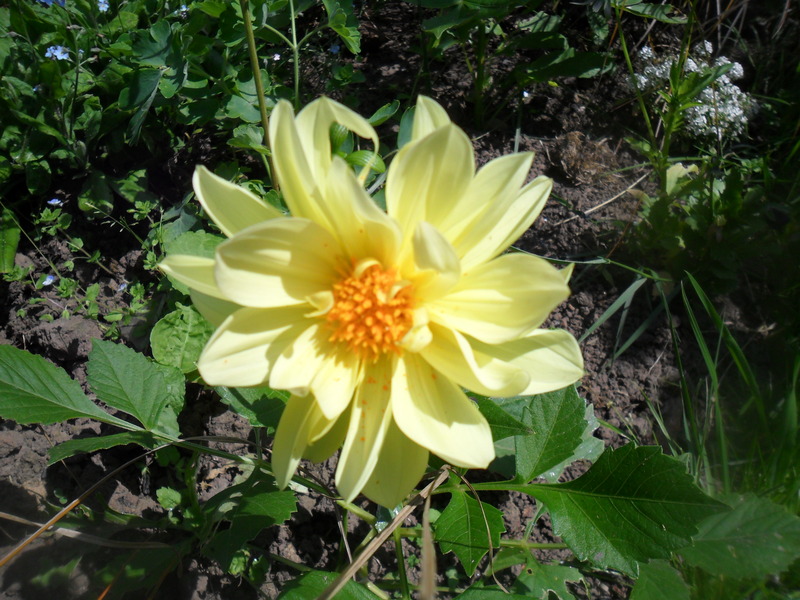 I really hope you have enjoyed reading my blog. I will be back on Monday as usual.